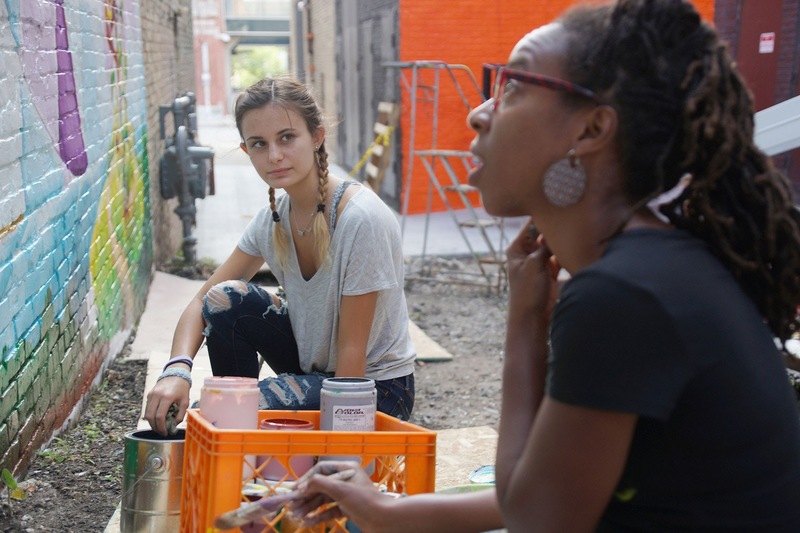 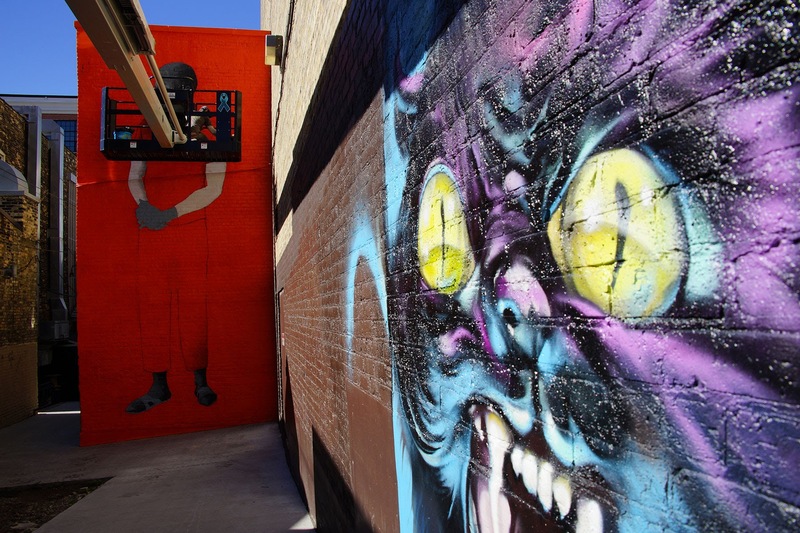 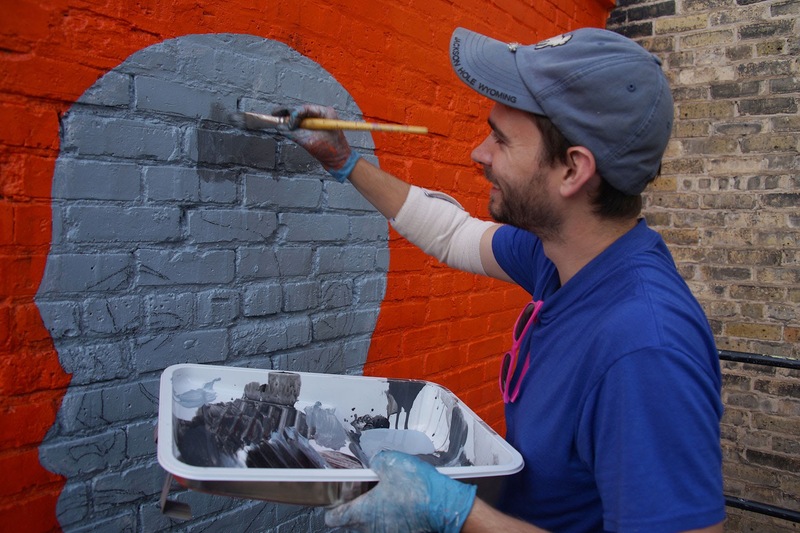 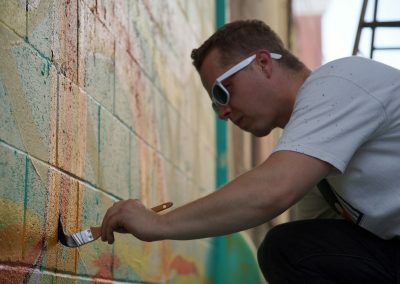 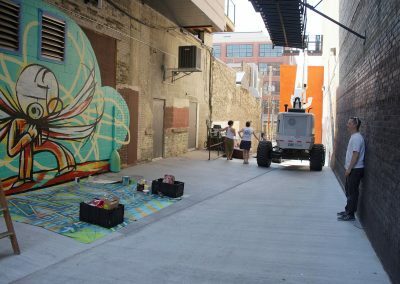 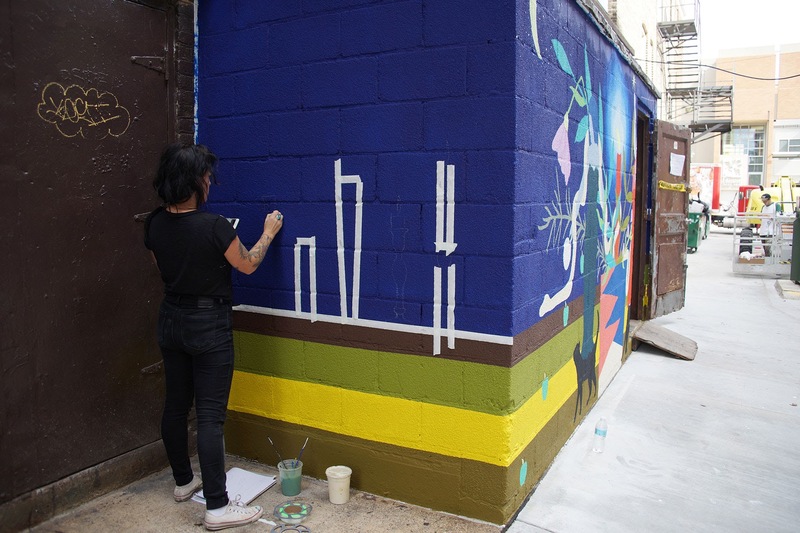 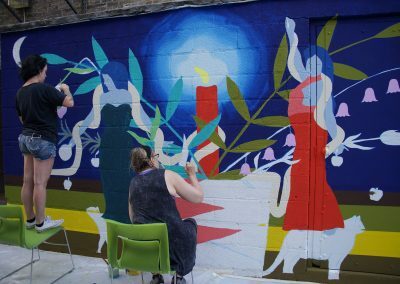 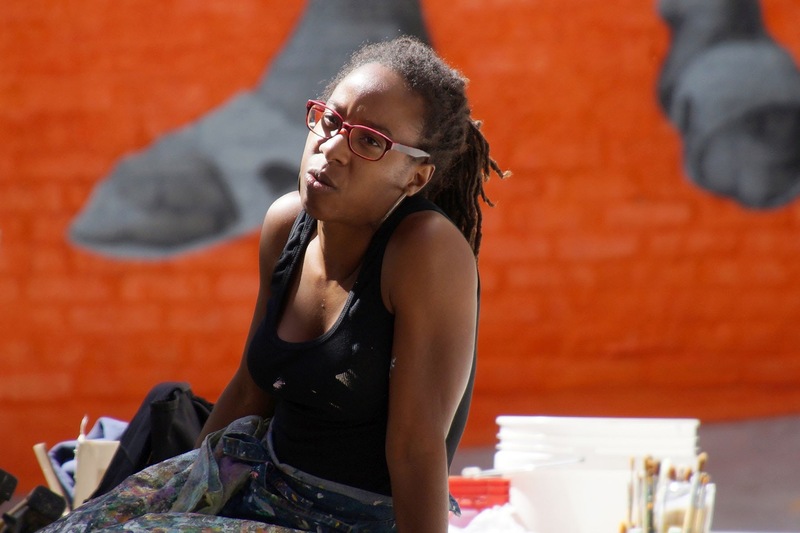 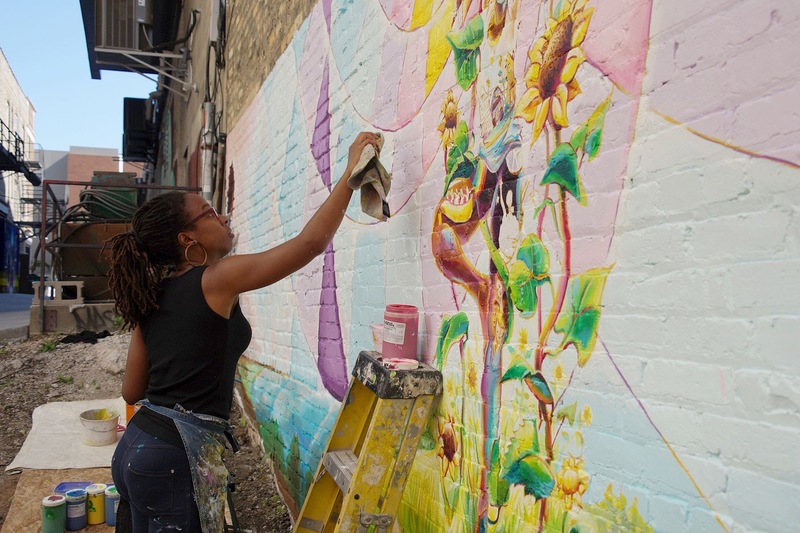 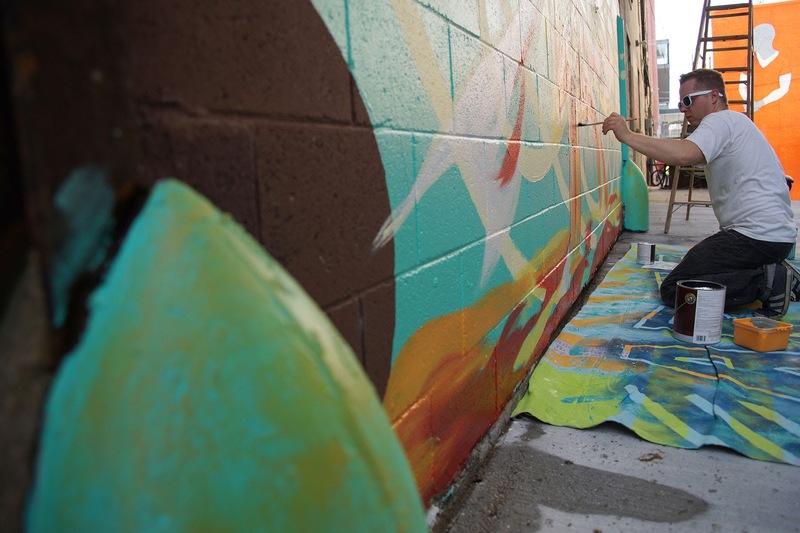 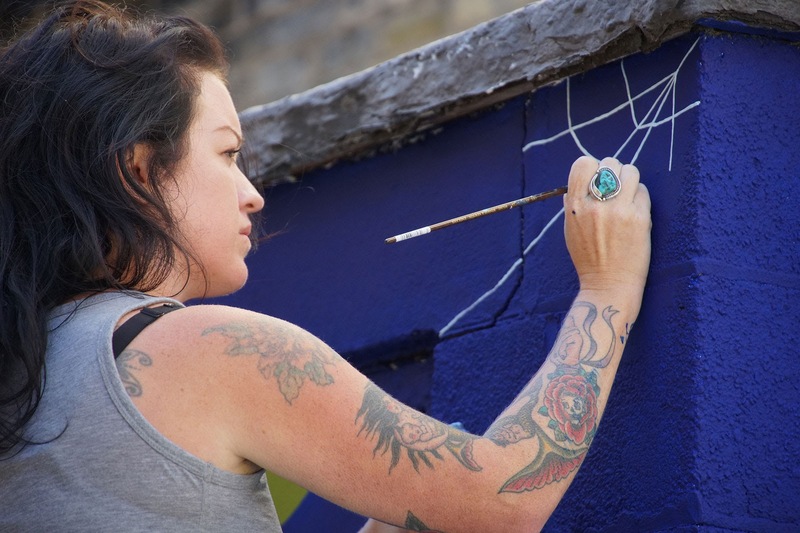 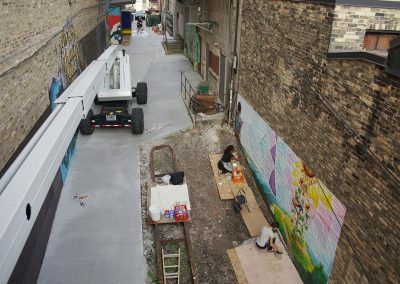 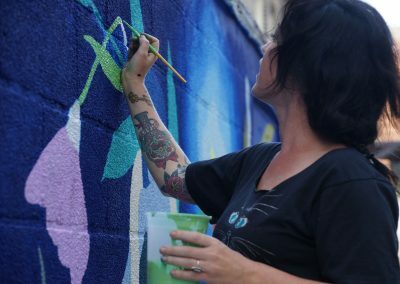 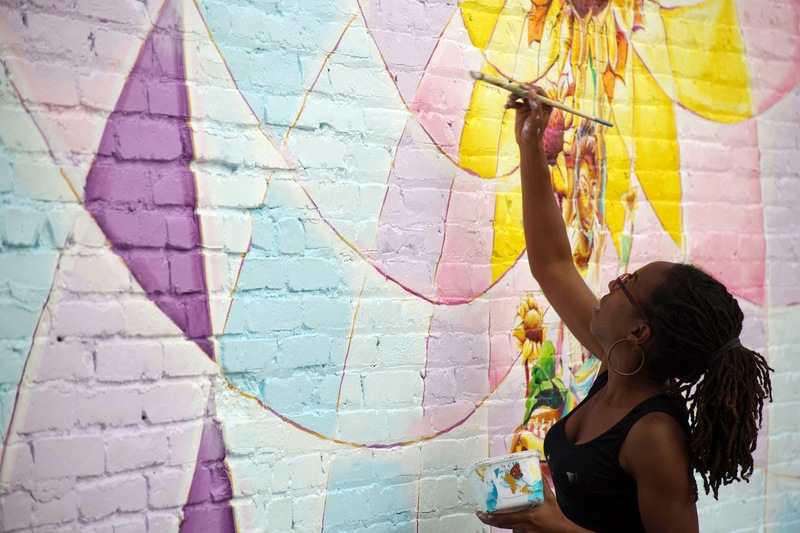 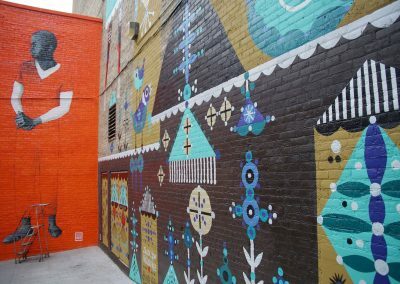 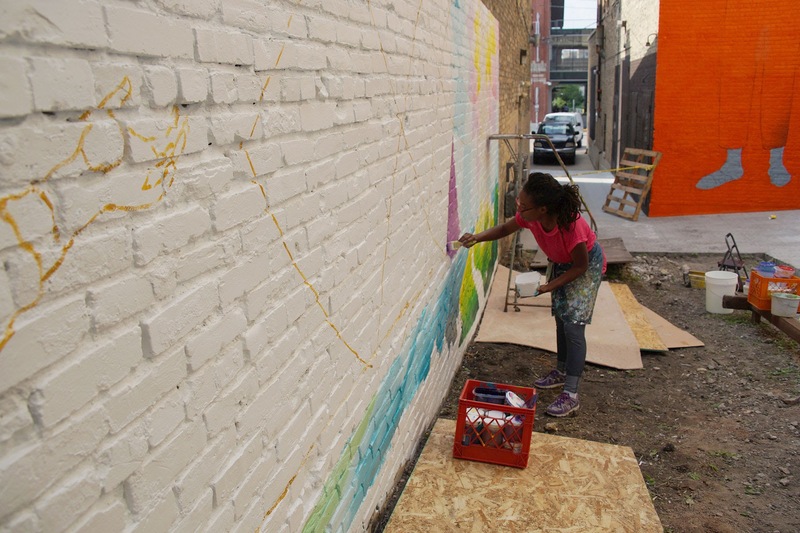 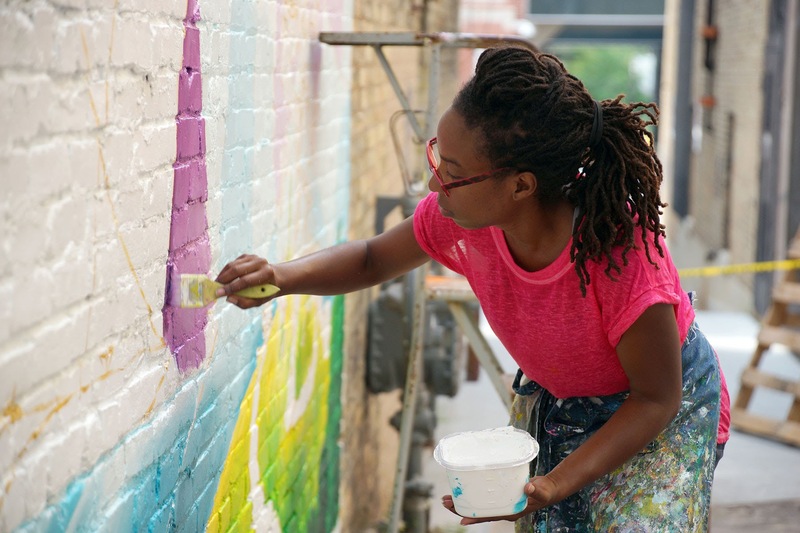 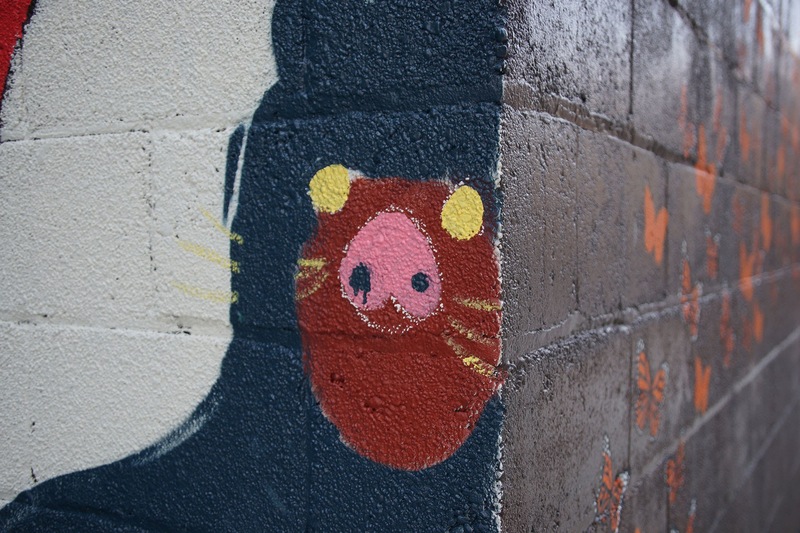 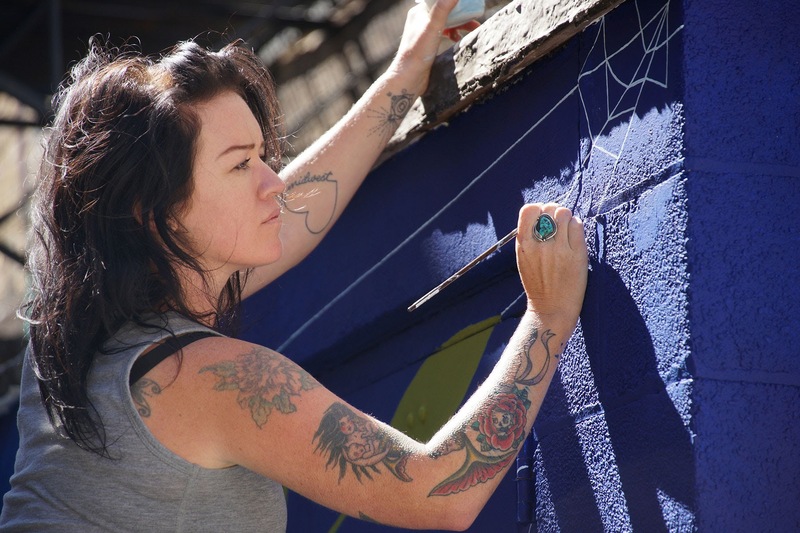 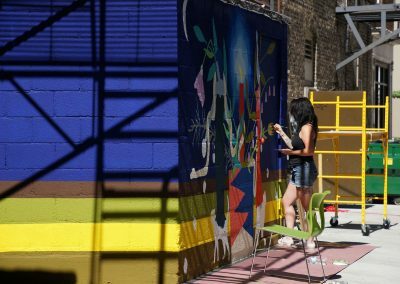 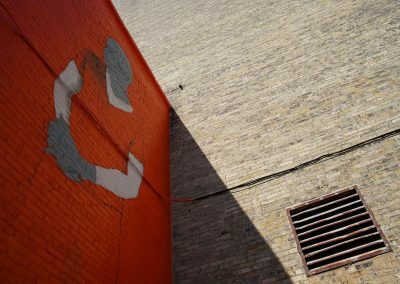 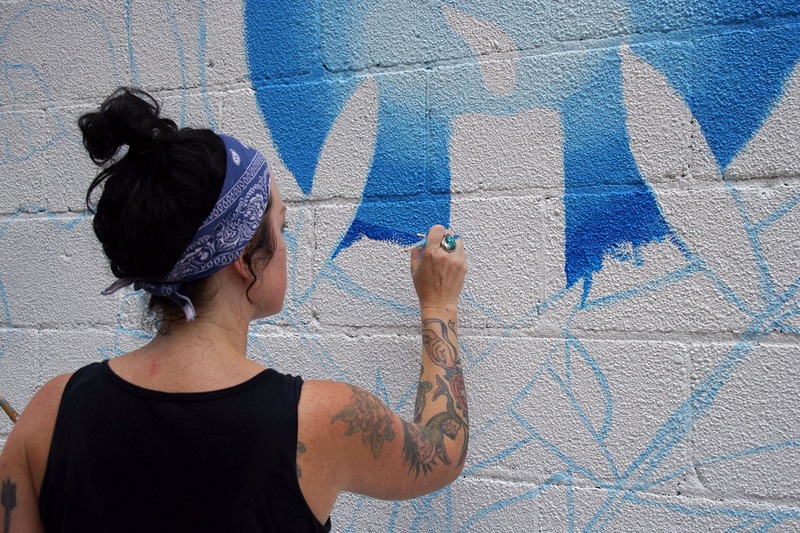 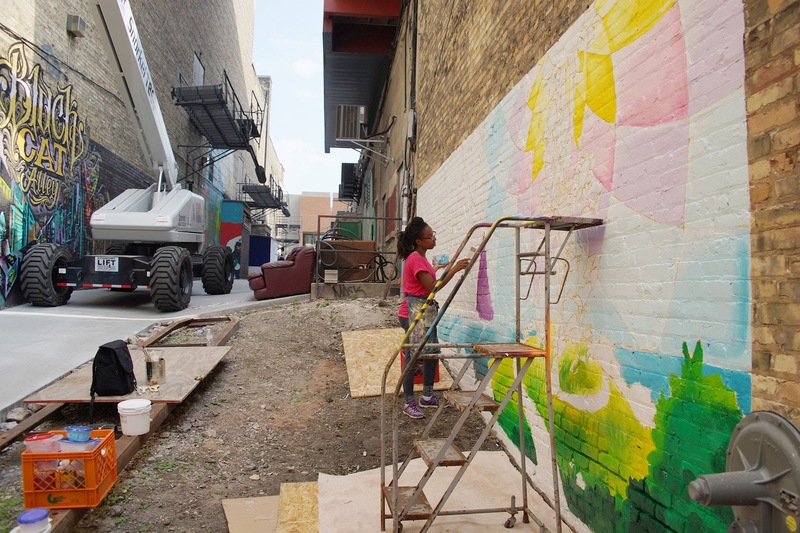 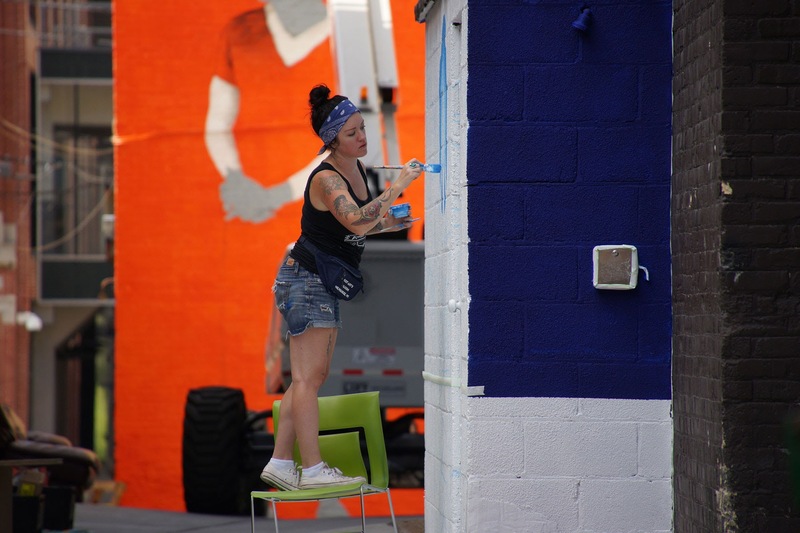 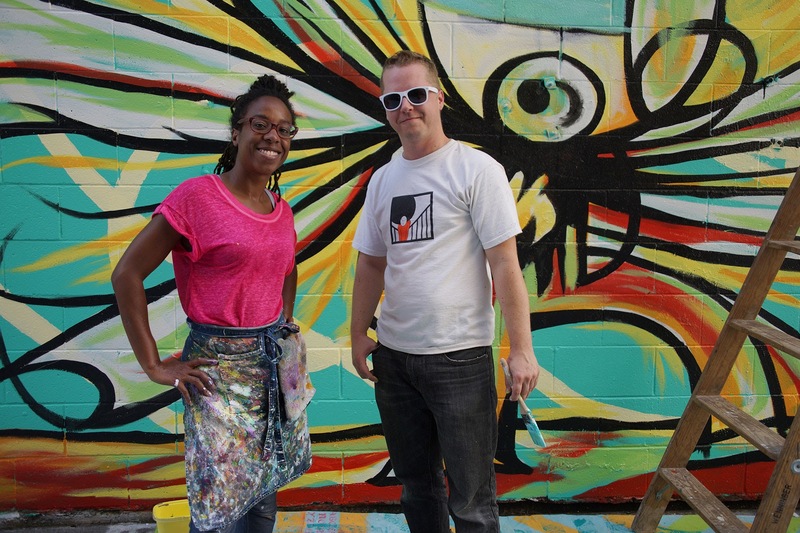 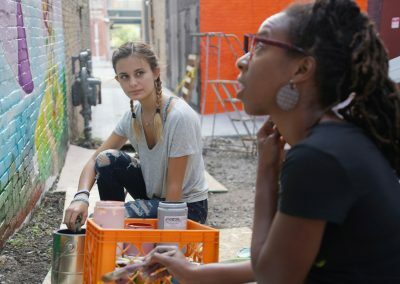 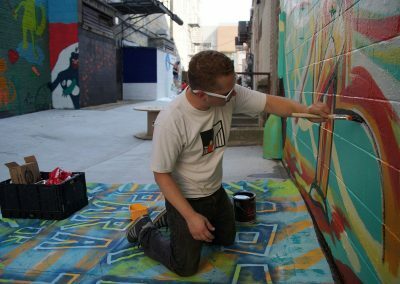 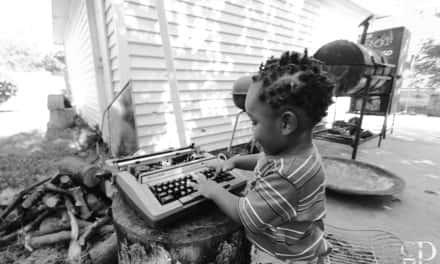 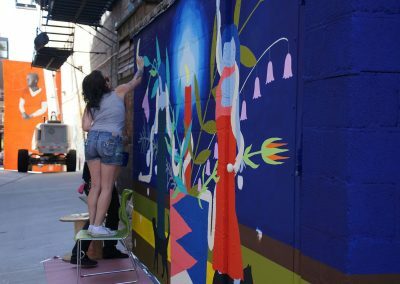 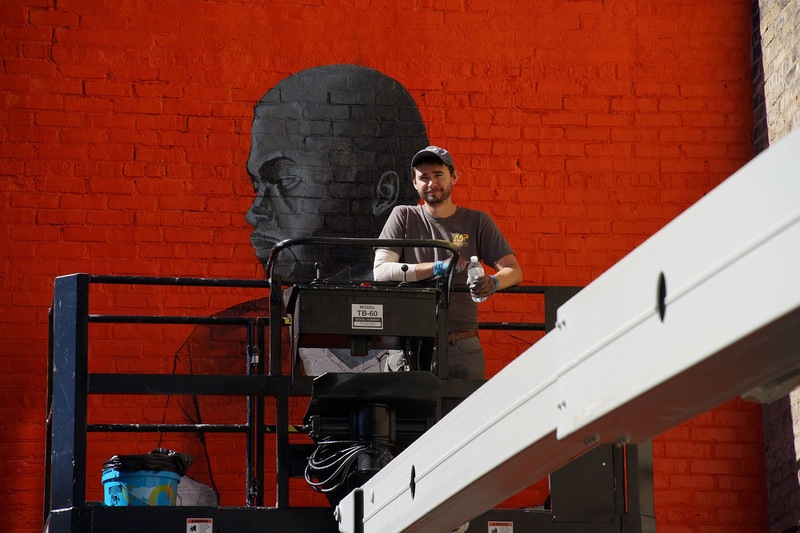 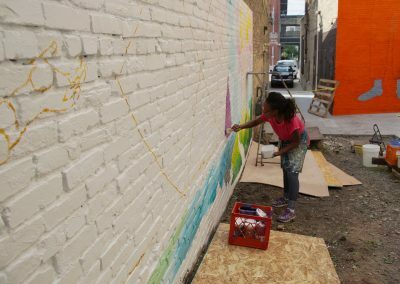 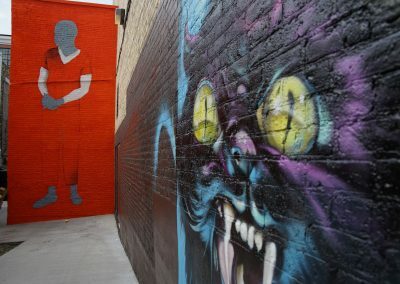 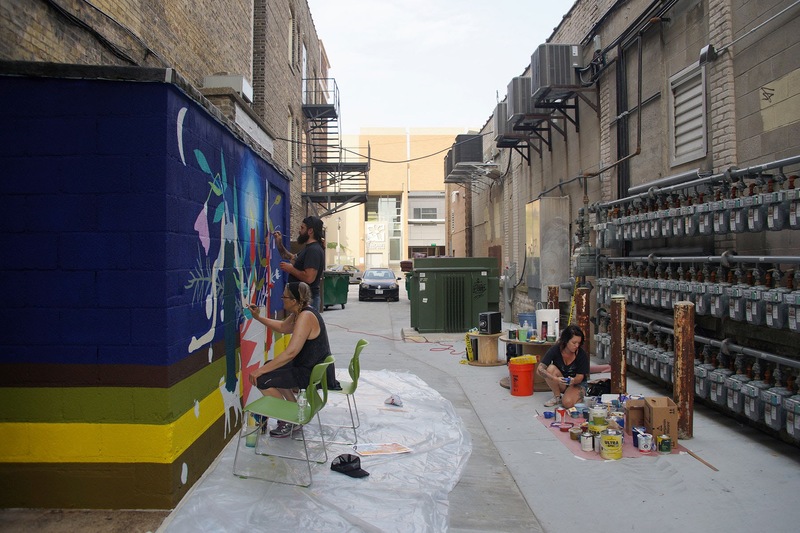 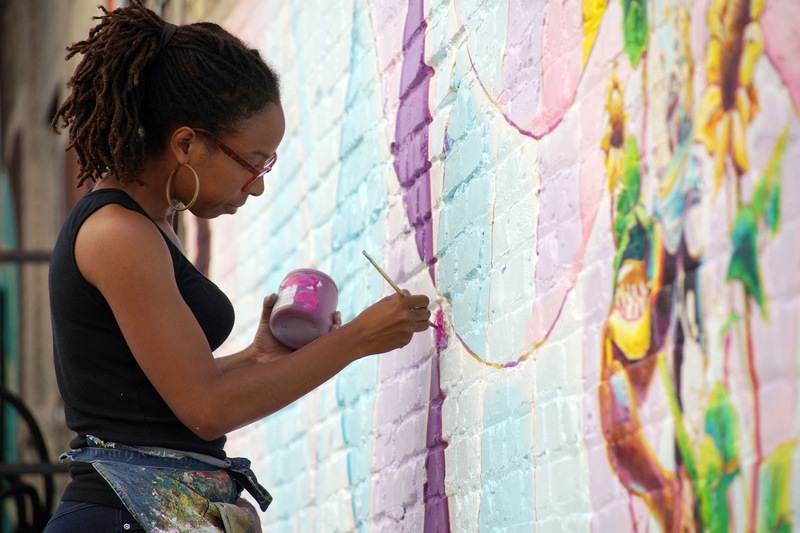 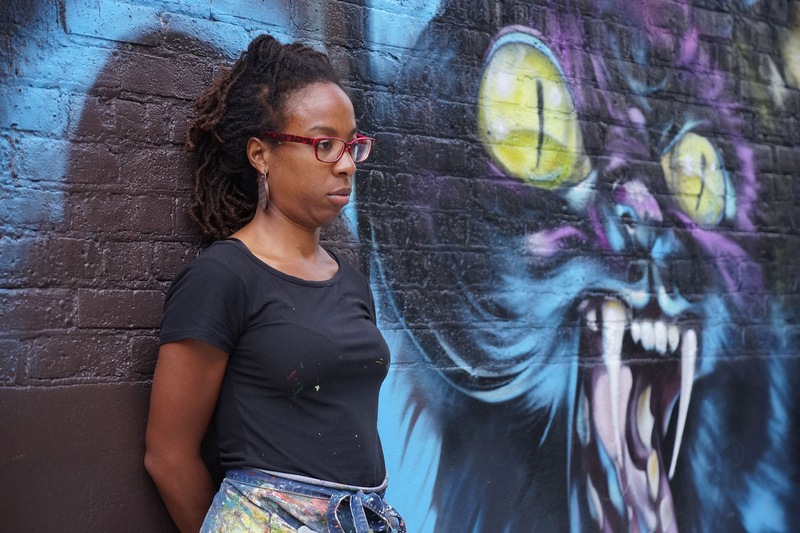 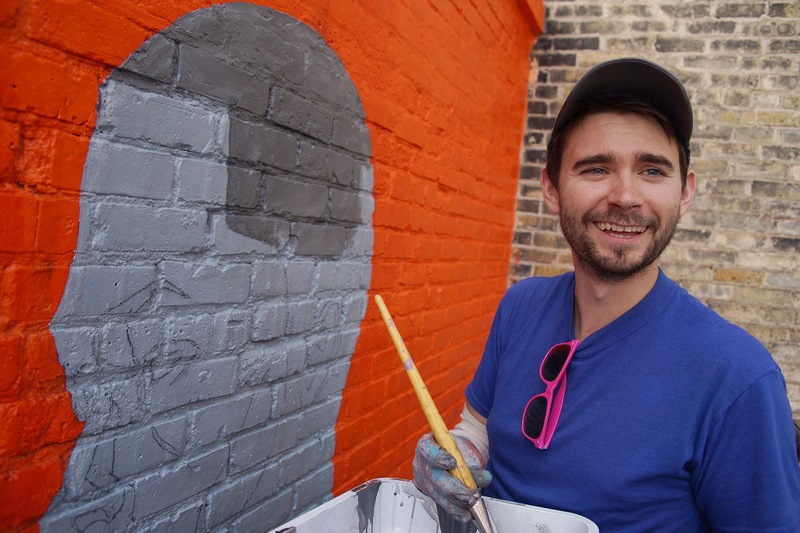 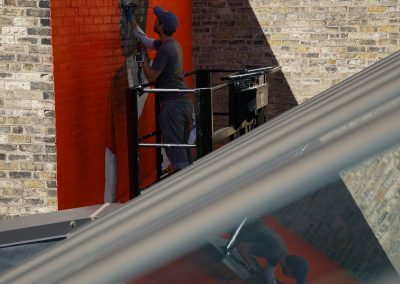 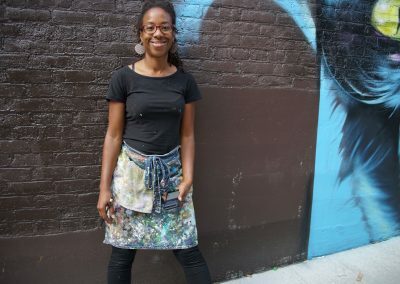 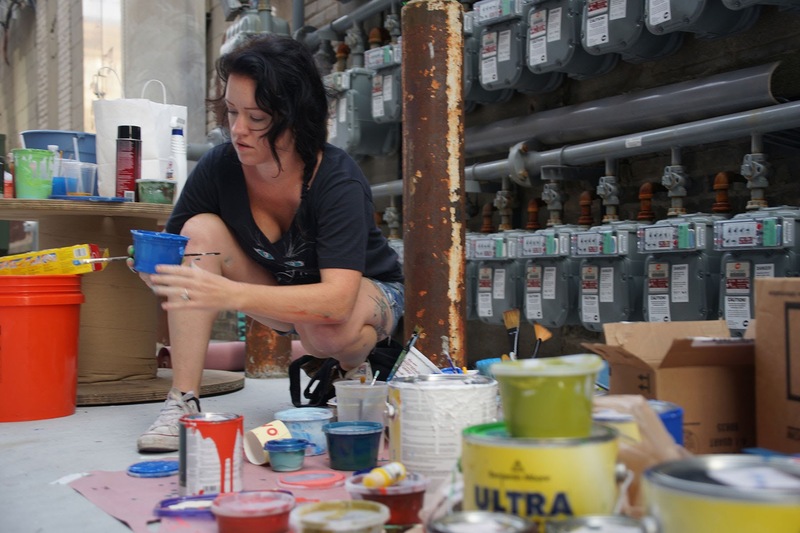 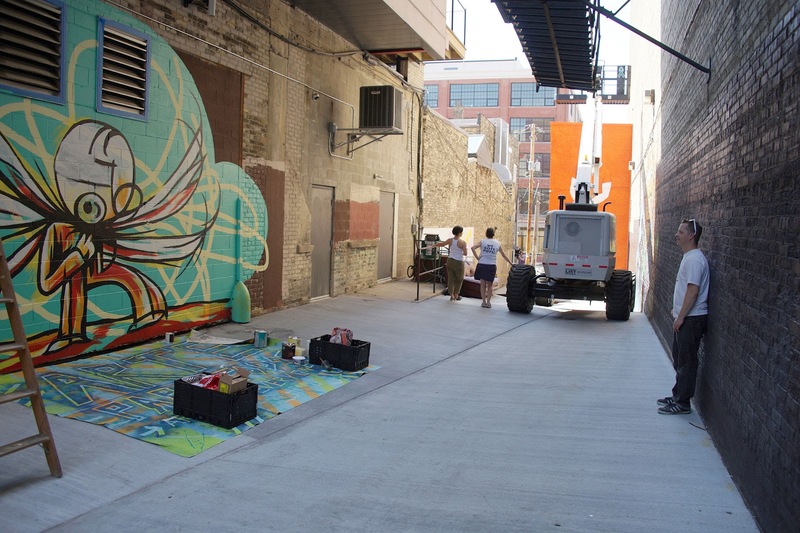 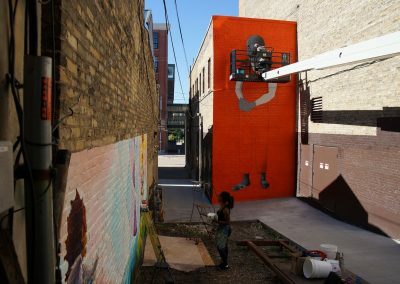 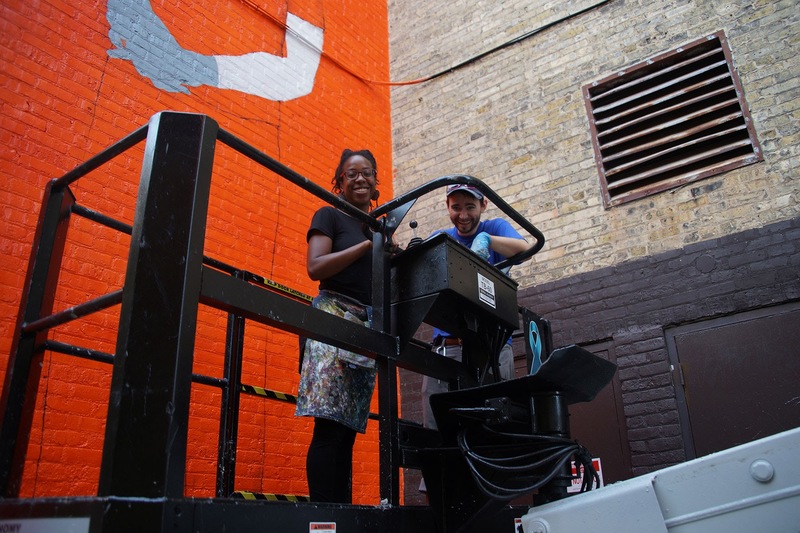 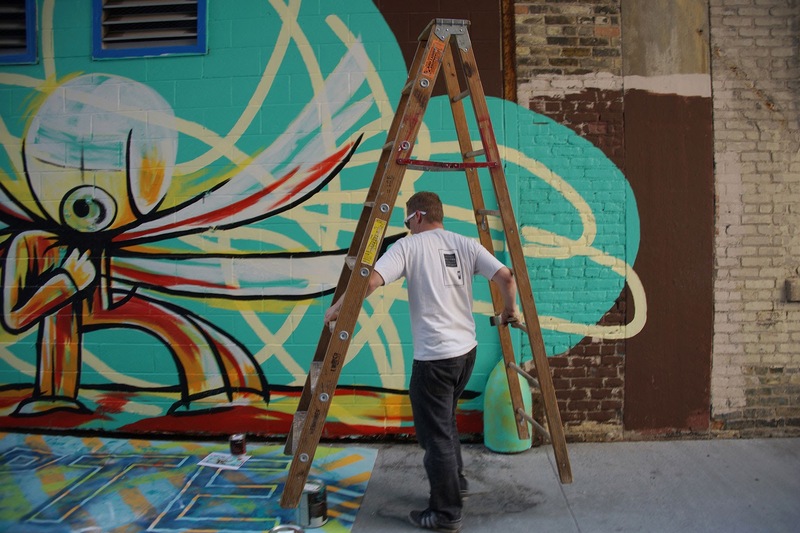 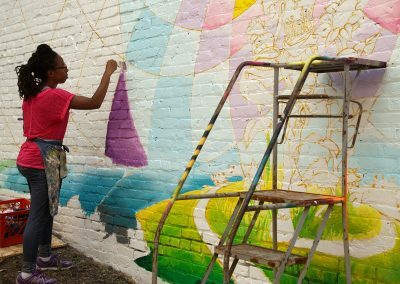 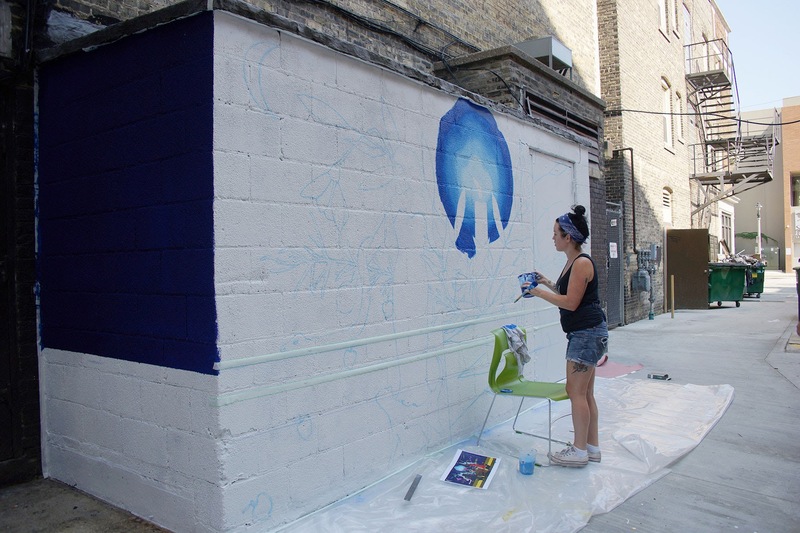 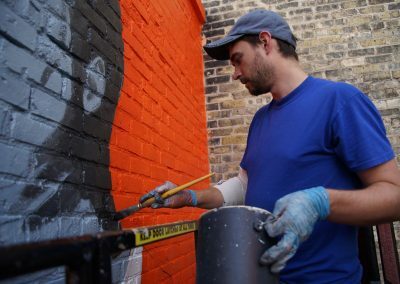 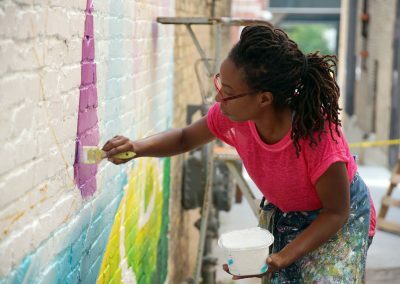 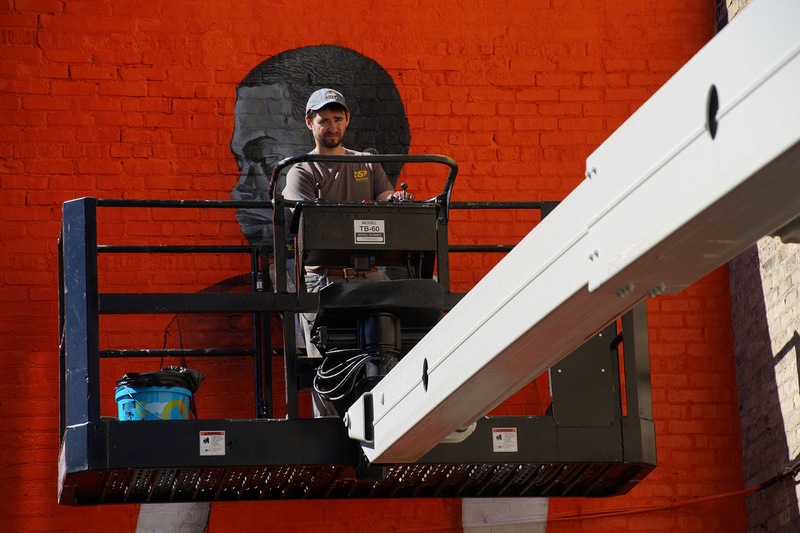 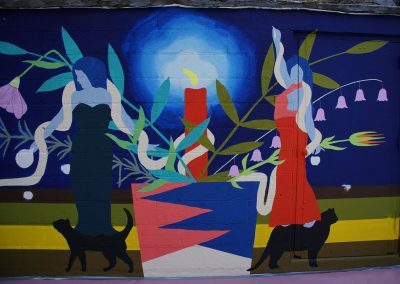 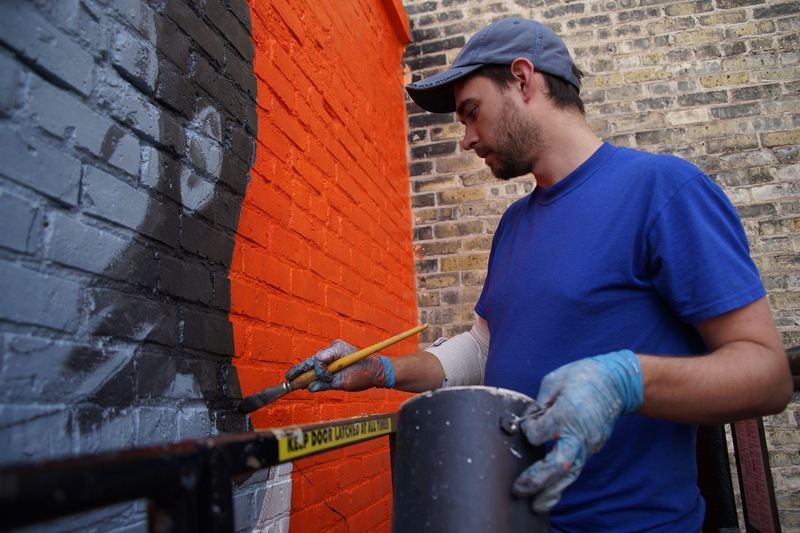 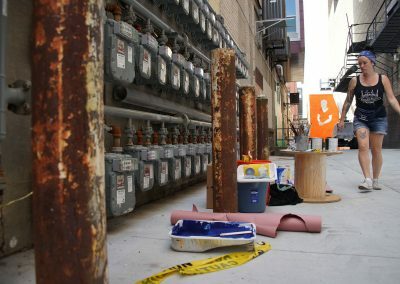 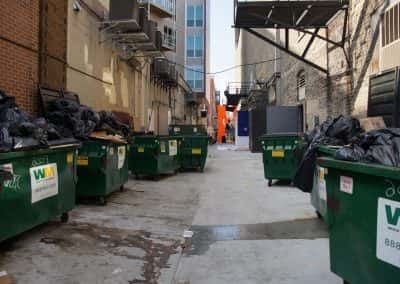 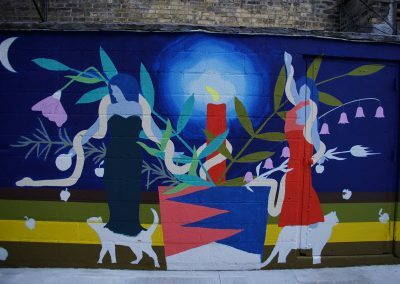 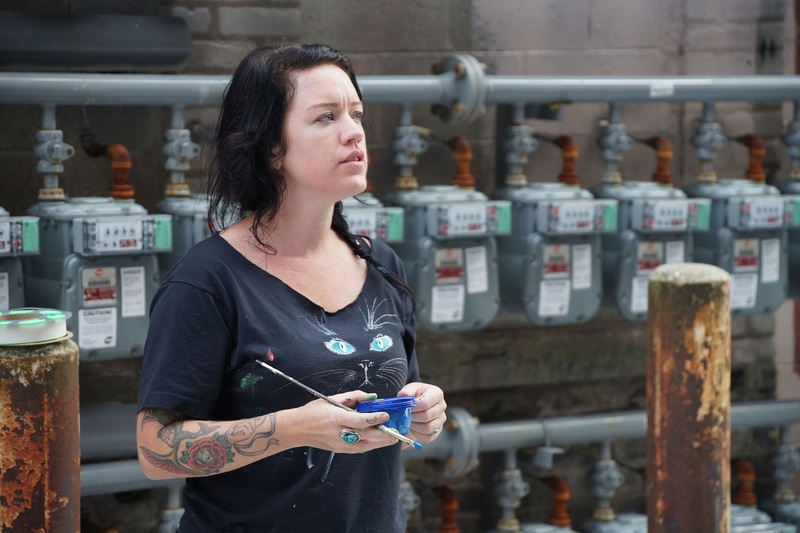 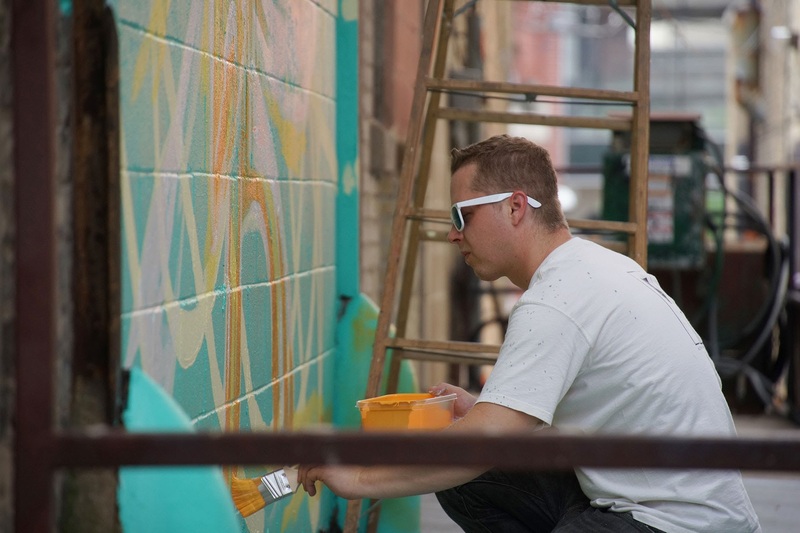 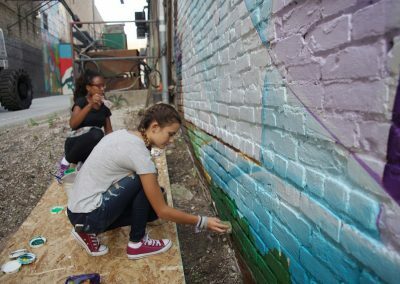 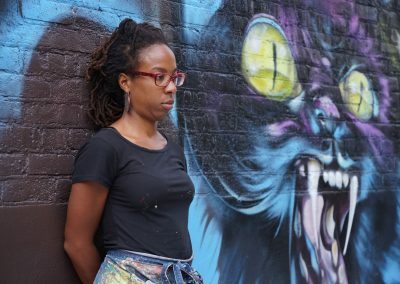 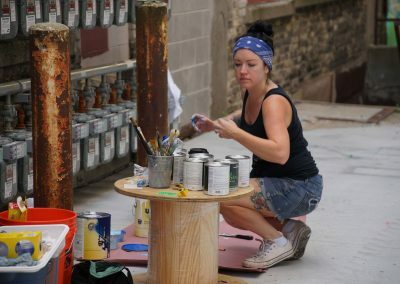 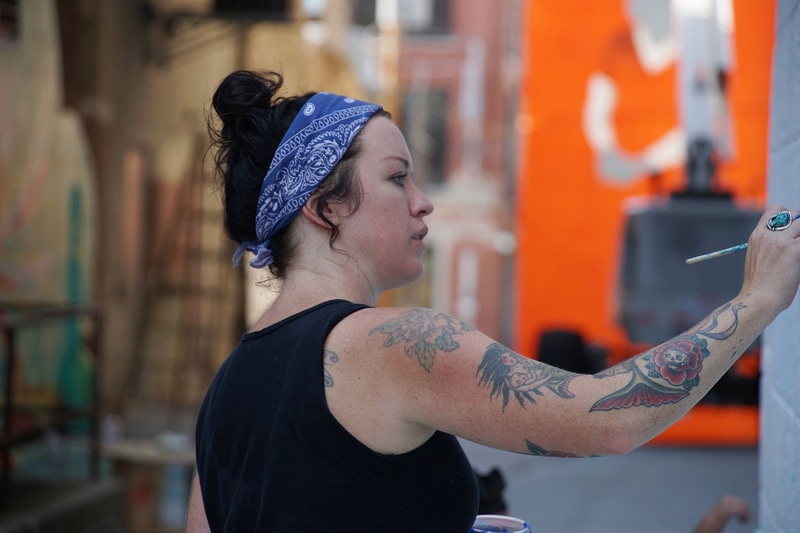 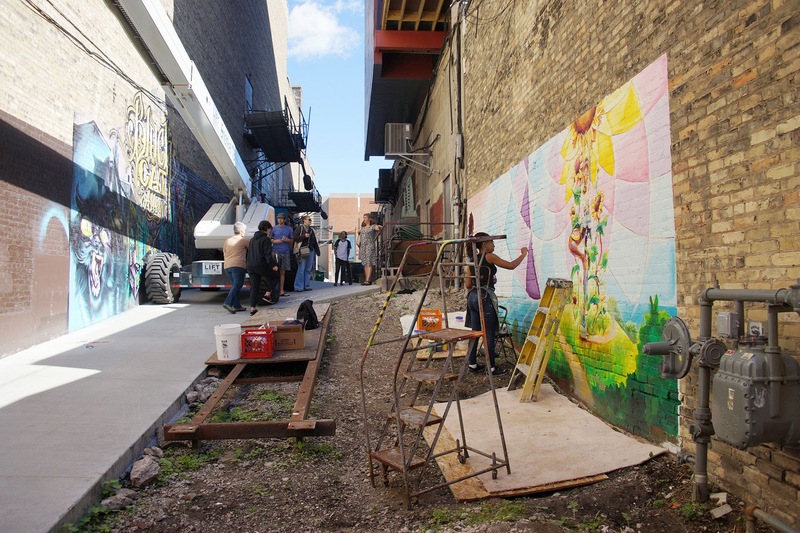 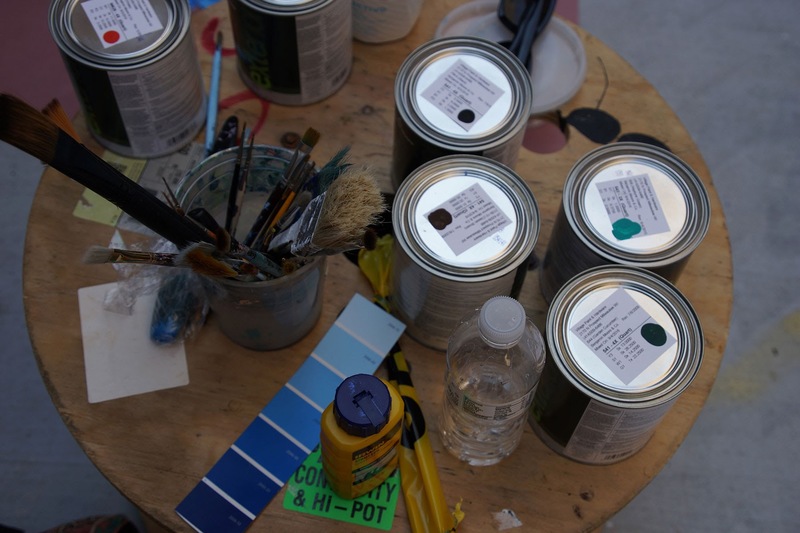 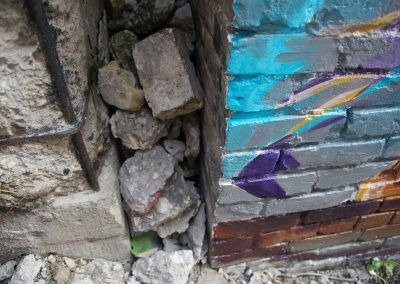 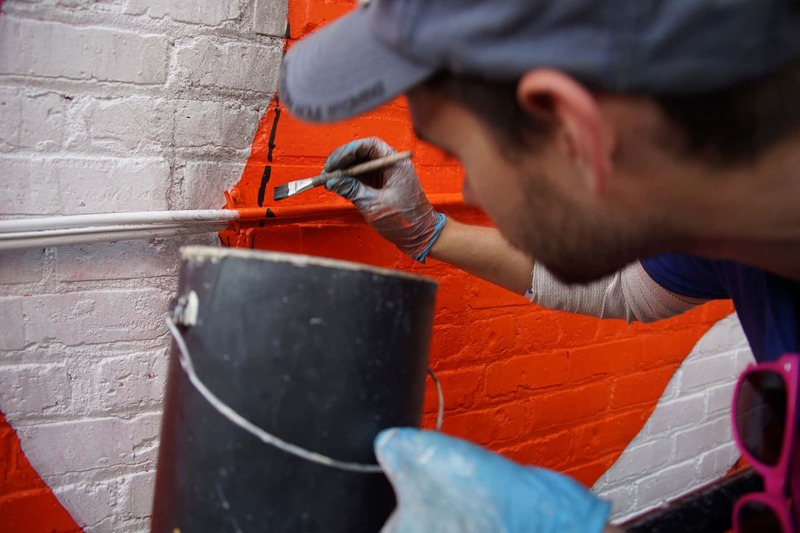 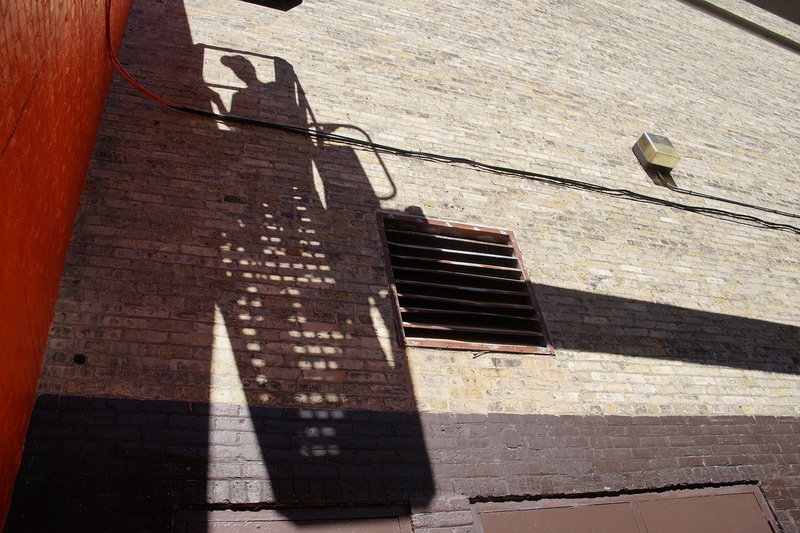 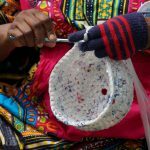 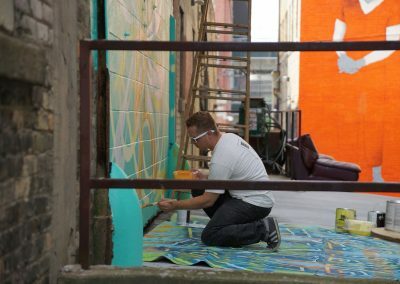 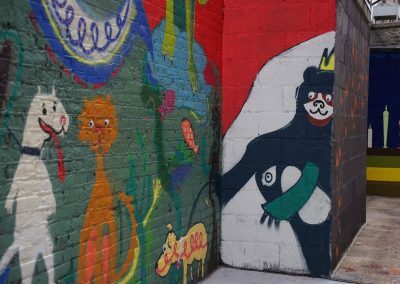 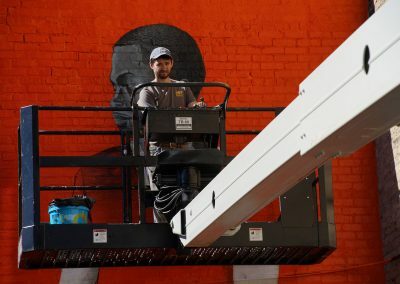 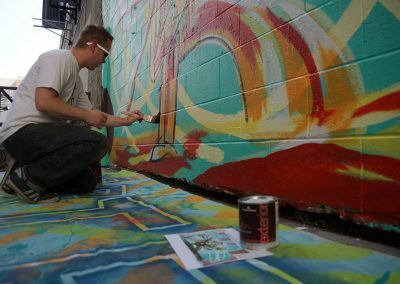 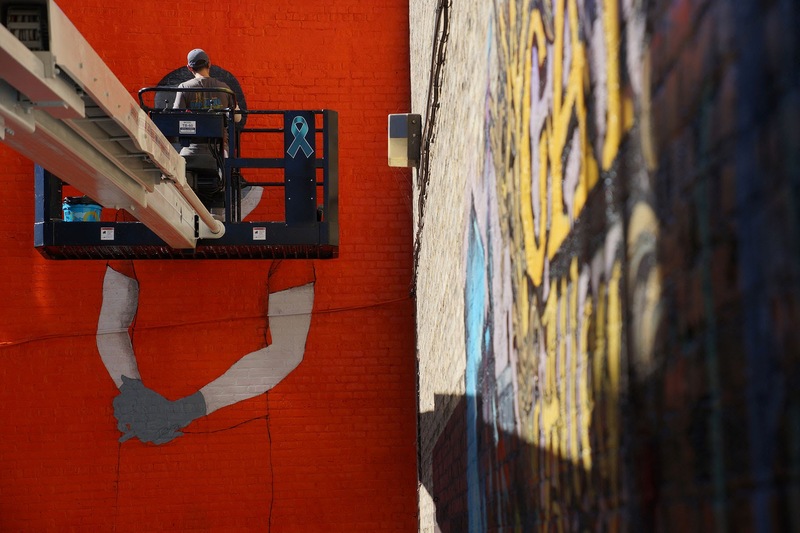 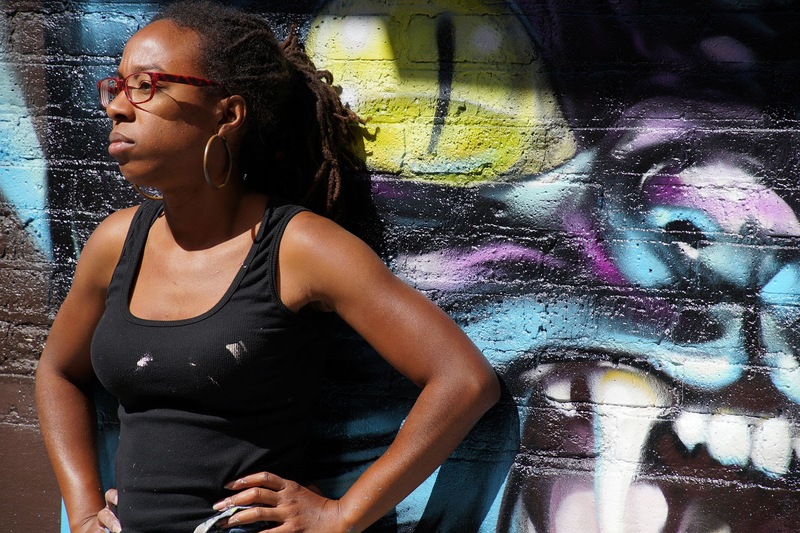 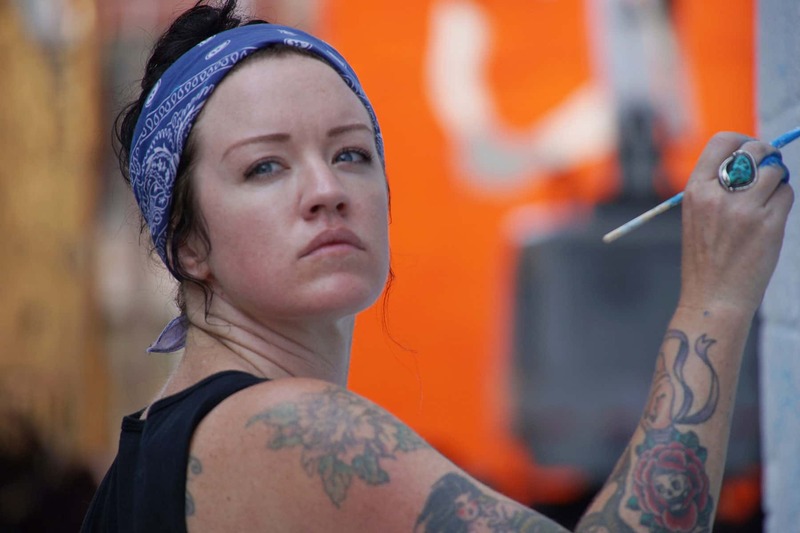 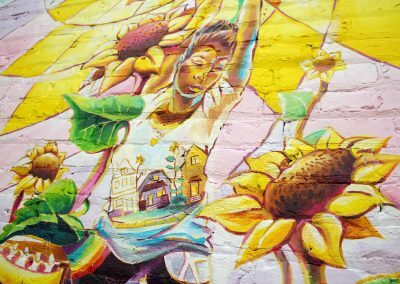 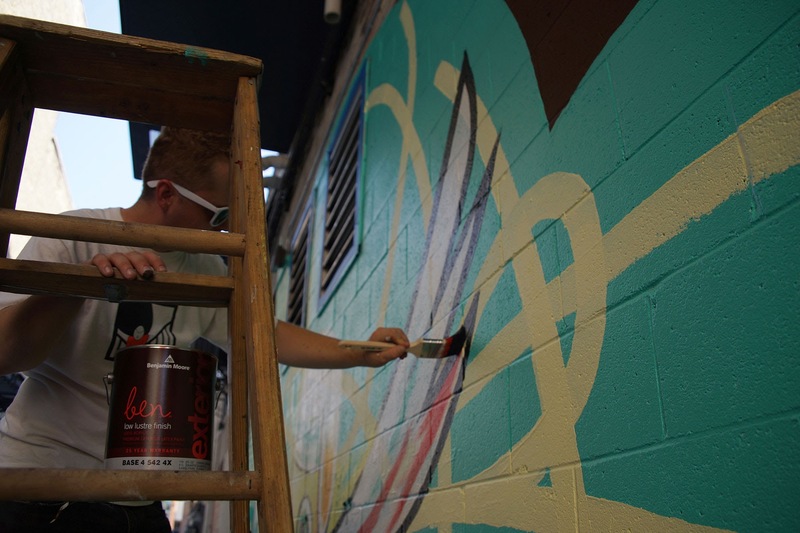 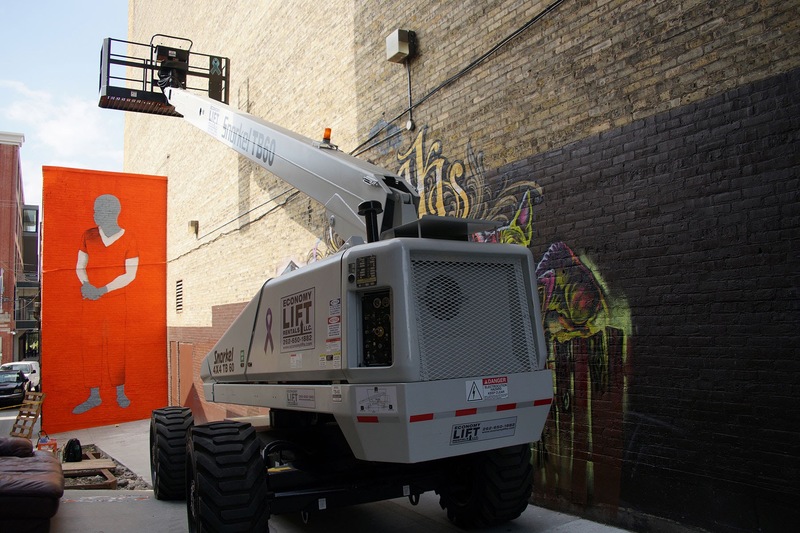 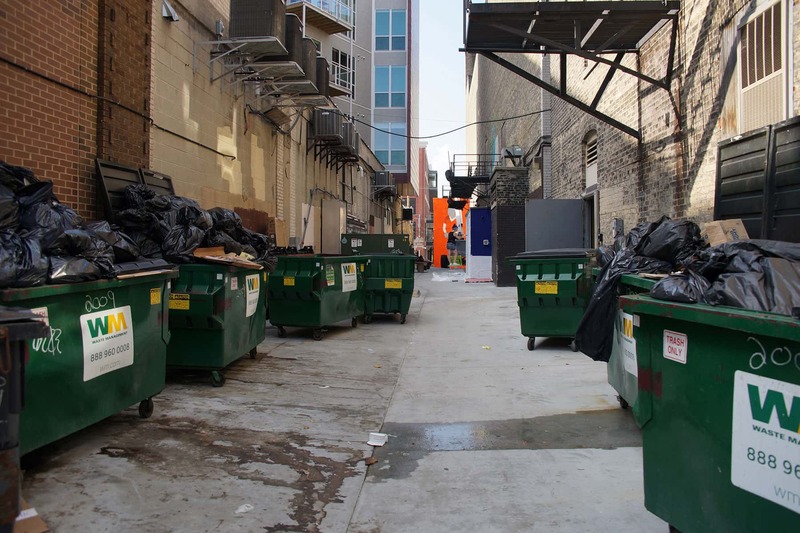 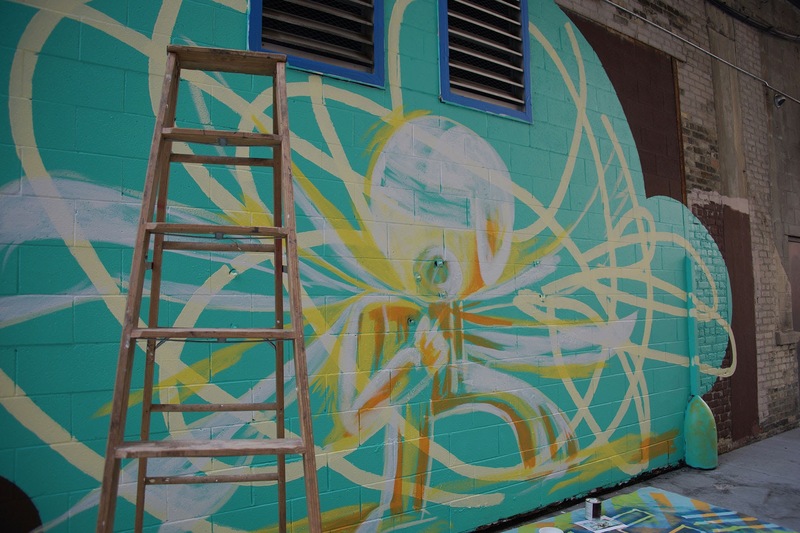 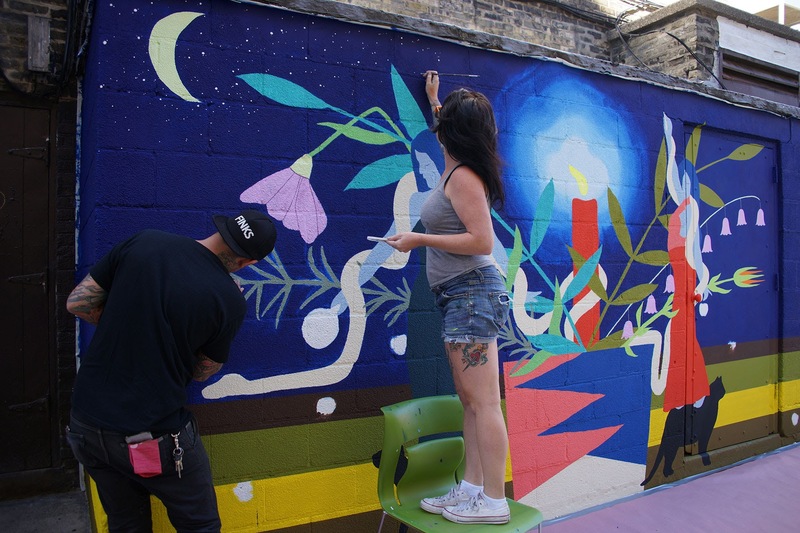 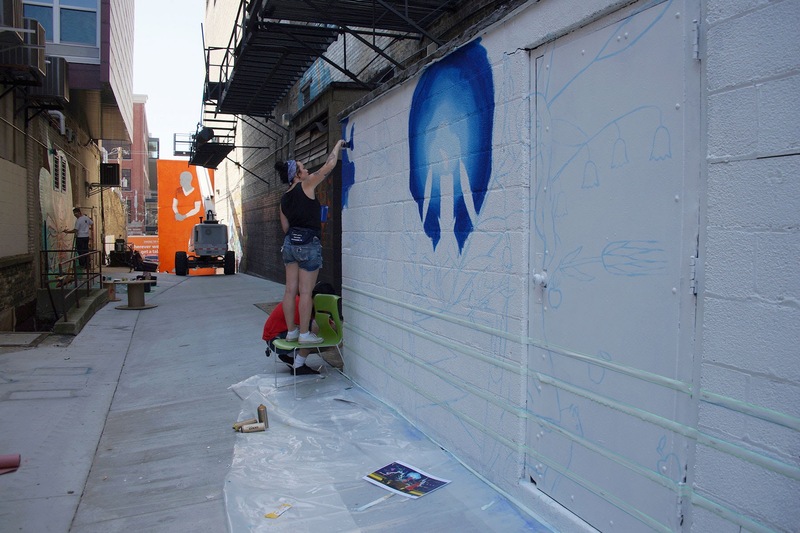 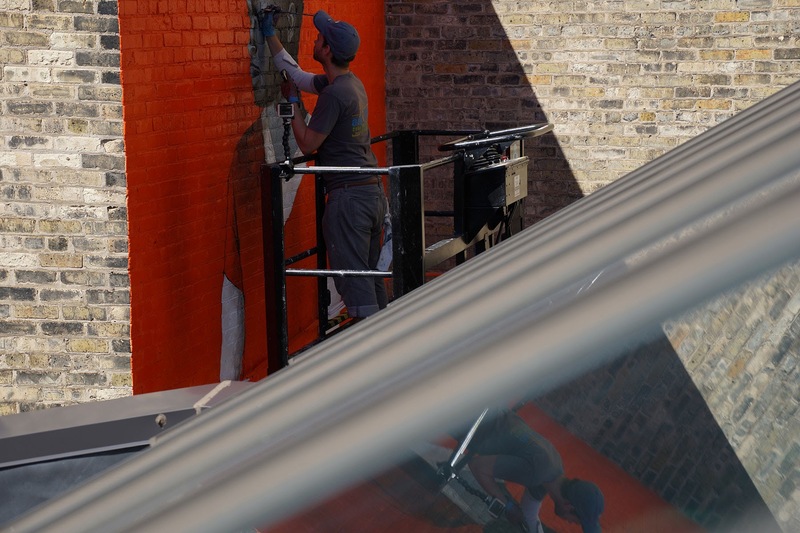 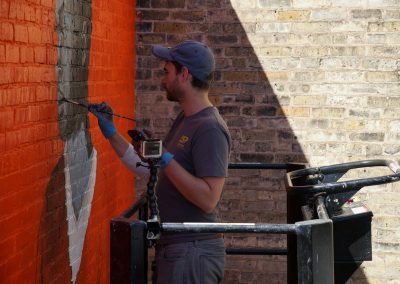 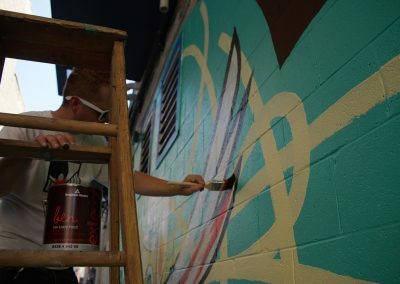 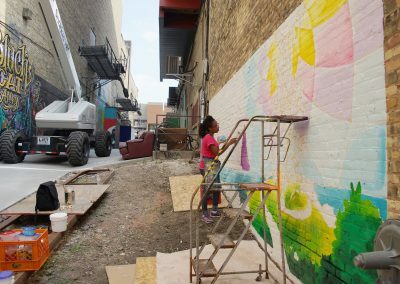 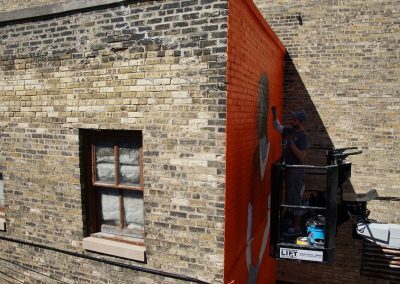 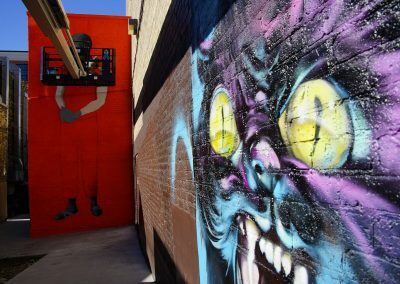 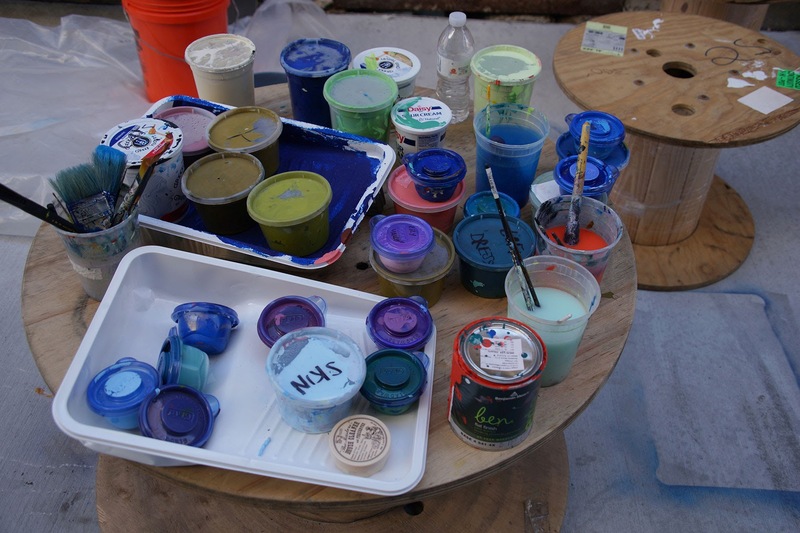 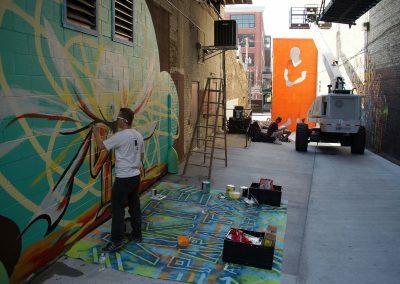 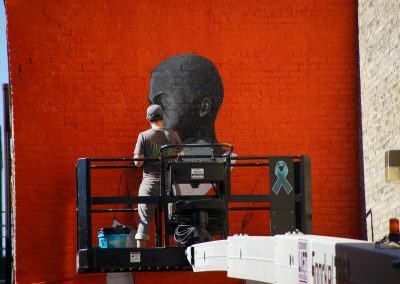 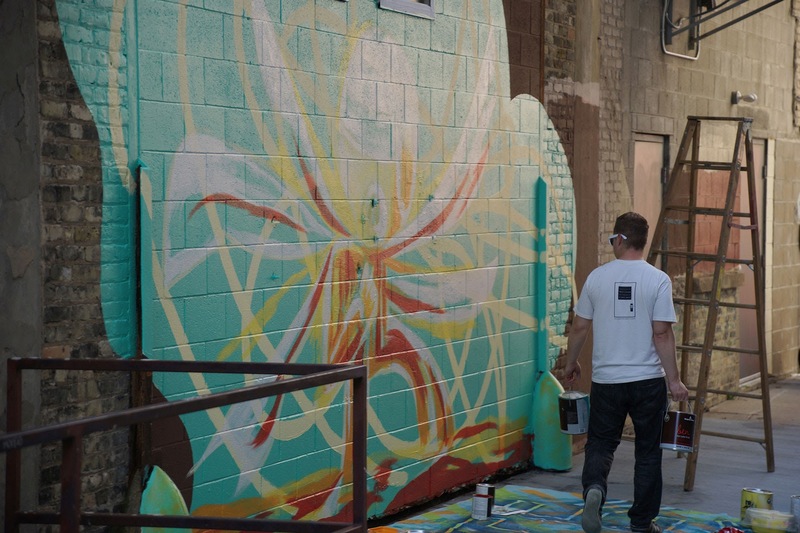 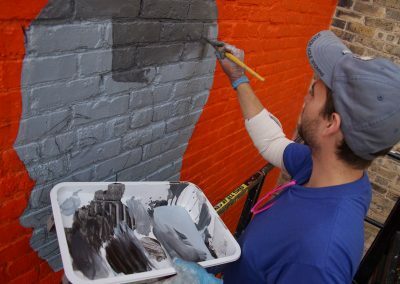 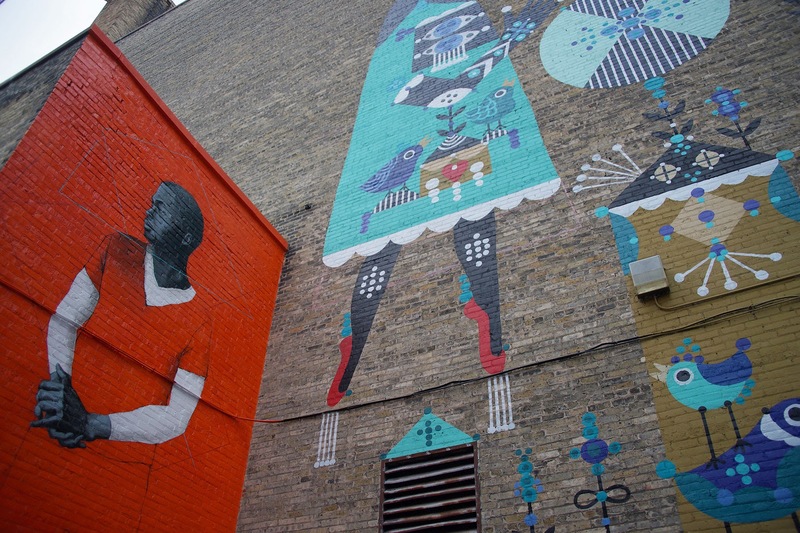 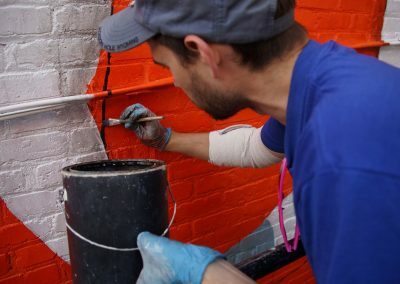 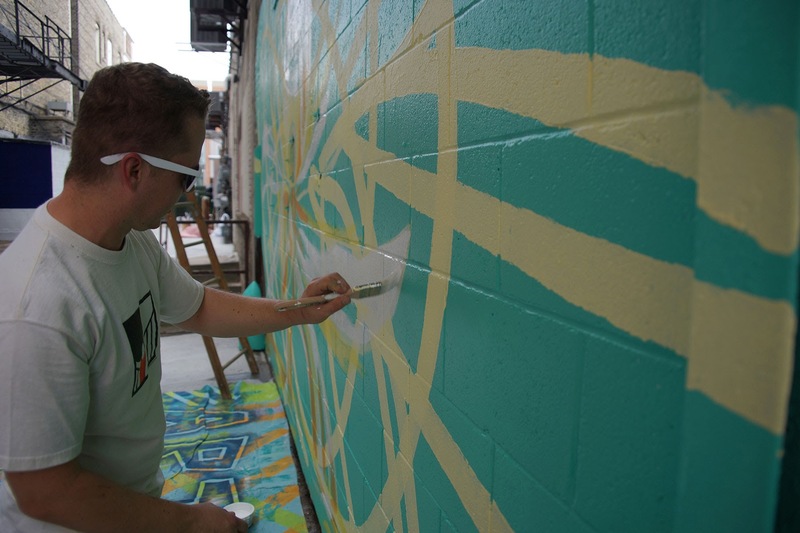 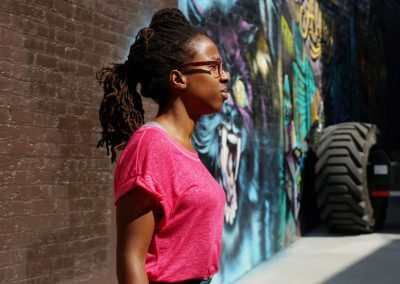 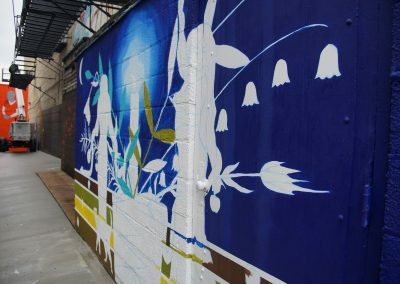 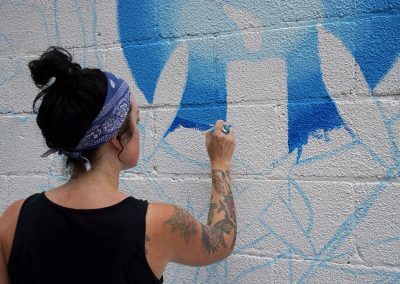 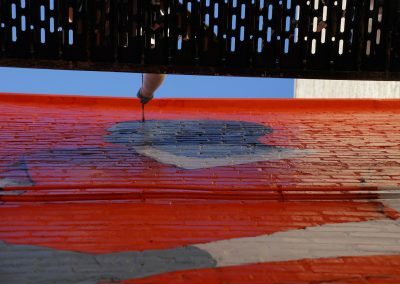 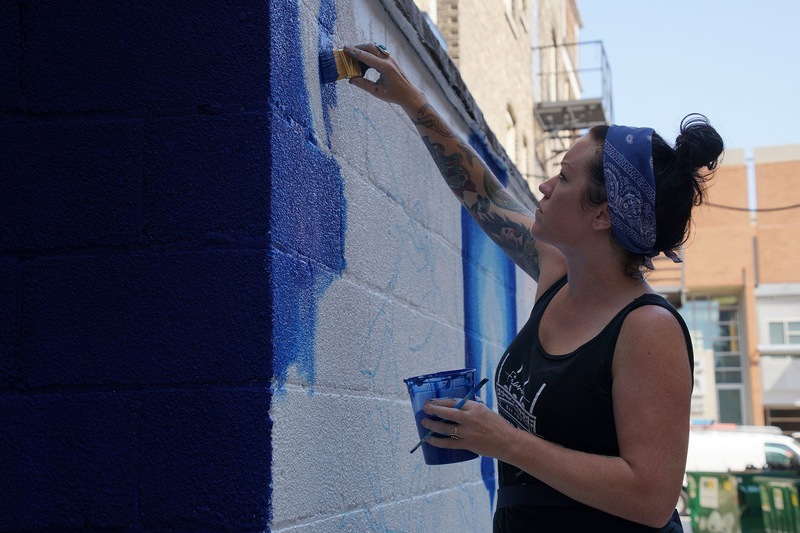 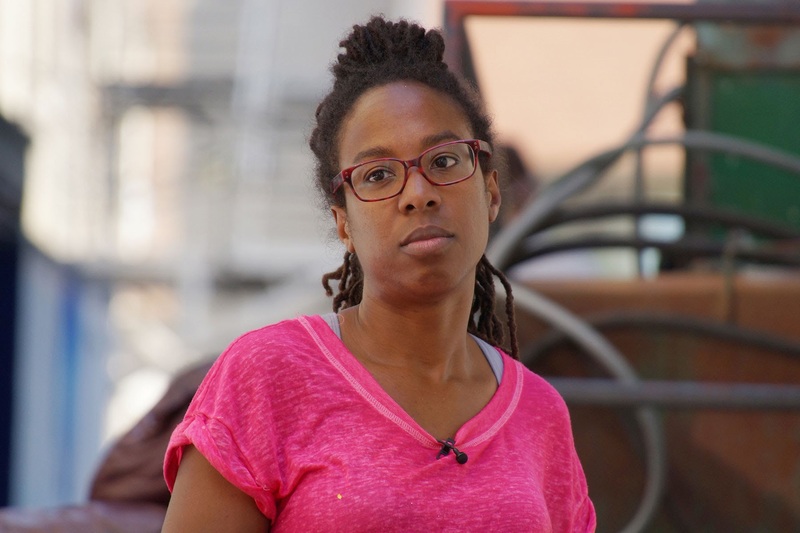 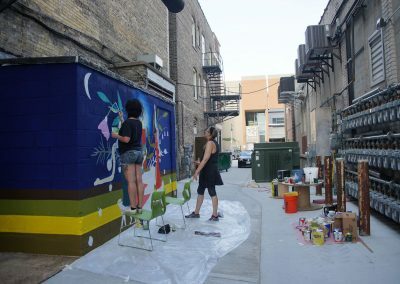 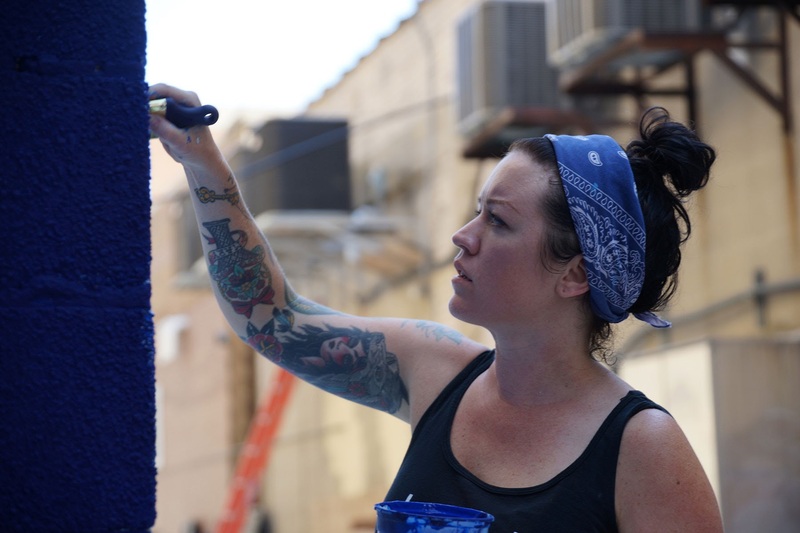 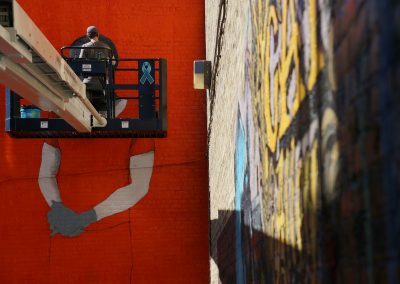 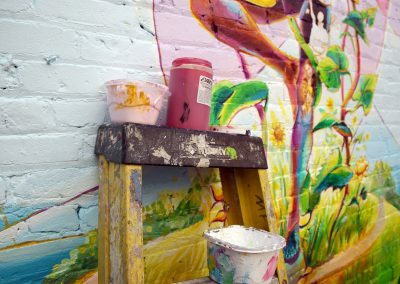 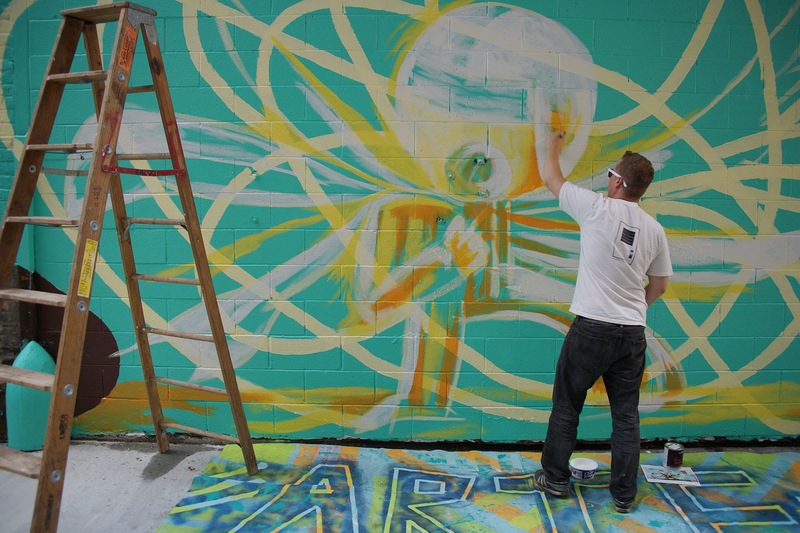 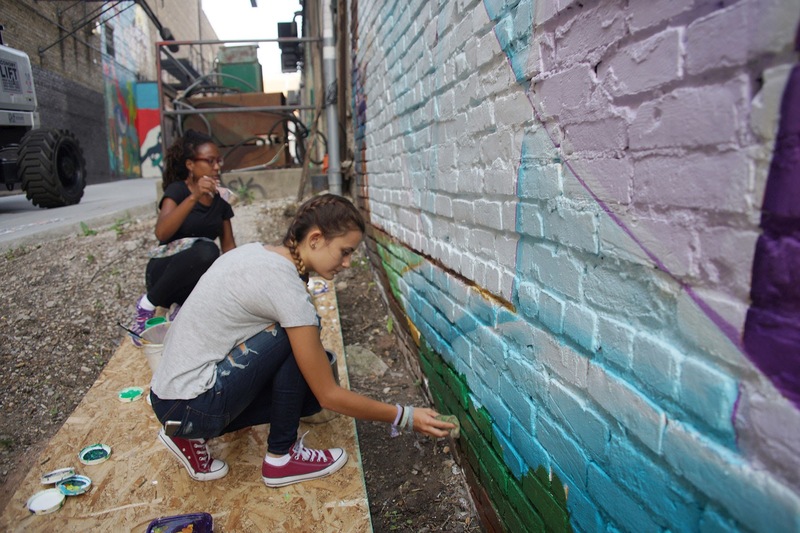 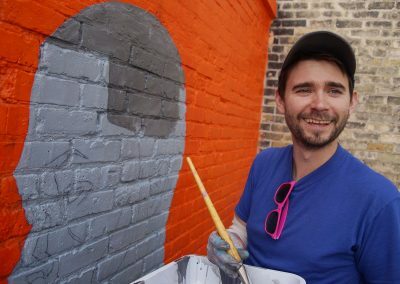 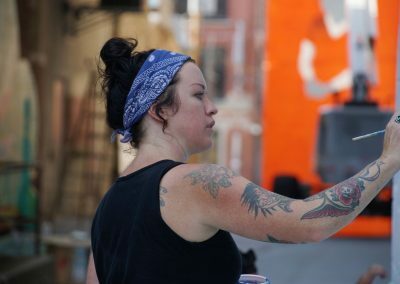 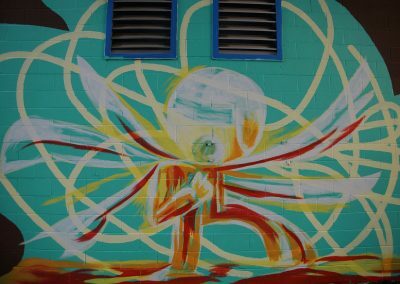 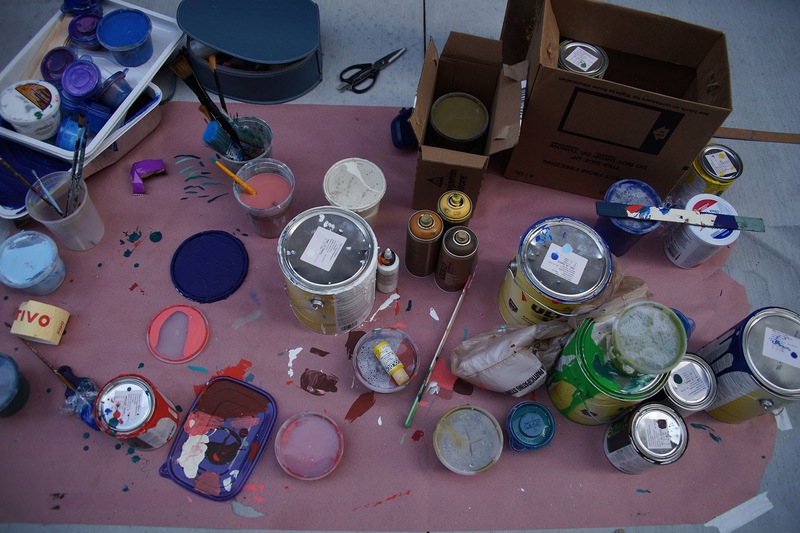 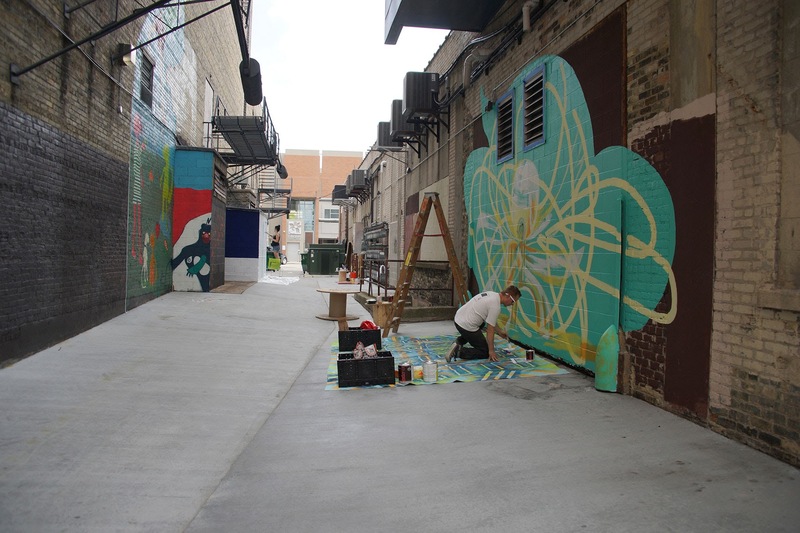 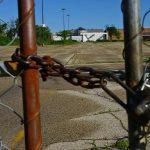 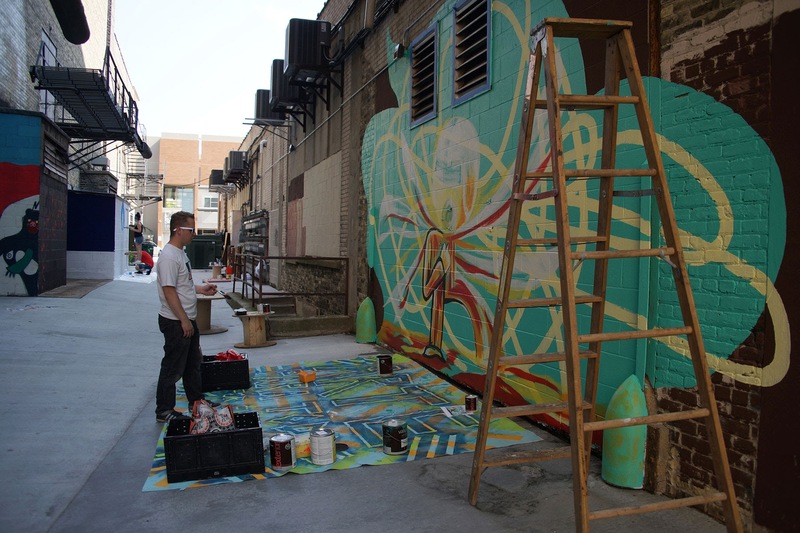 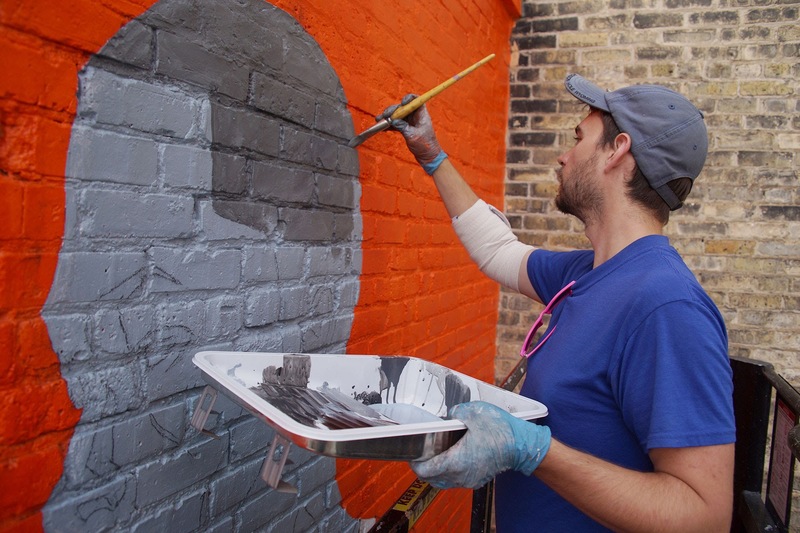 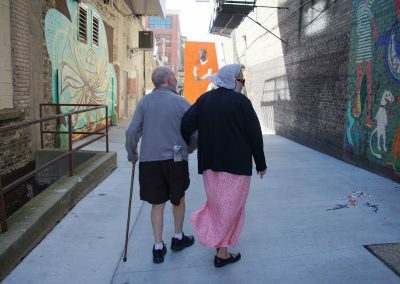 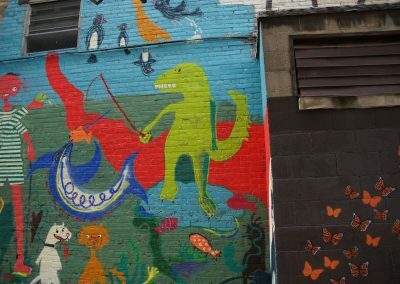 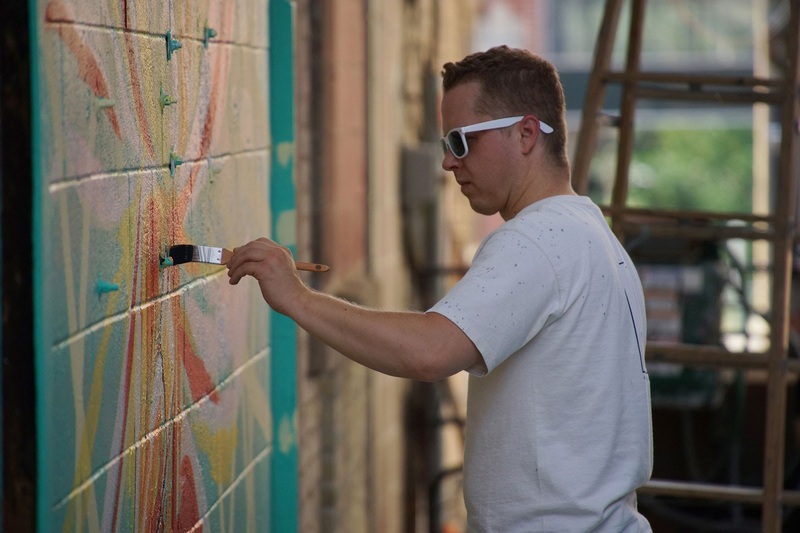 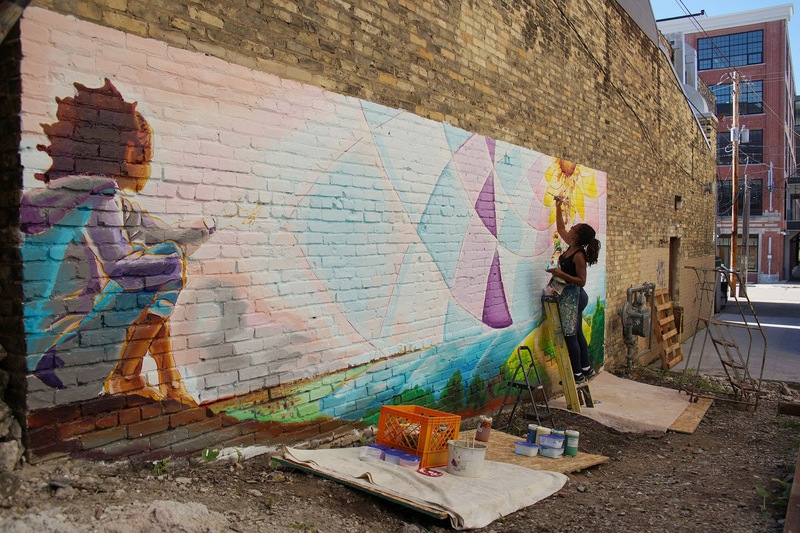 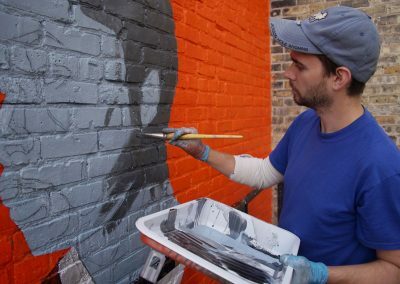 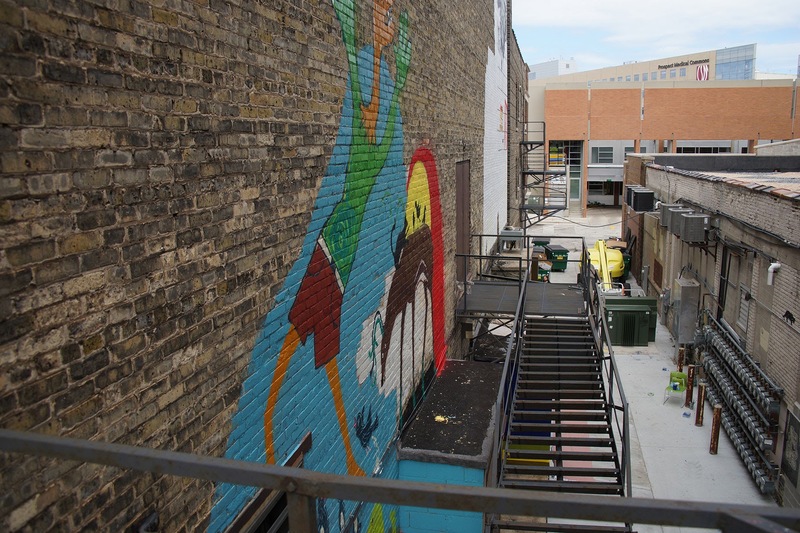 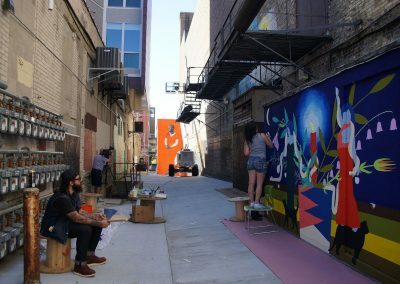 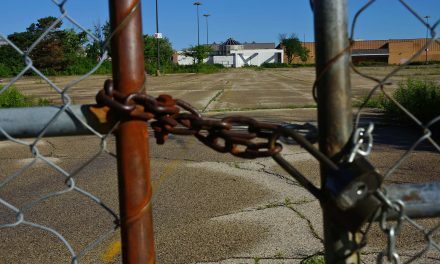 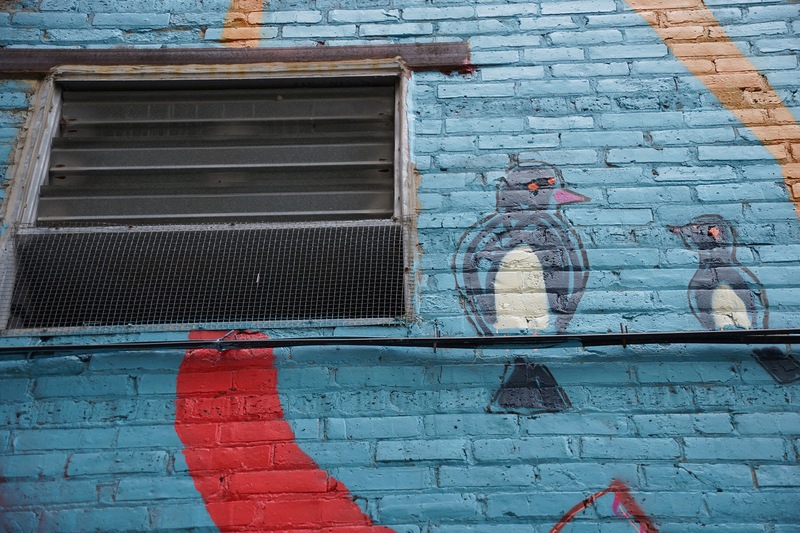 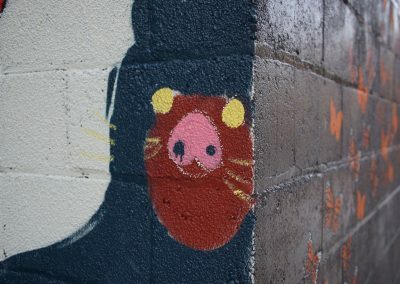 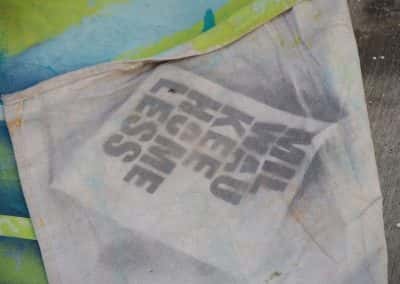 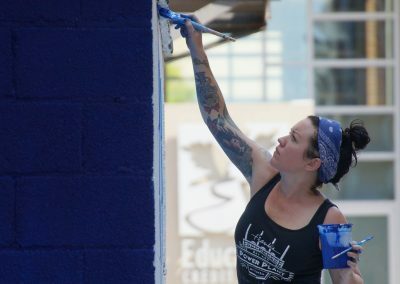 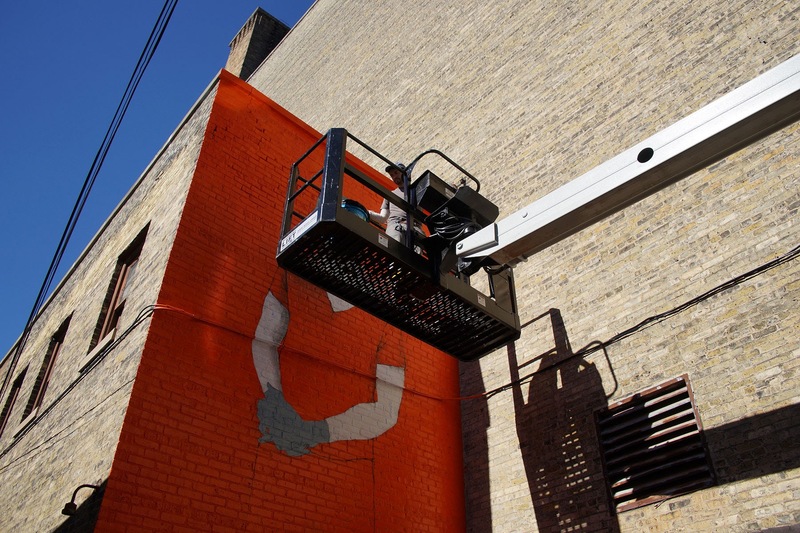 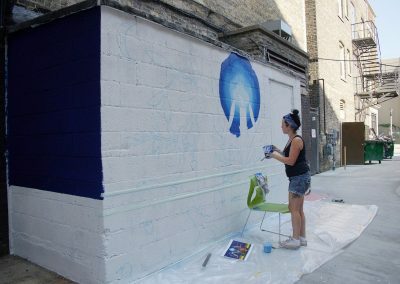 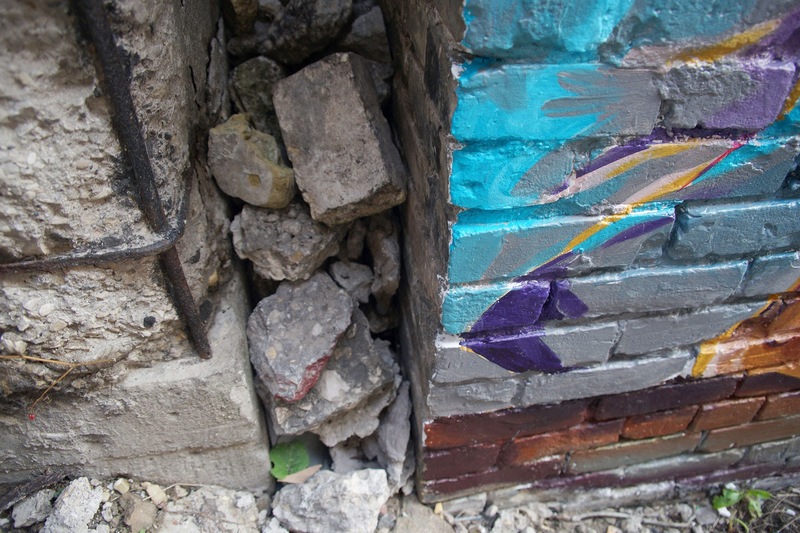 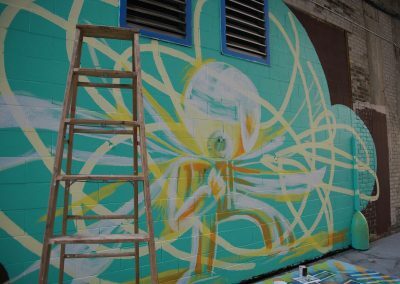 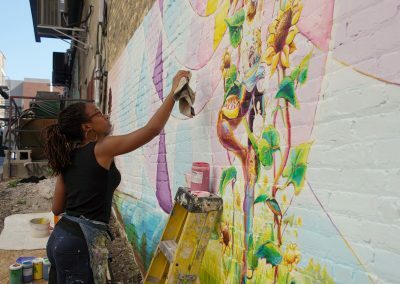 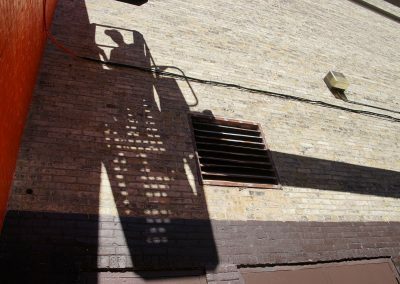 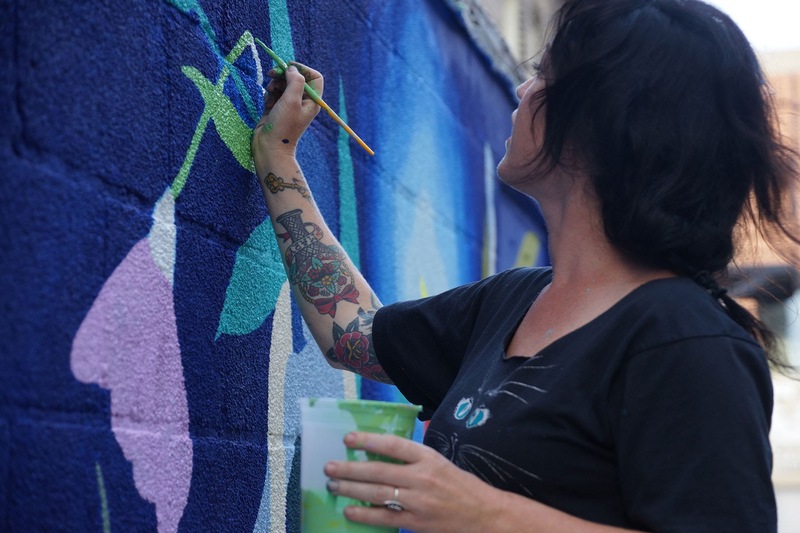 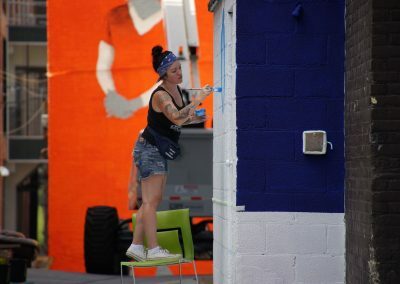 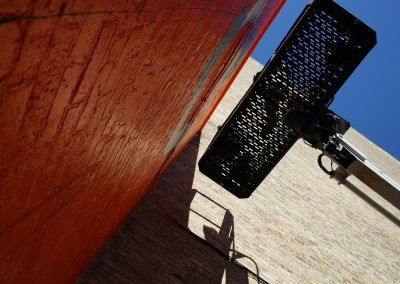 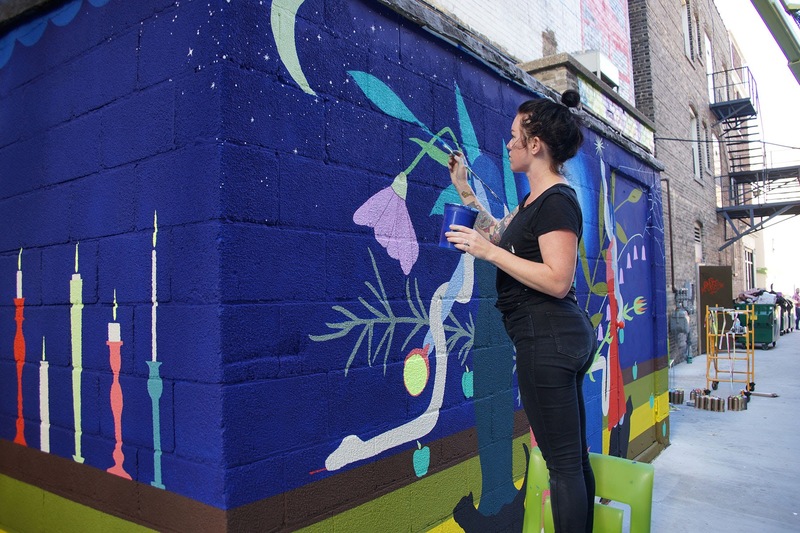 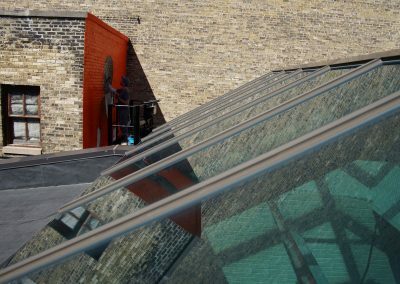 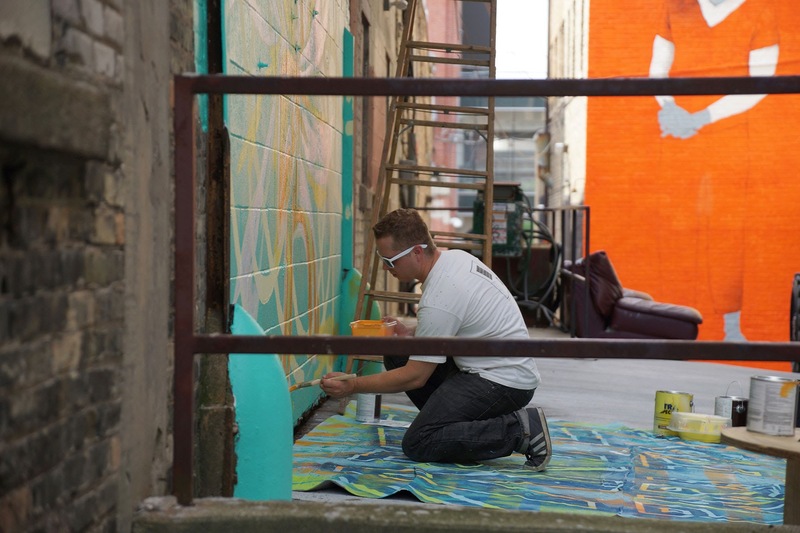 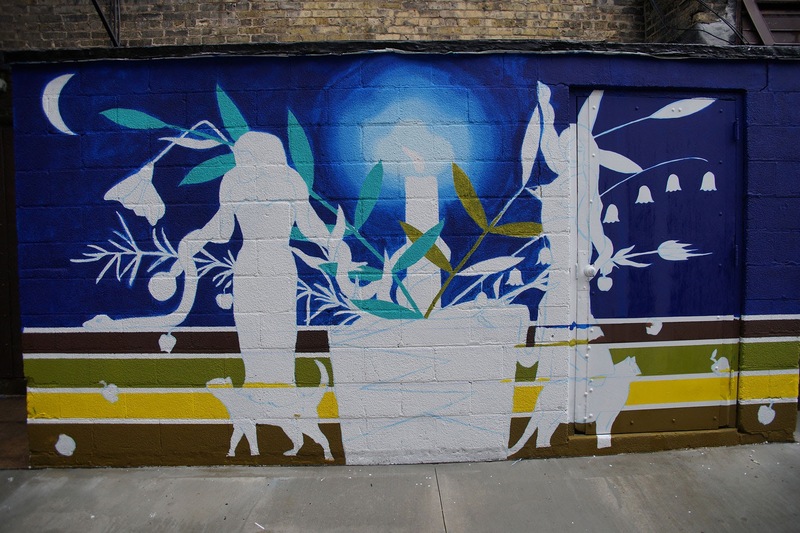 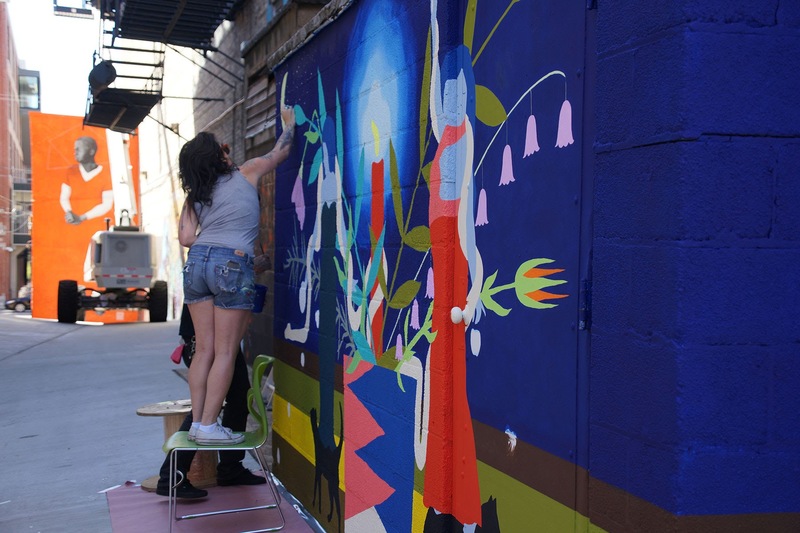 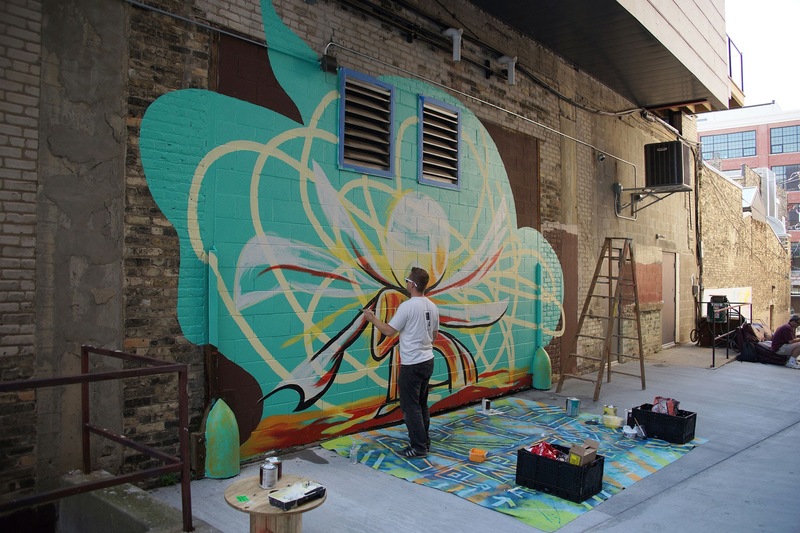 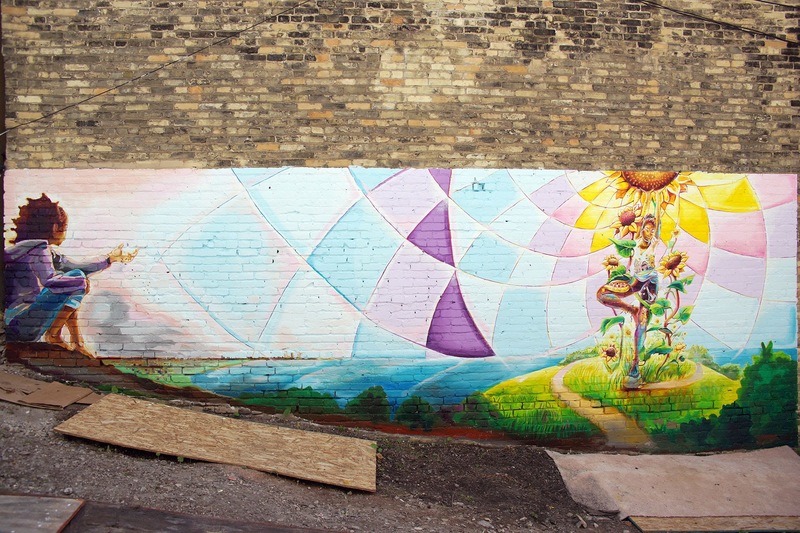 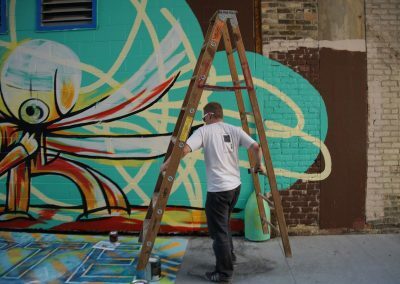 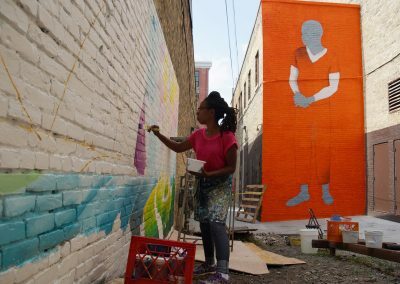 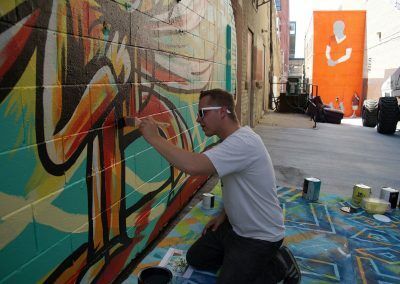 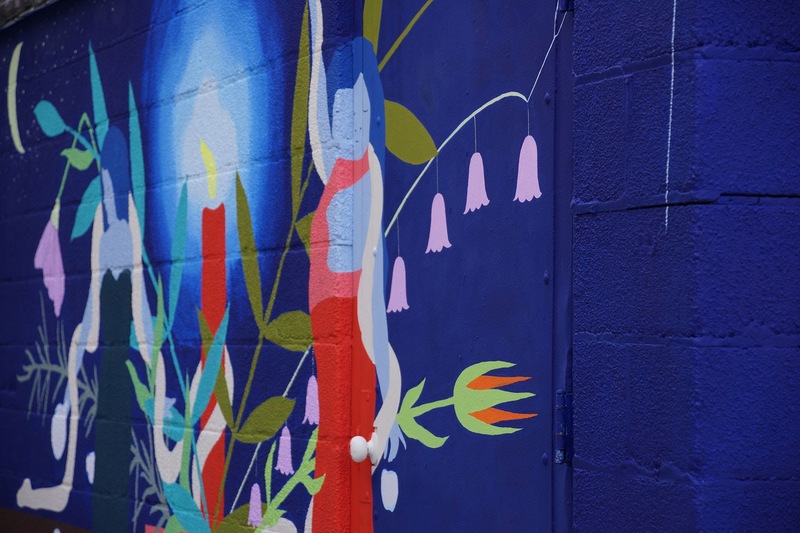 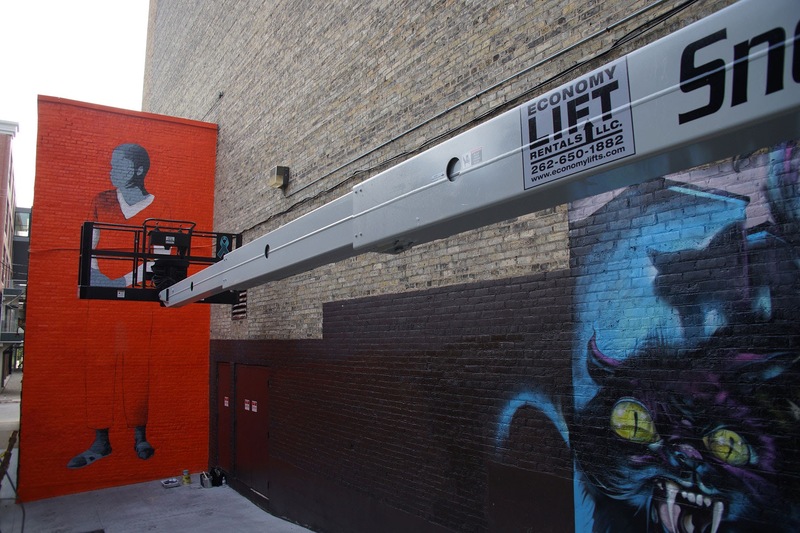 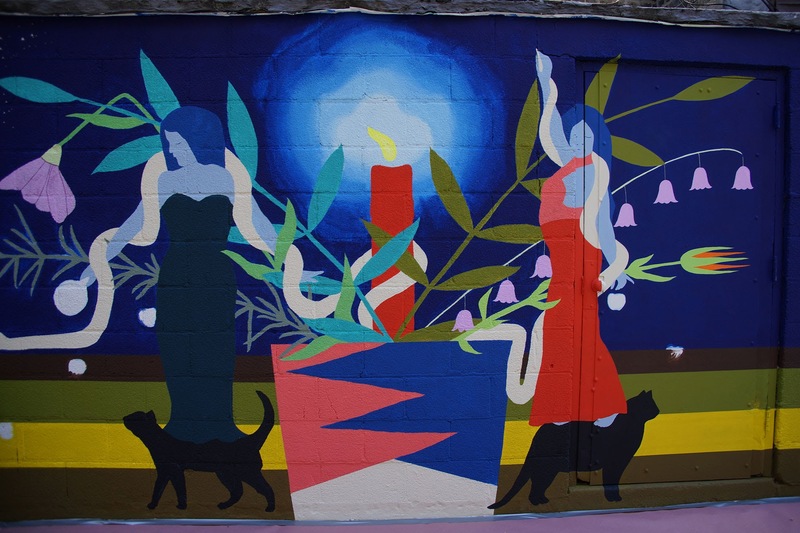 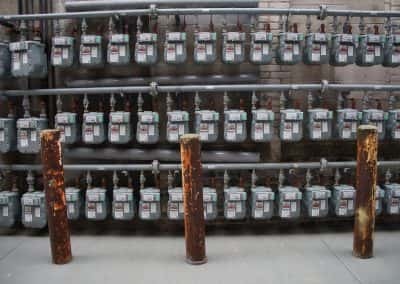 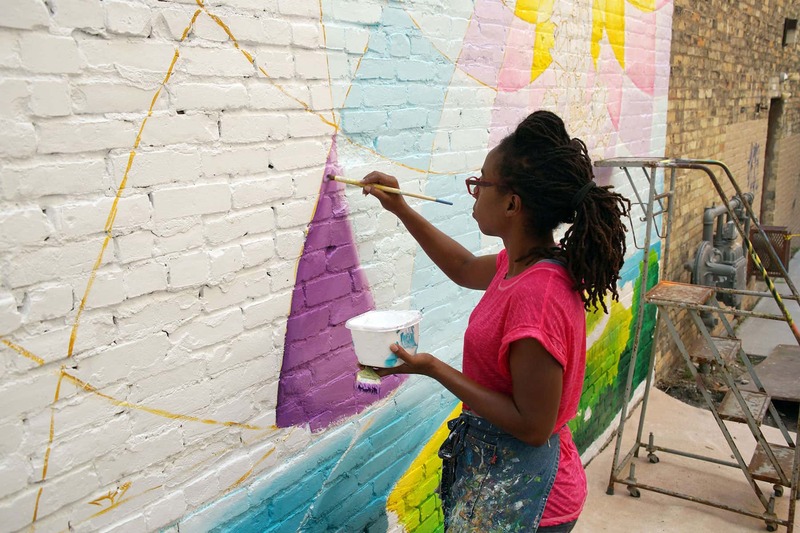 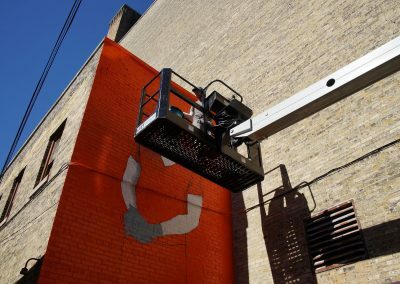 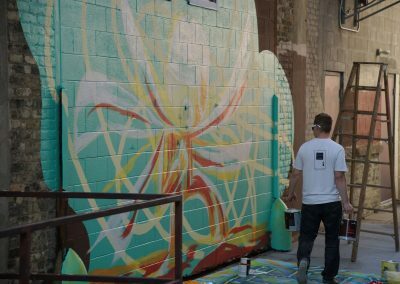 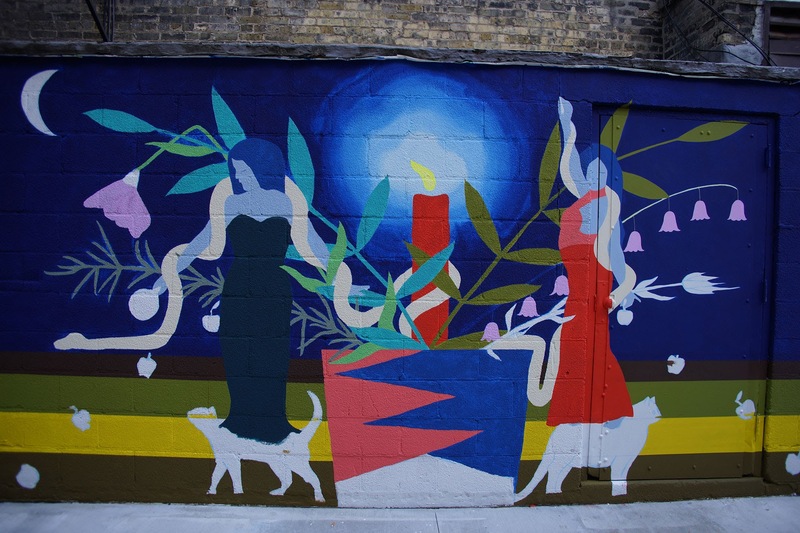 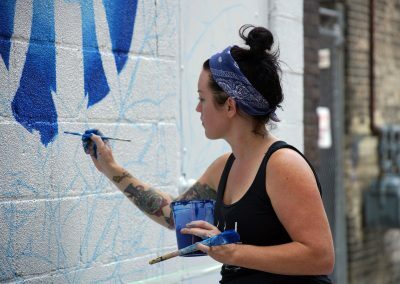 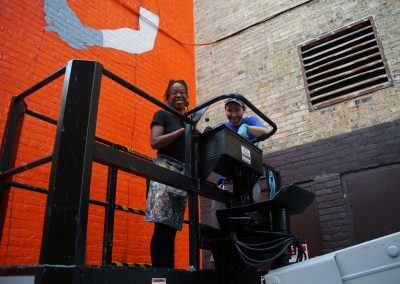 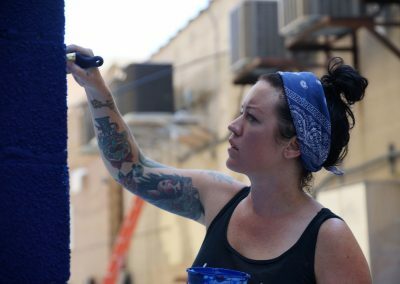 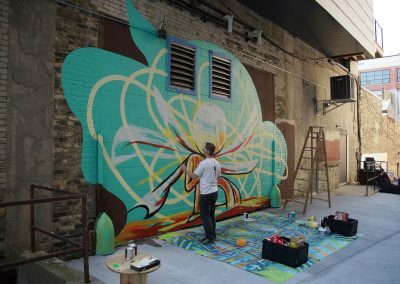 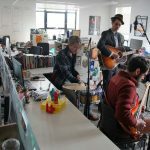 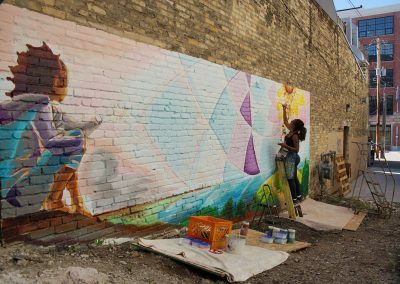 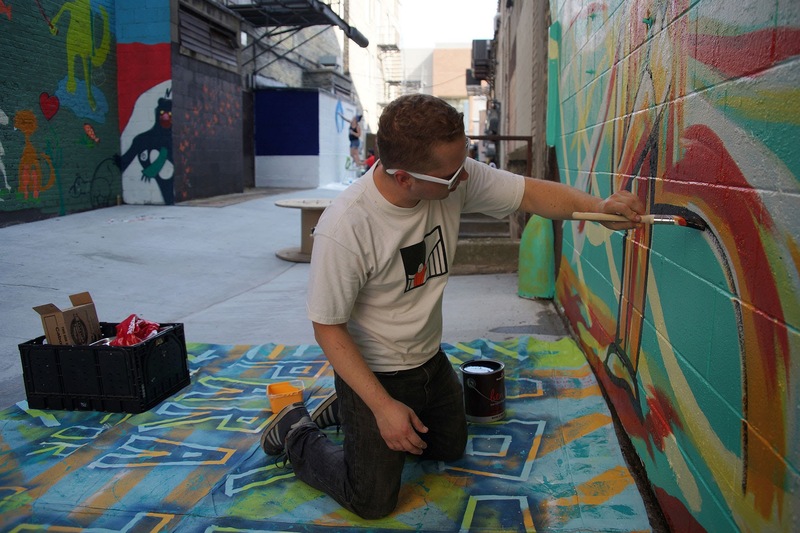 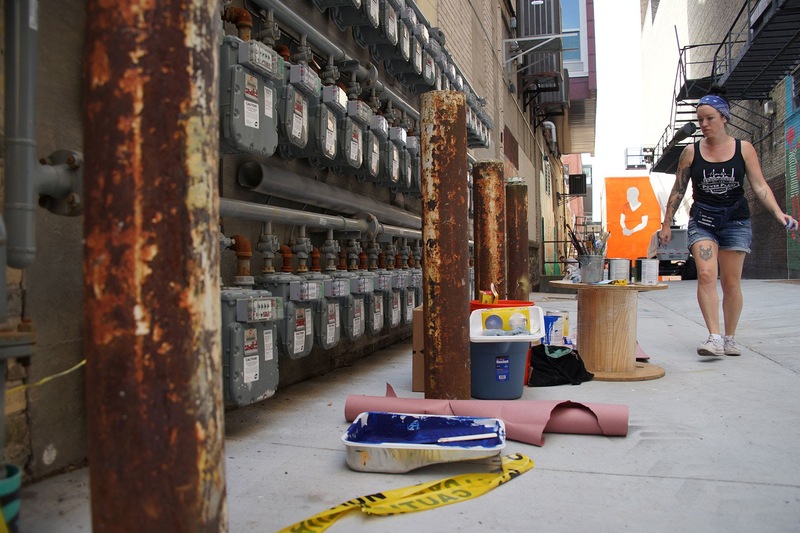 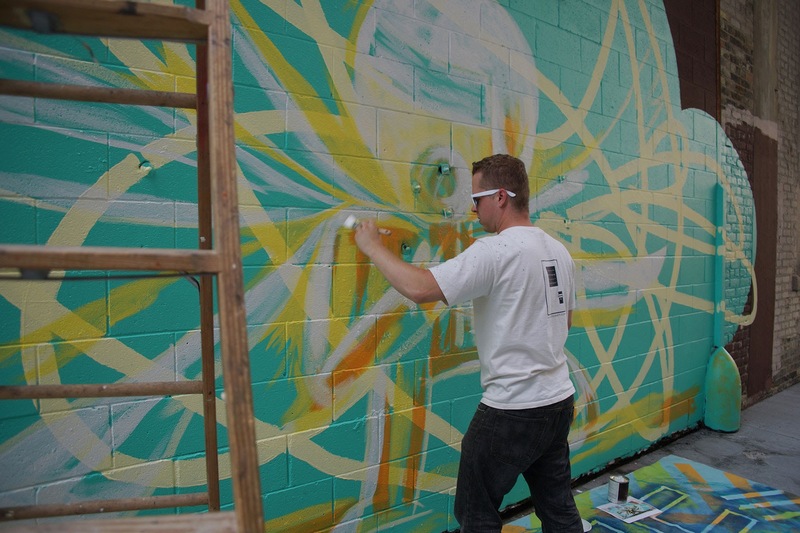 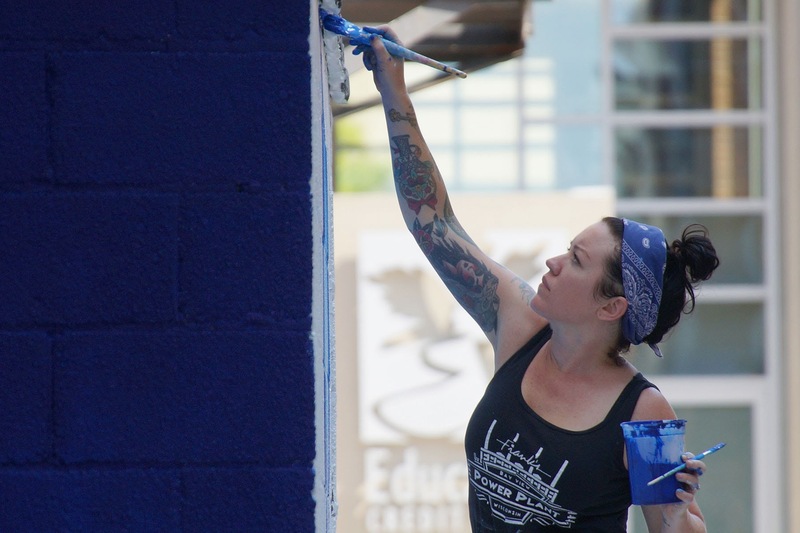 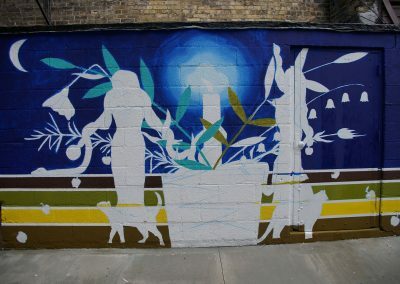 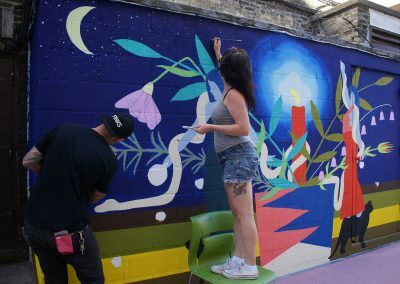 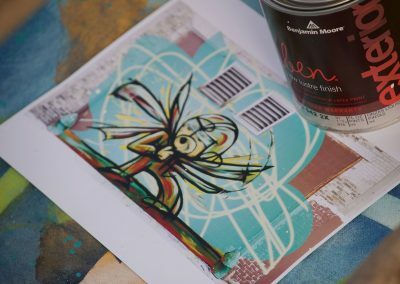 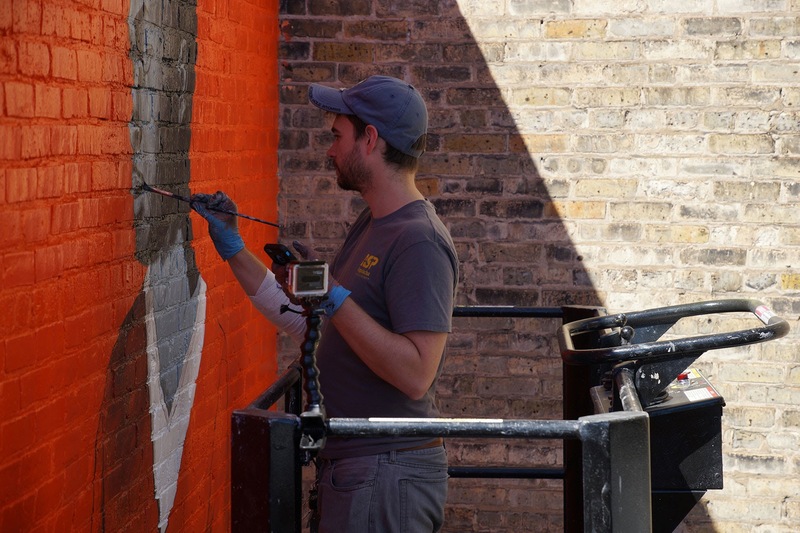 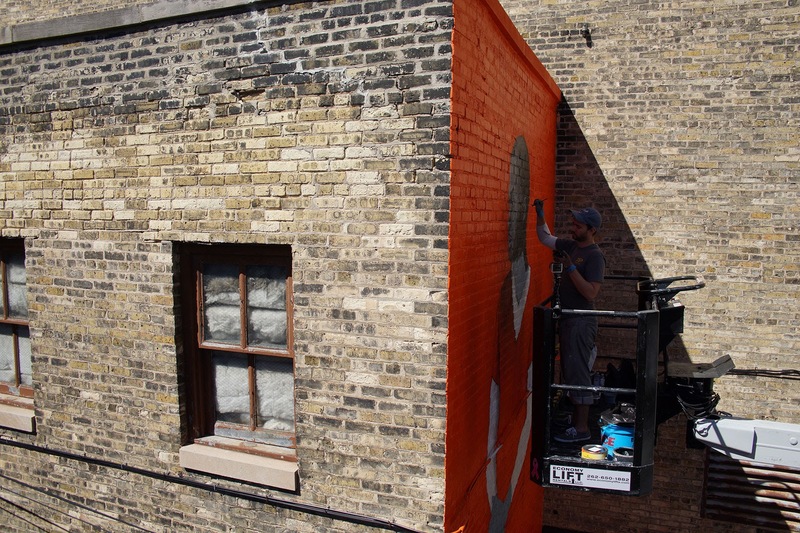 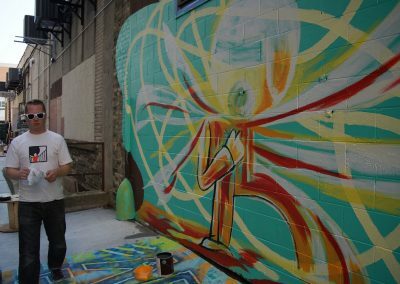 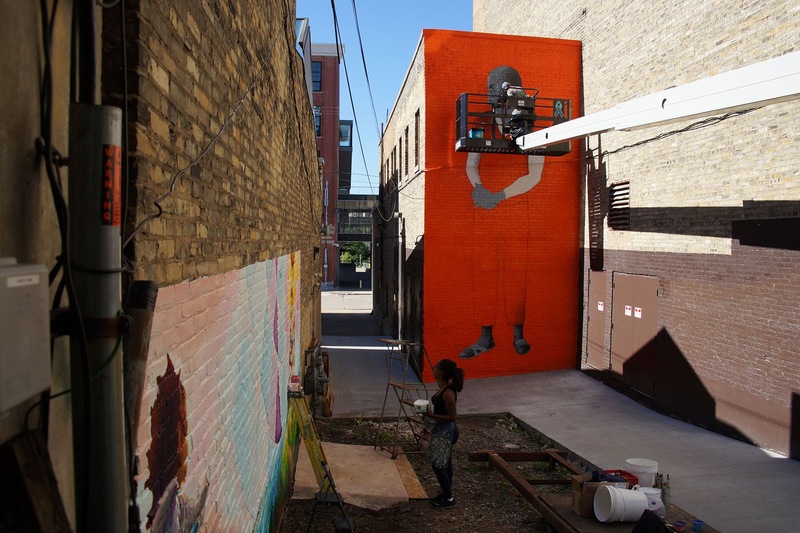 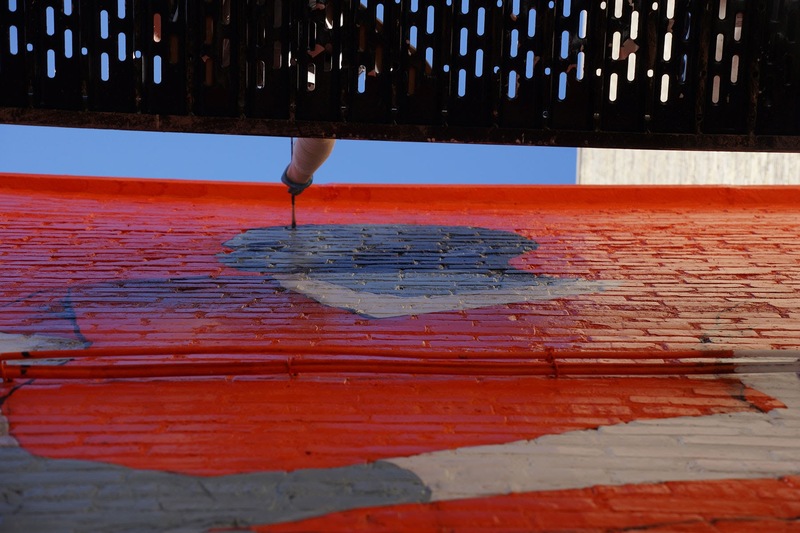 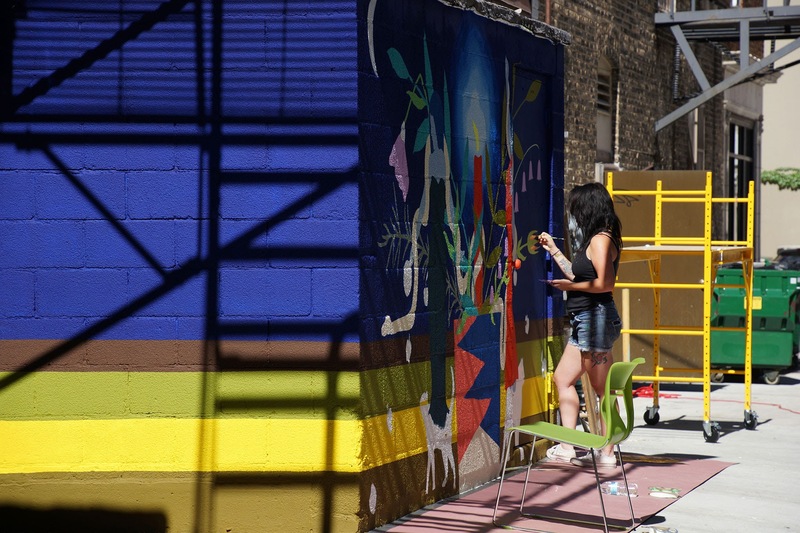 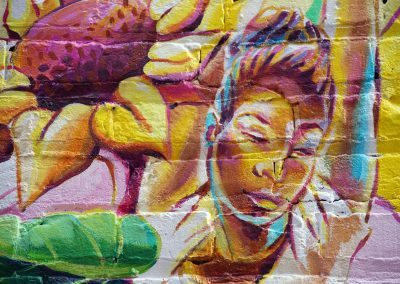 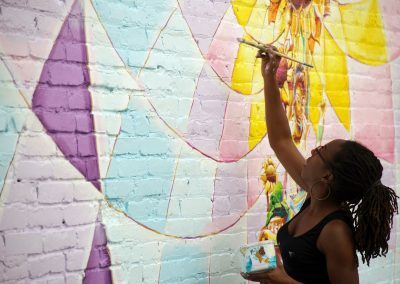 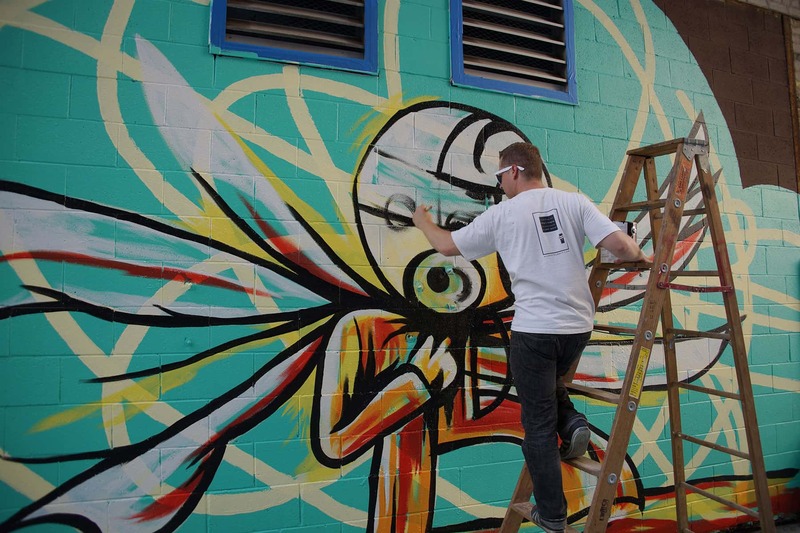 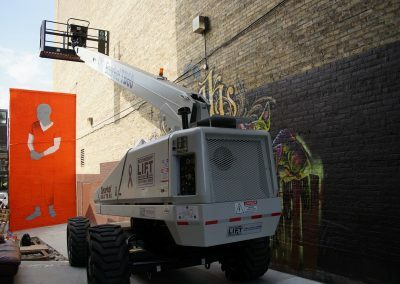 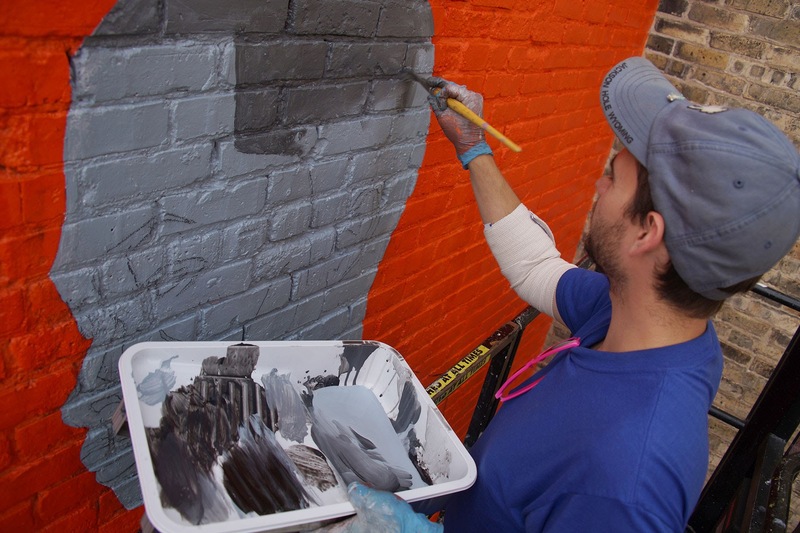 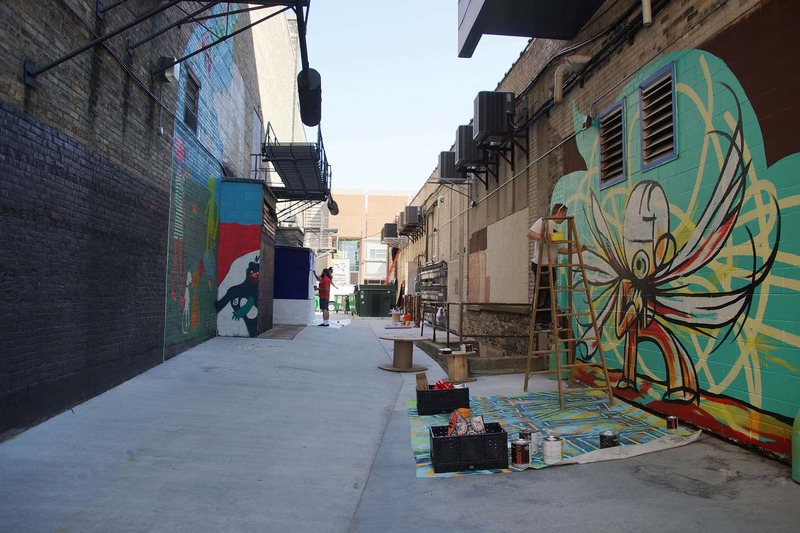 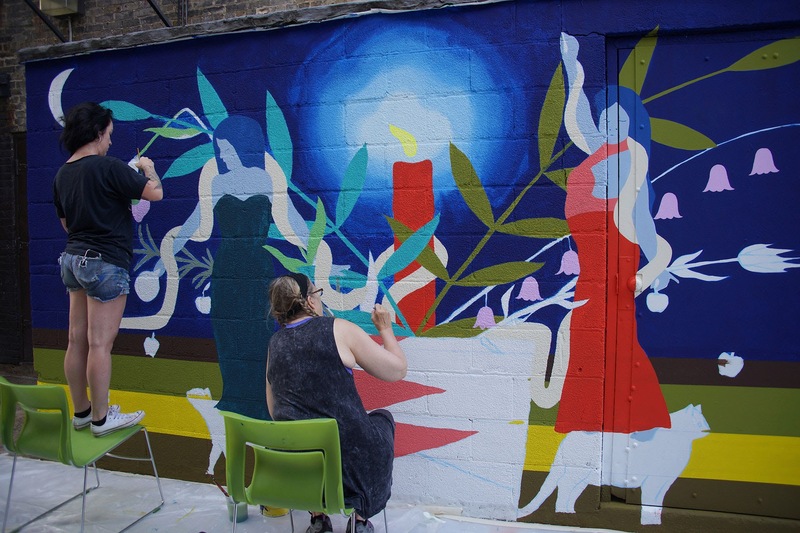 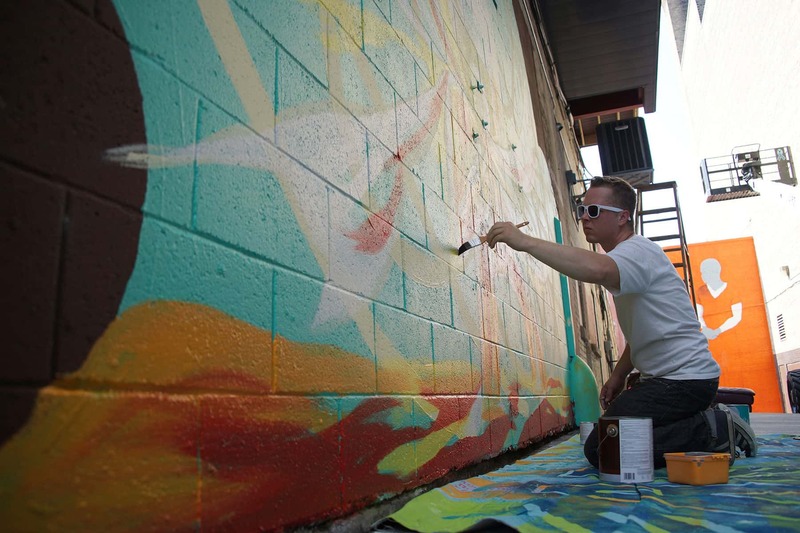 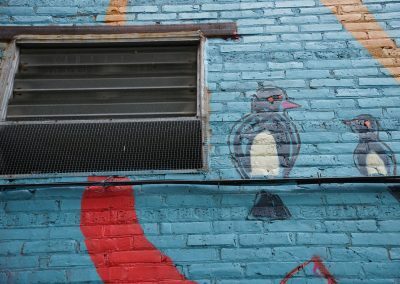 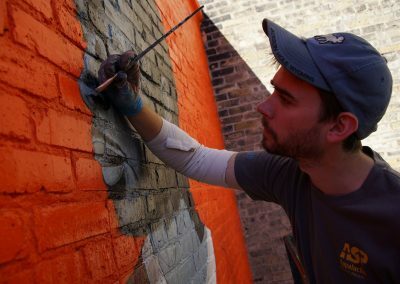 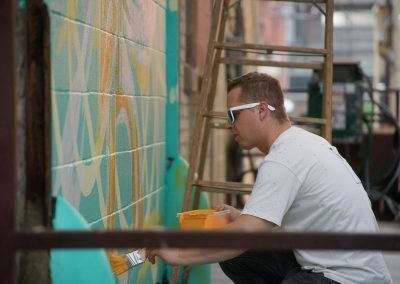 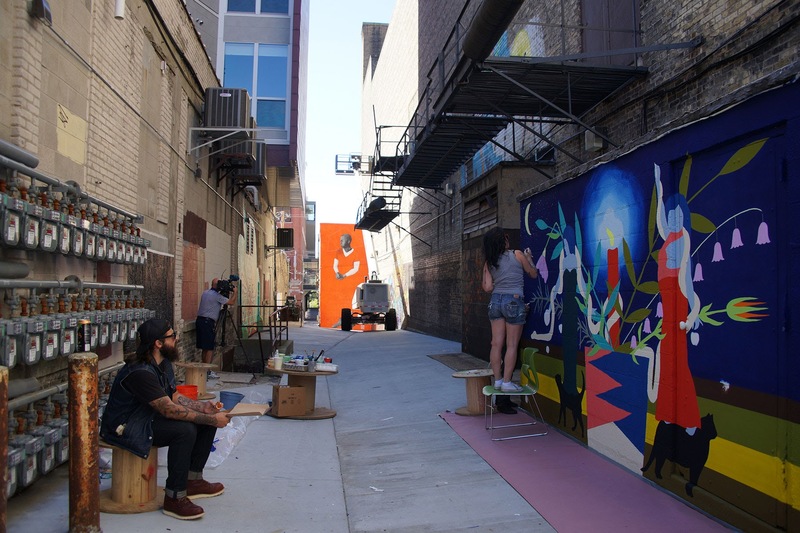 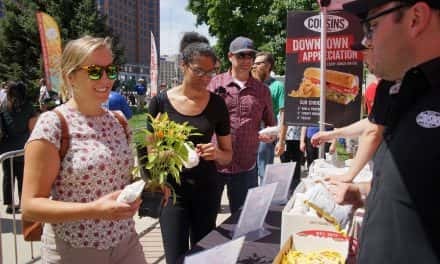 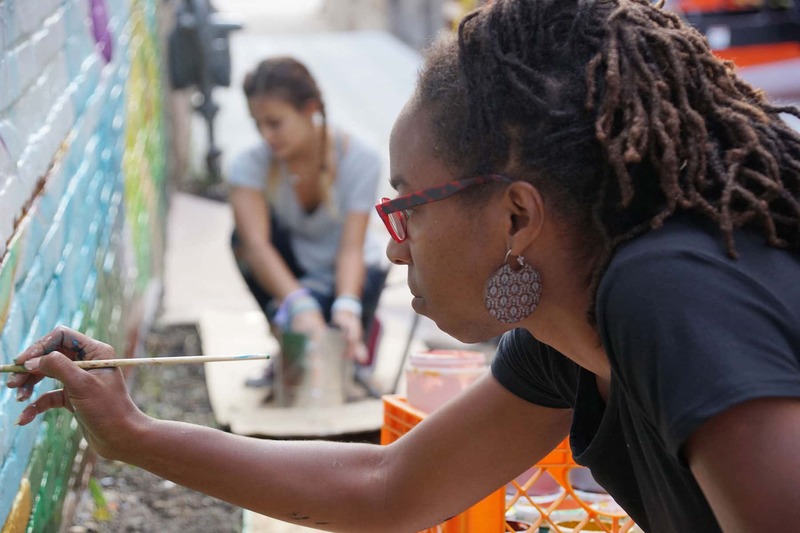 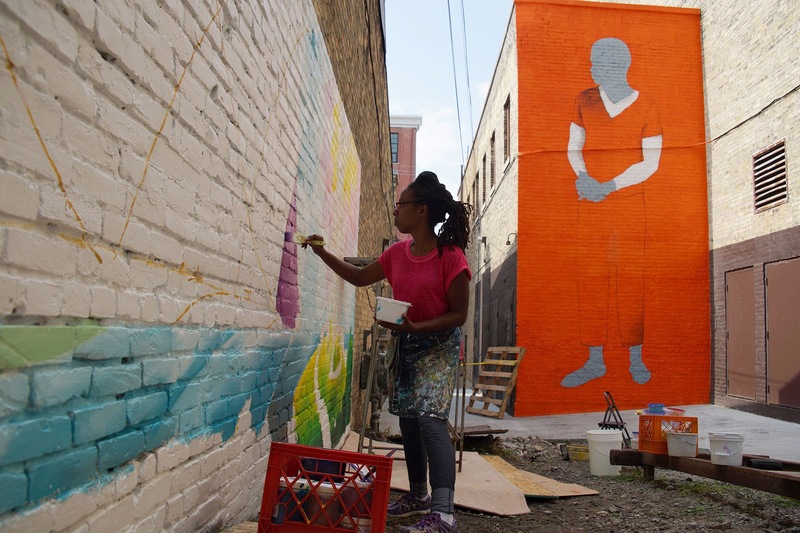 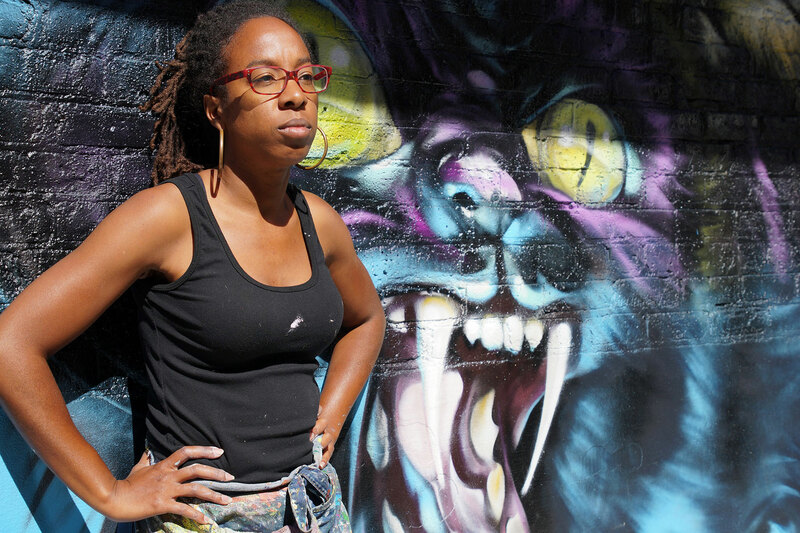 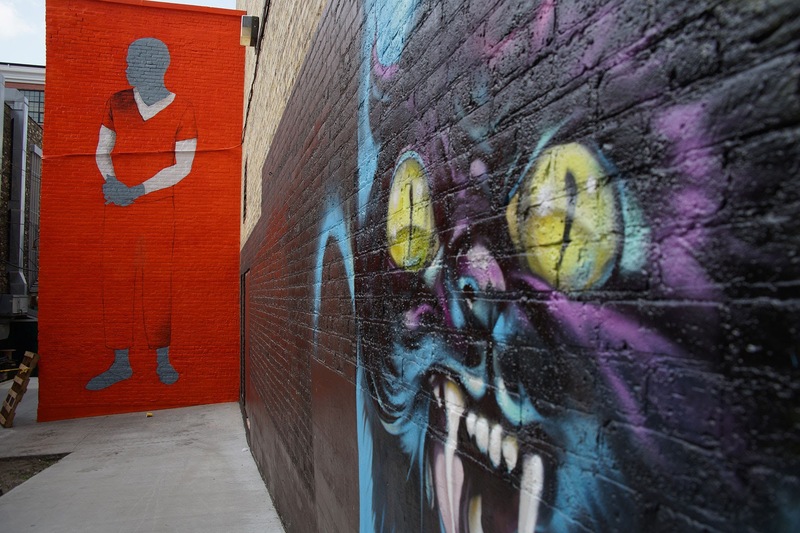 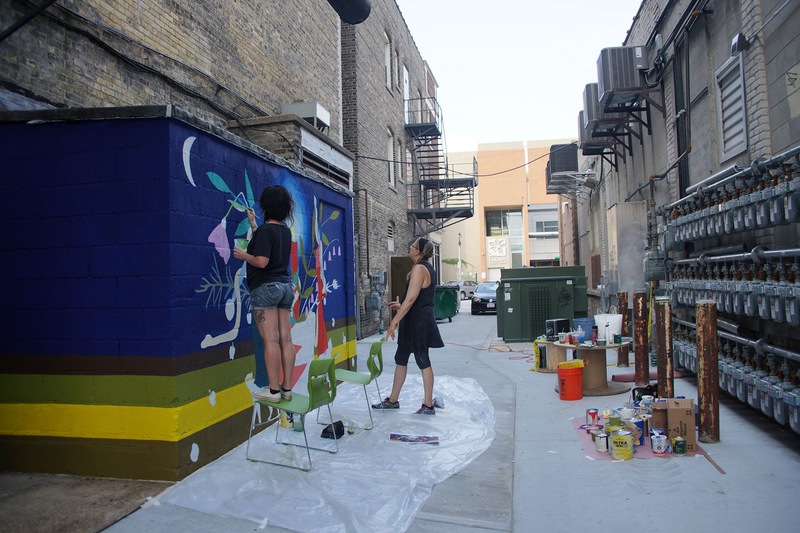 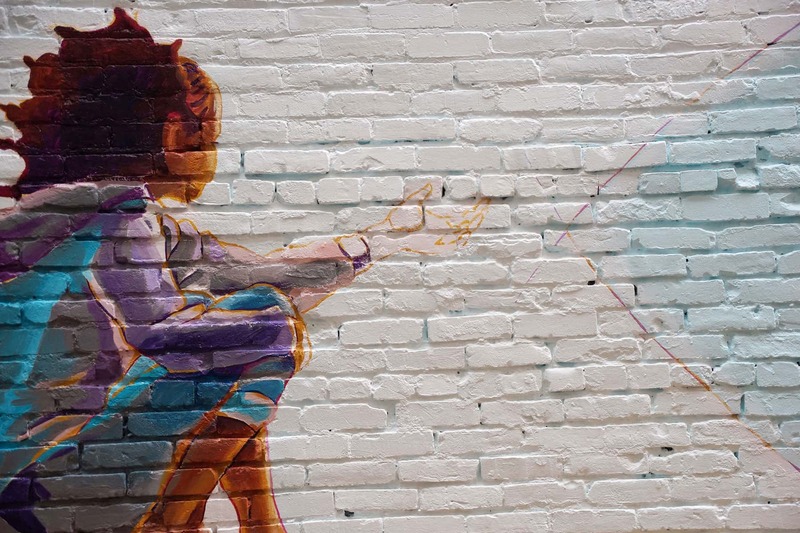 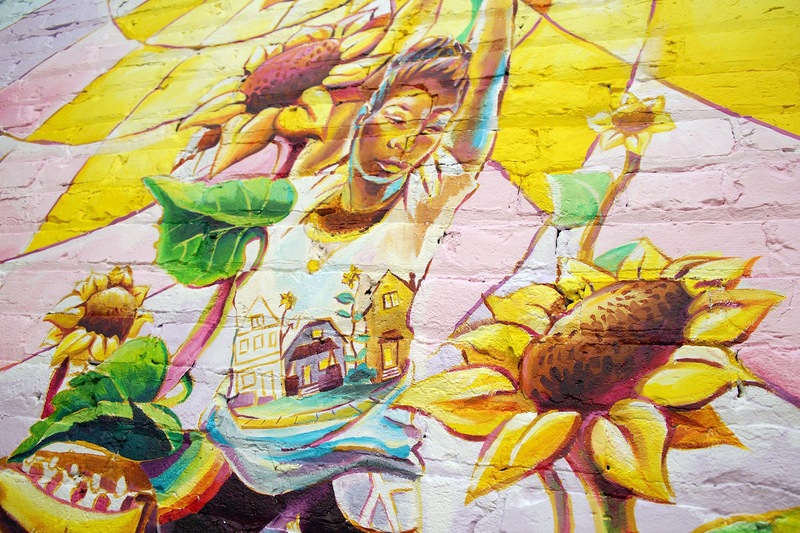 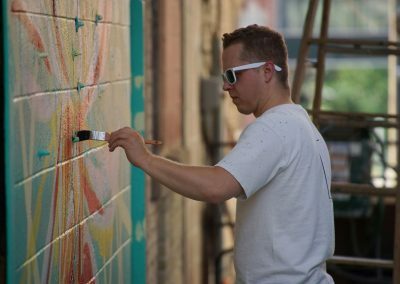 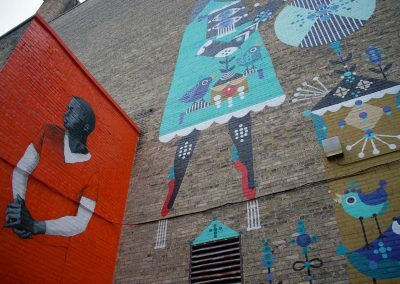 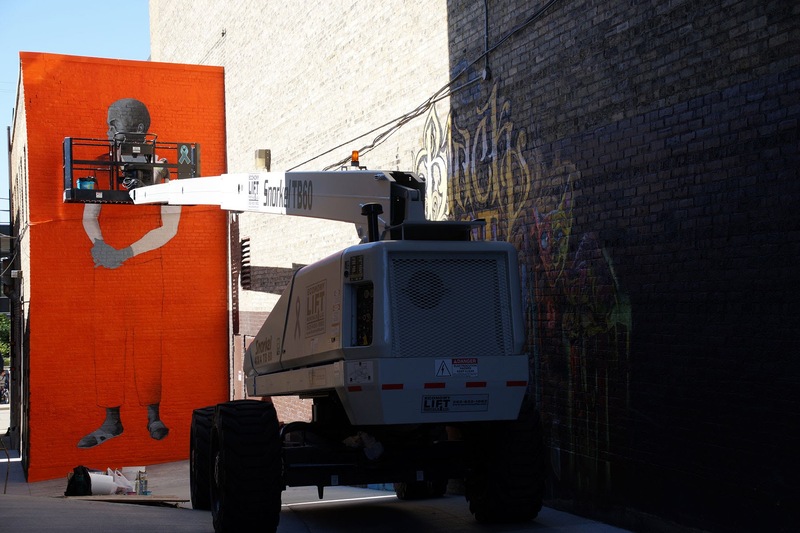 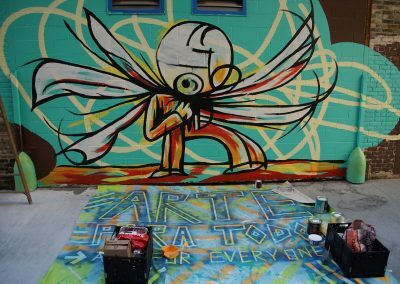 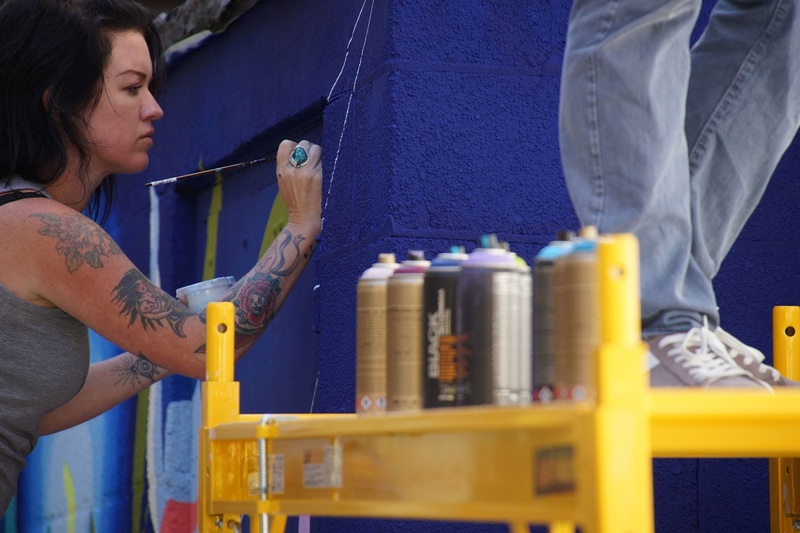 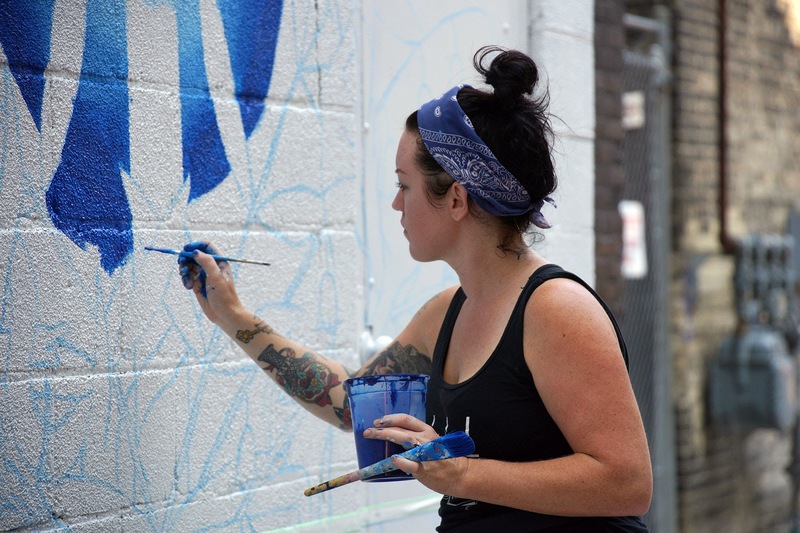 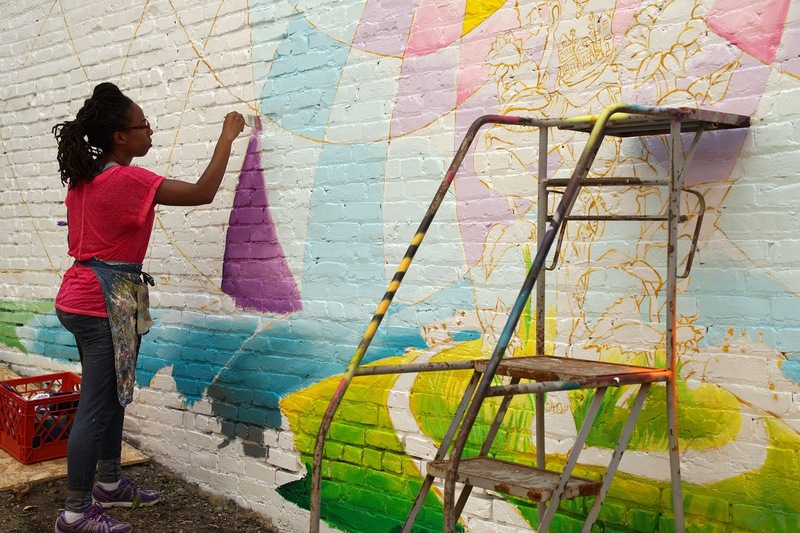 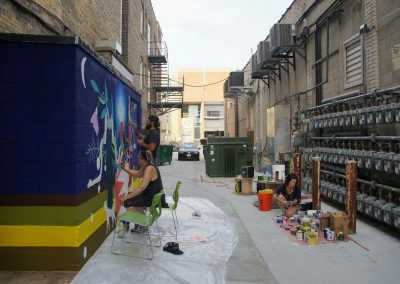 The Milwaukee Independent spent two weeks with the artists of Black Cat Alley, From September 5 to 17, documenting the progress of their installations at the two block stretch between Kenilworth Place to Ivanhoe Place on Milwaukee’s Historic East Side. 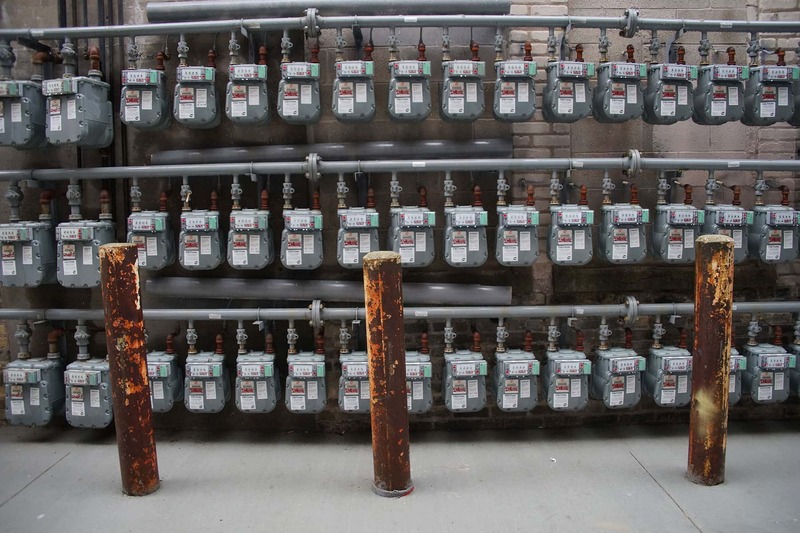 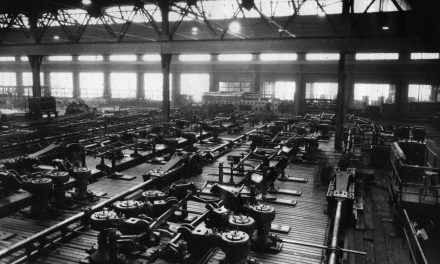 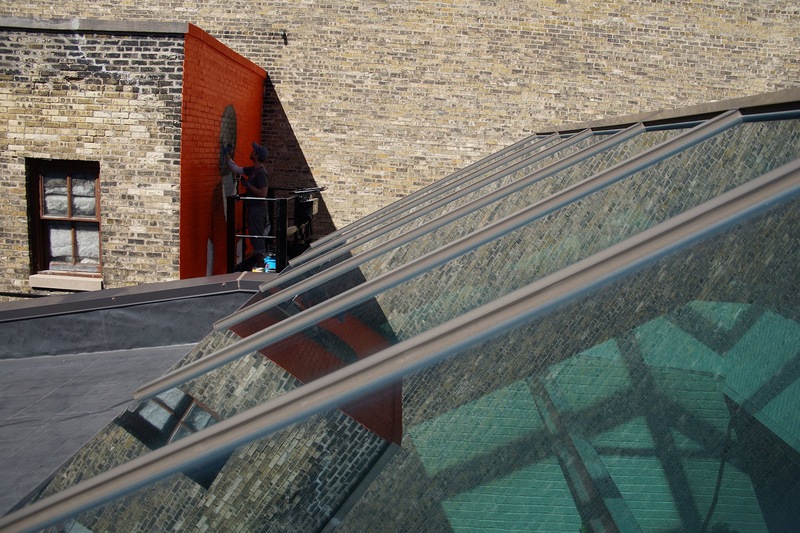 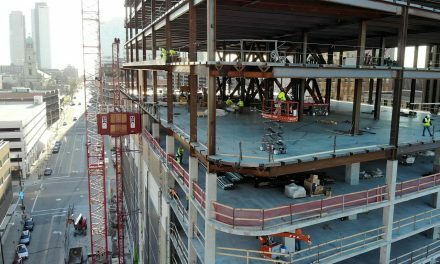 The location was opened to the public on September 18 and is free to visit 24/7. 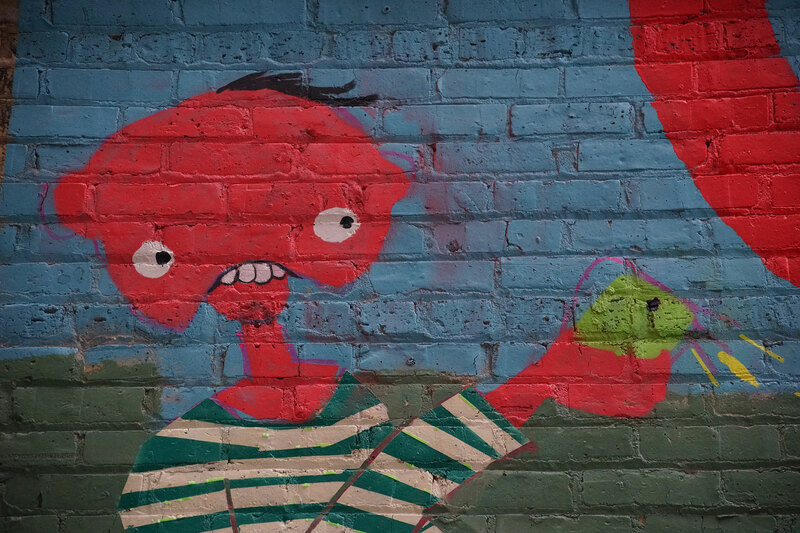 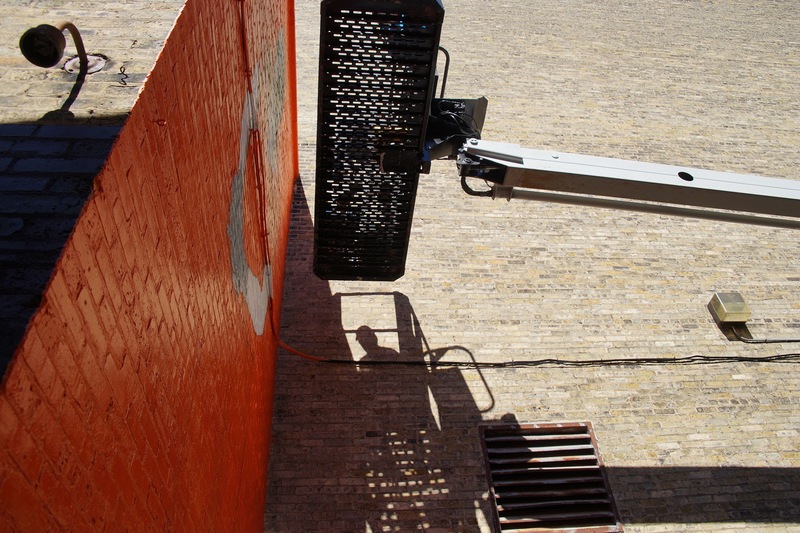 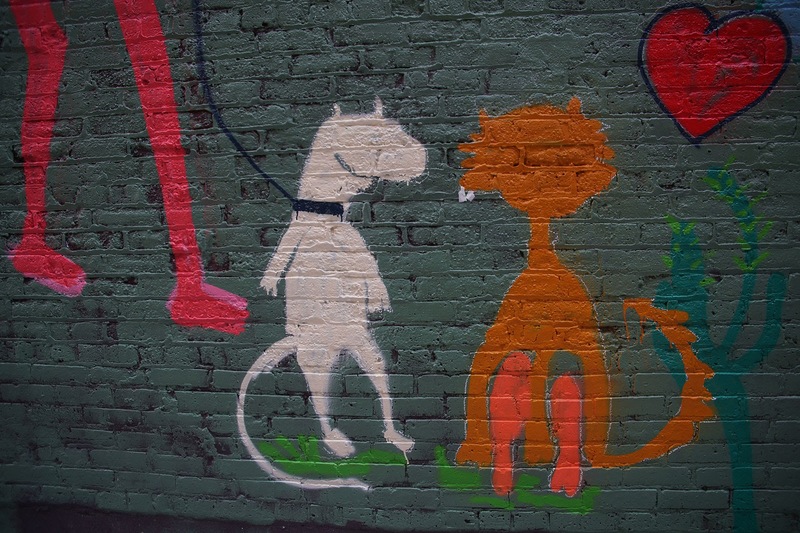 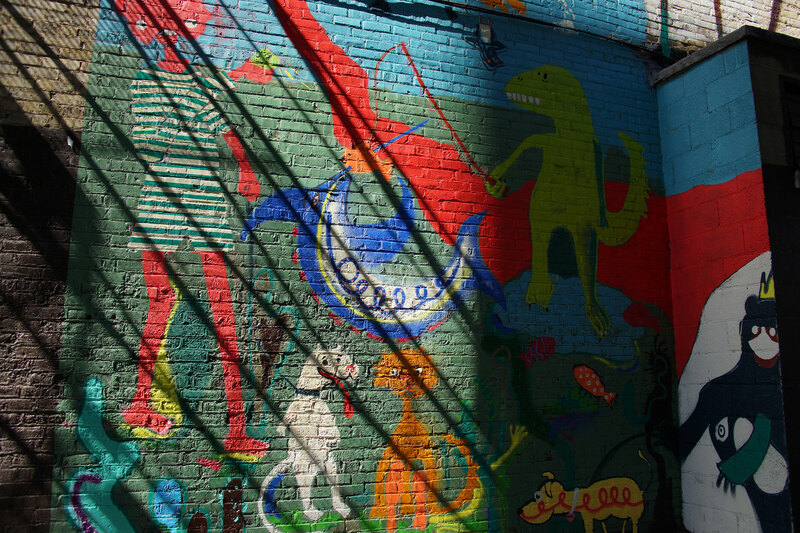 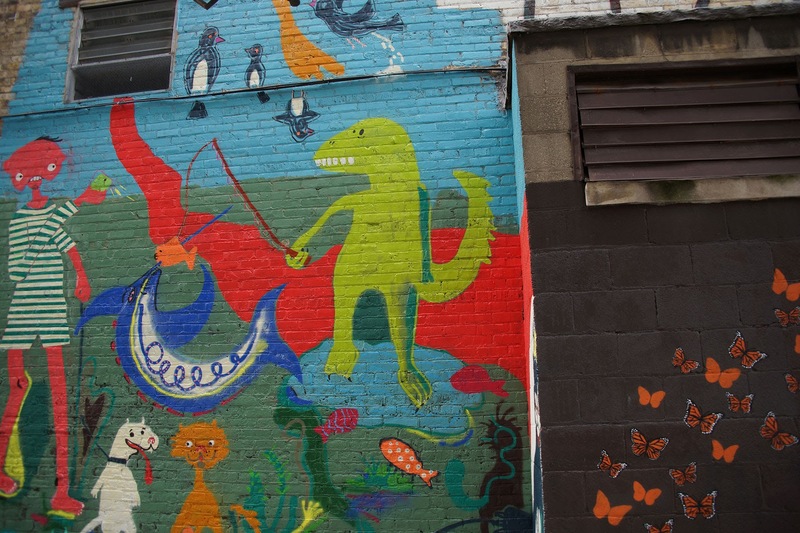 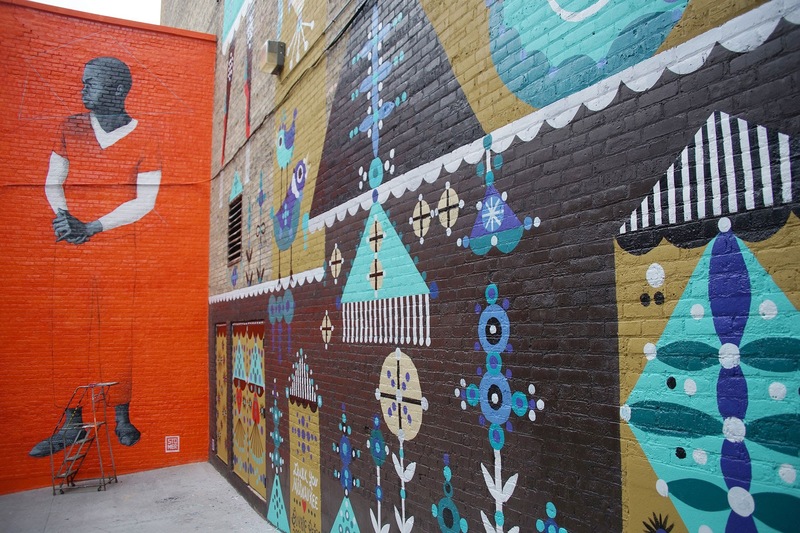 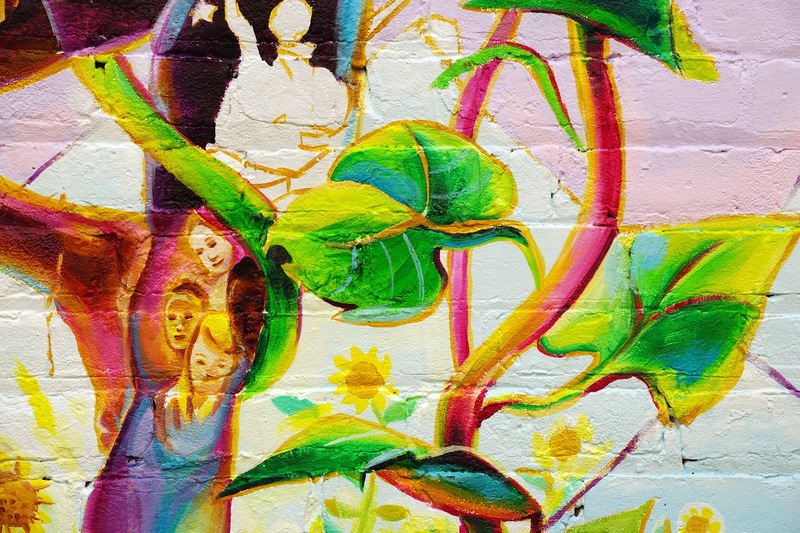 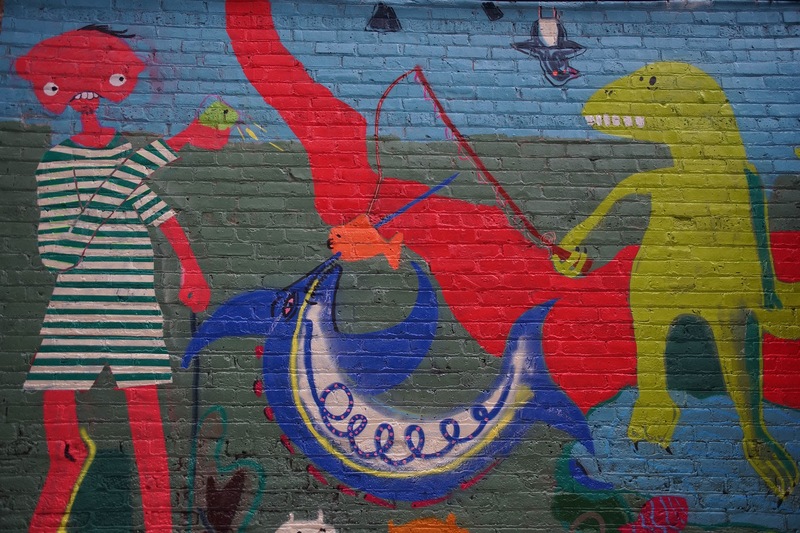 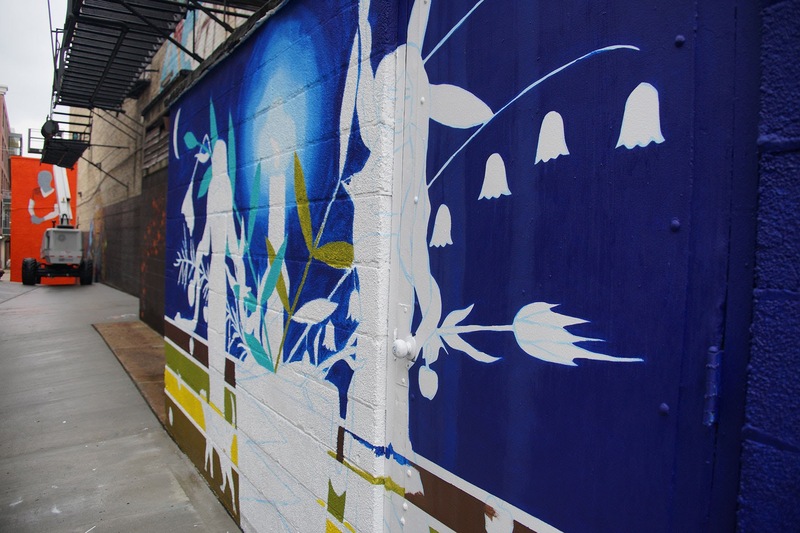 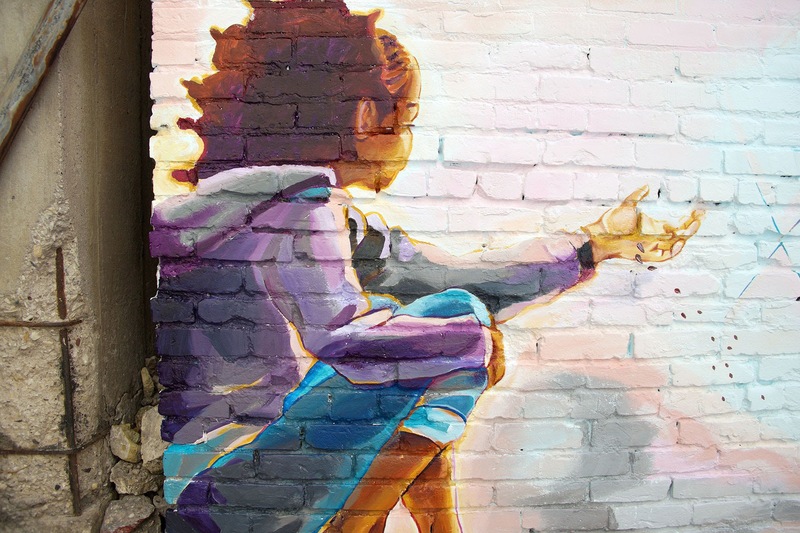 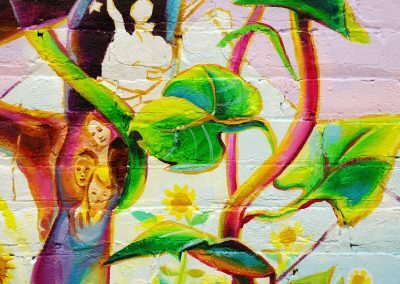 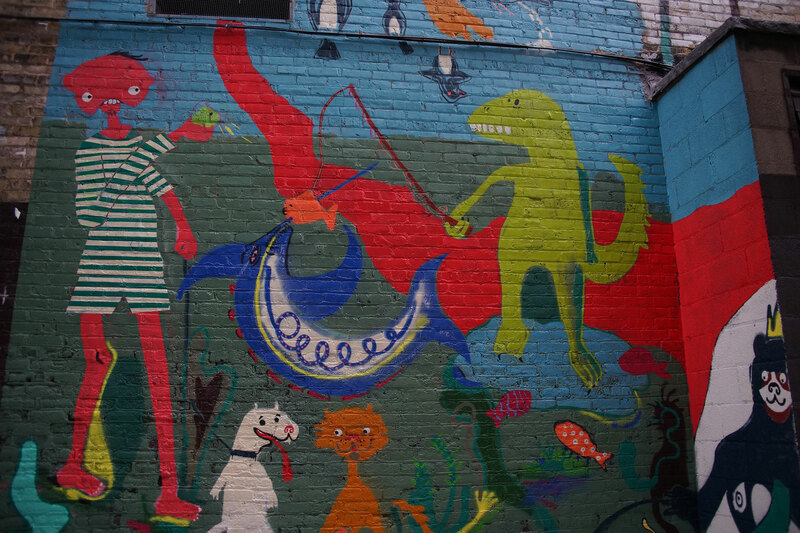 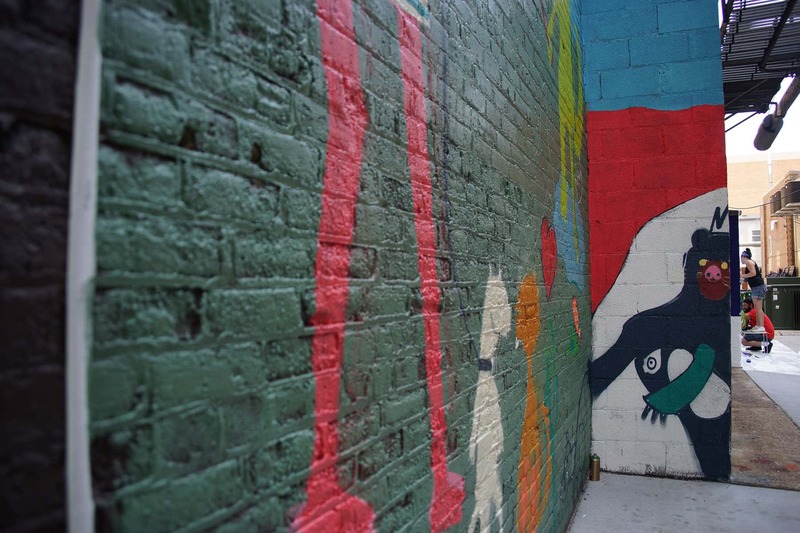 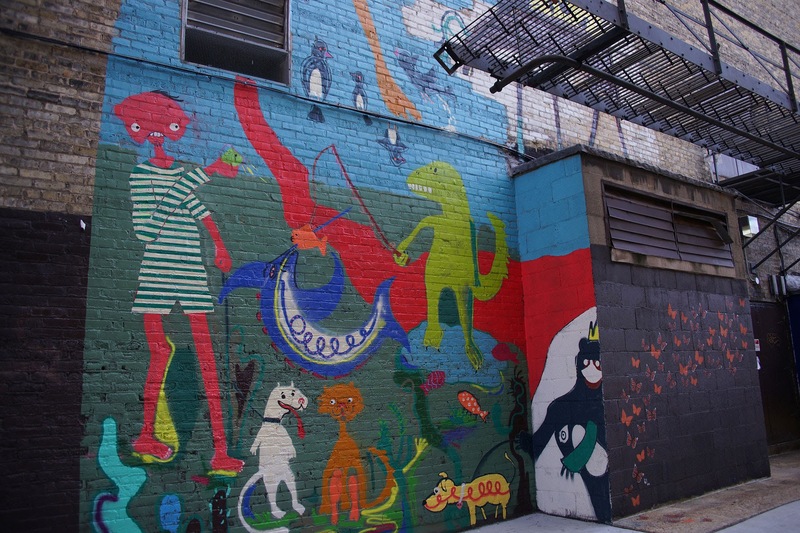 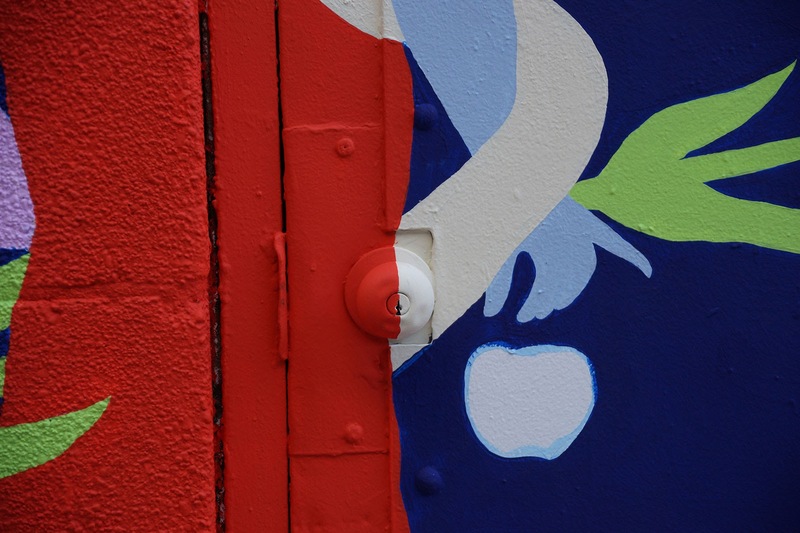 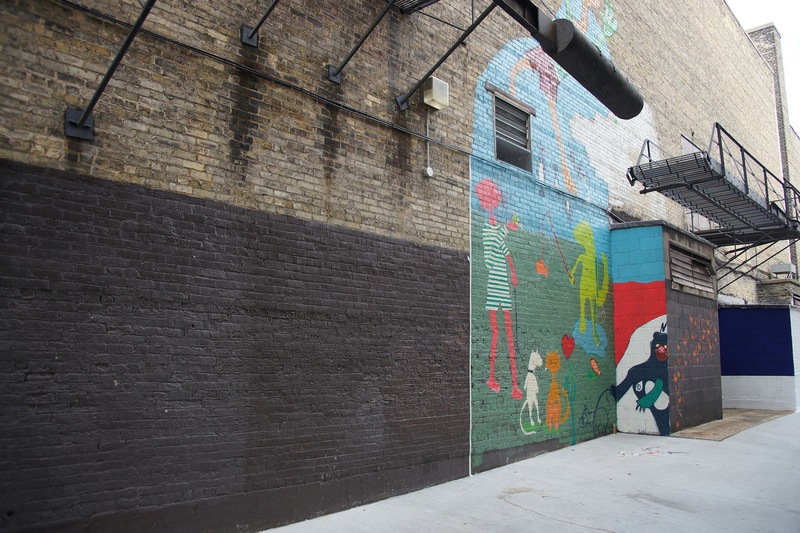 Each mural expresses a story, filing the alley with a tapestry of messages. 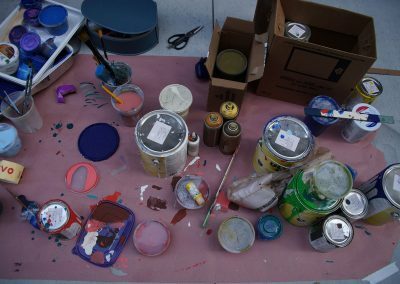 Just as the art should speak for itself, this photo essay takes an intimate behind-the-scenes look at what was involved in the production of the transformative art experience. 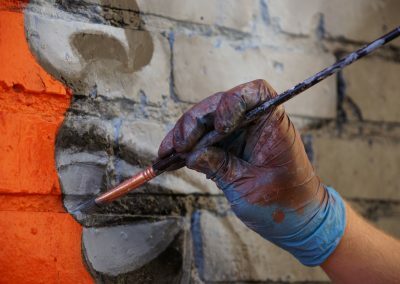 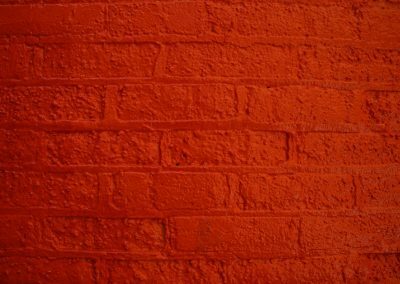 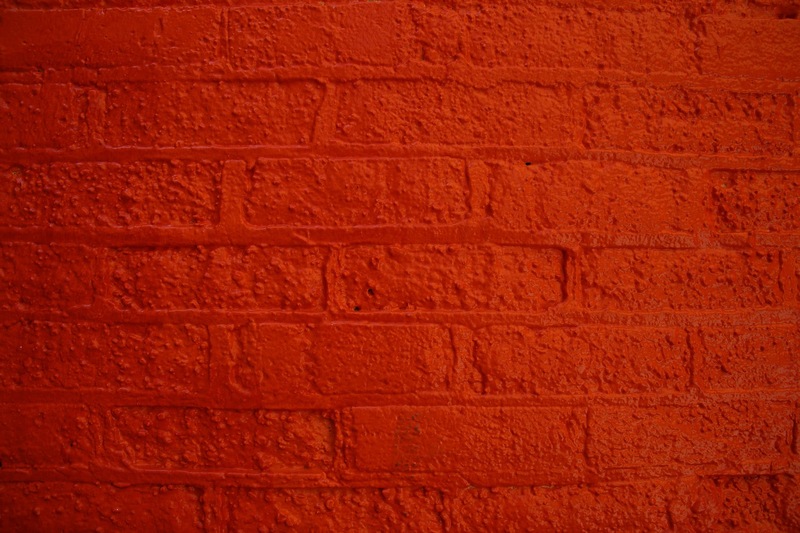 The artists greatest expression is in the result of their work. 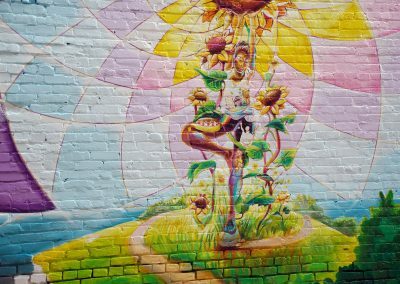 These images are moments along that journey. 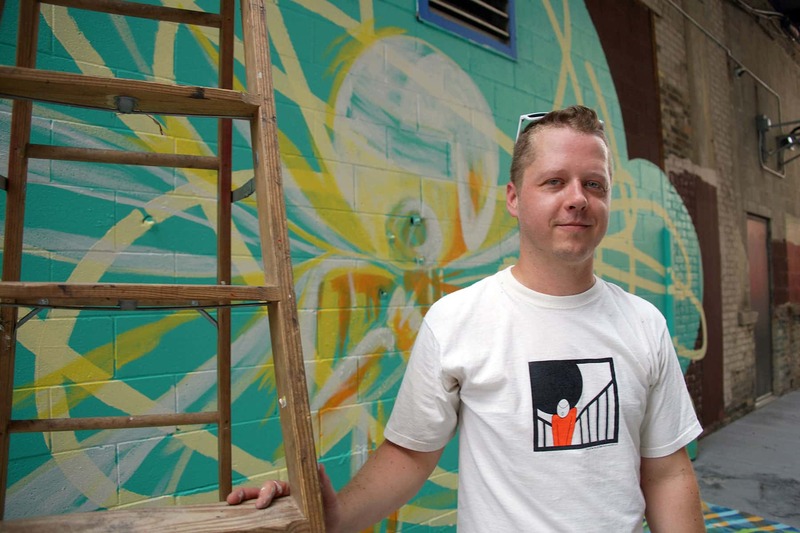 Jeff Redmon is a Milwaukee-based artist focused on creating abstract paintings and drawings, but also works in printmaking, collage, digital imagery and experimental art with found objects. 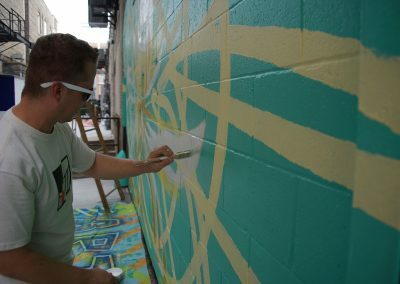 Redmon explores the depths of his subconscious, creating bold abstractions through the use of expressive line, vibrant color, pattern and composition. 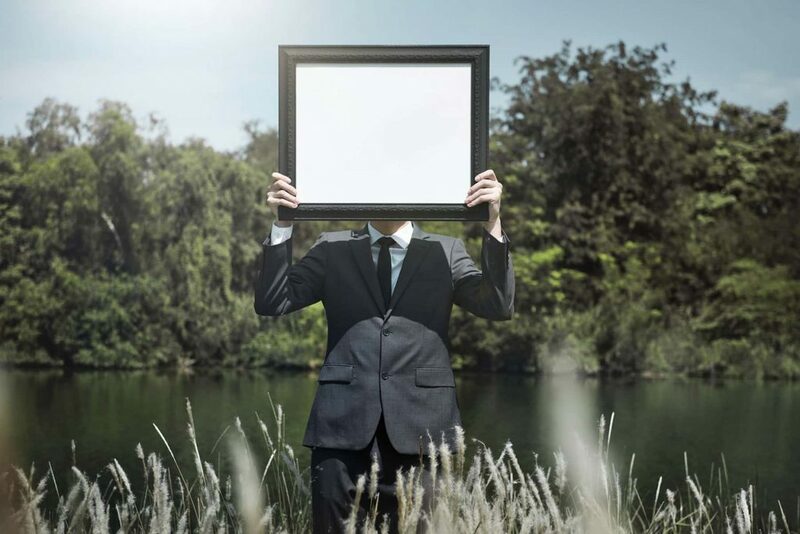 His abstract work tests the imagination of the viewer, many having unique interpretations, insights and connections to the art. 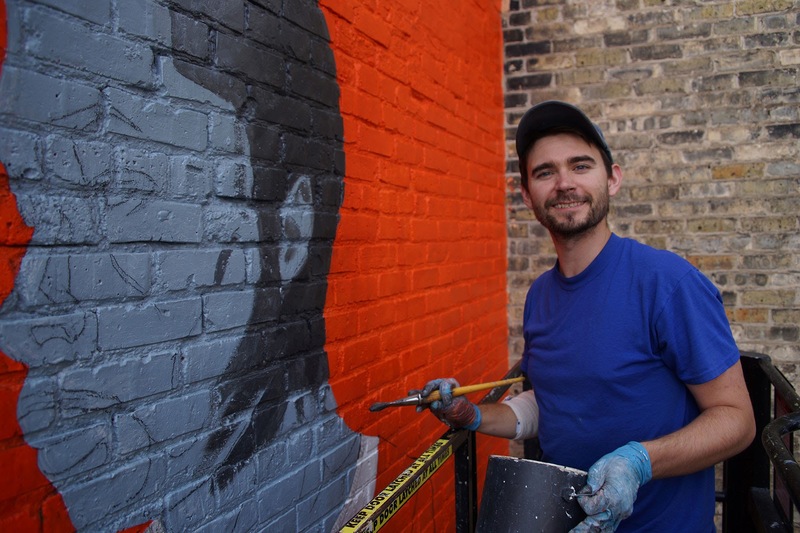 Originally from North Carolina and now an illustrator, painter and opera-stage-set maker in Milwaukee, Adam engages the audience with his mixed medium paintings that capture emotions and spark curiosity. 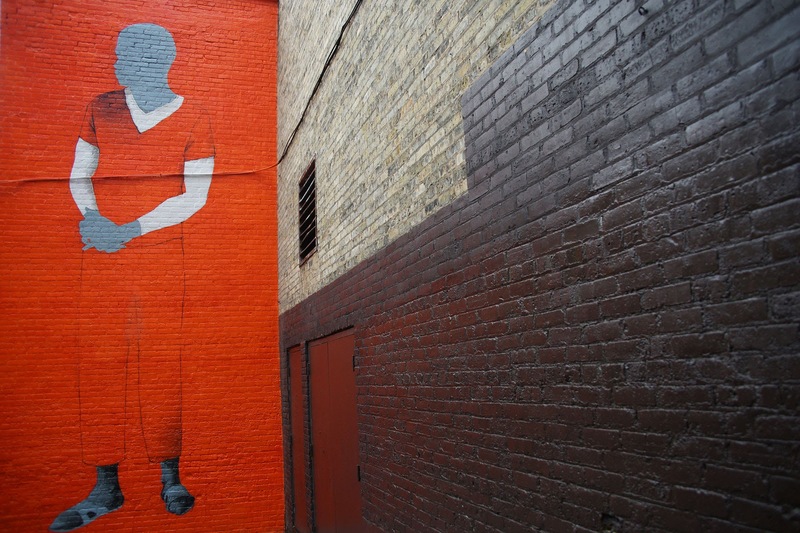 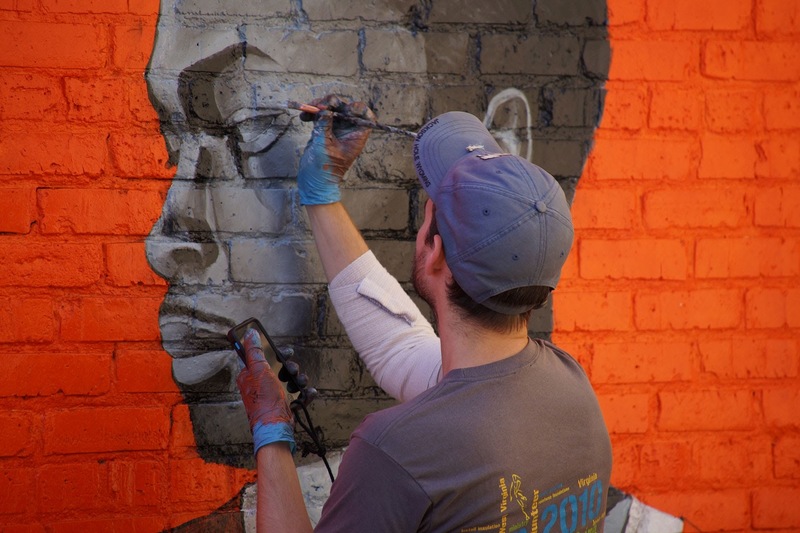 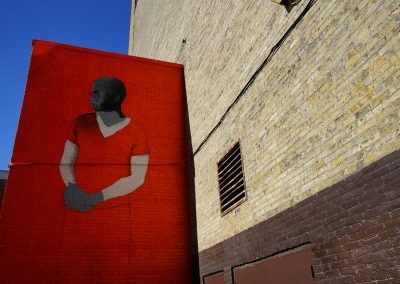 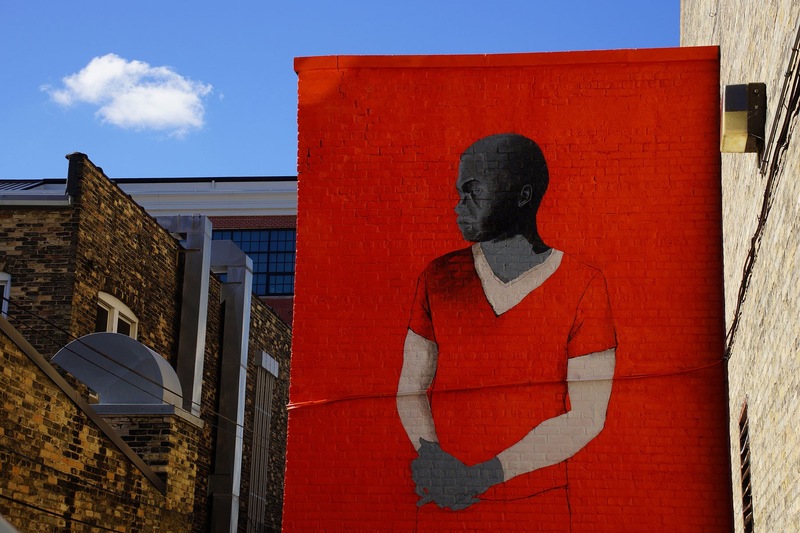 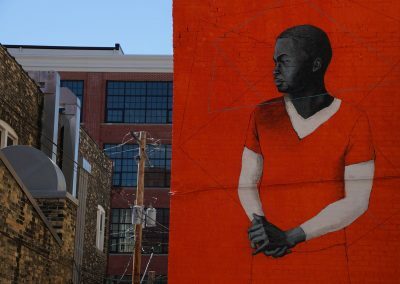 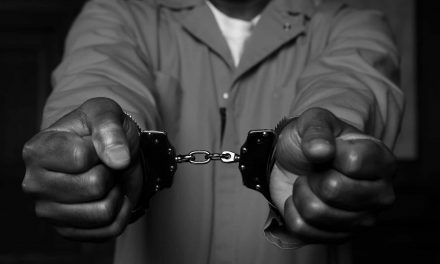 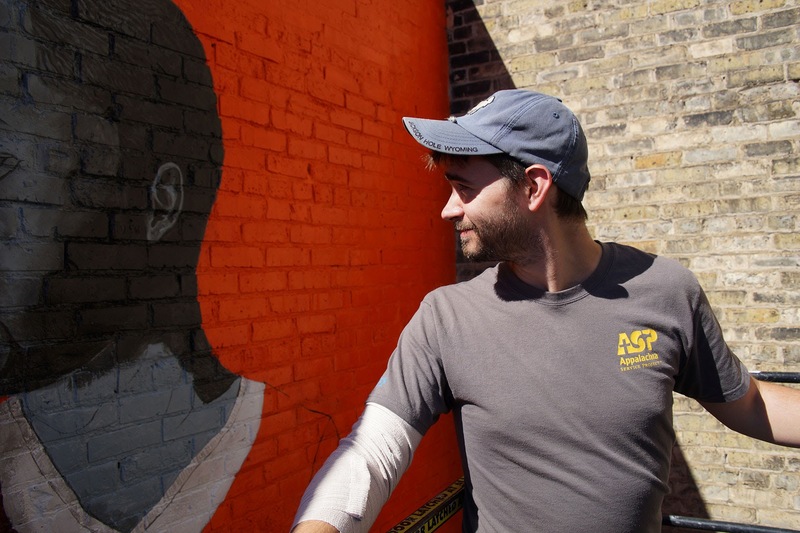 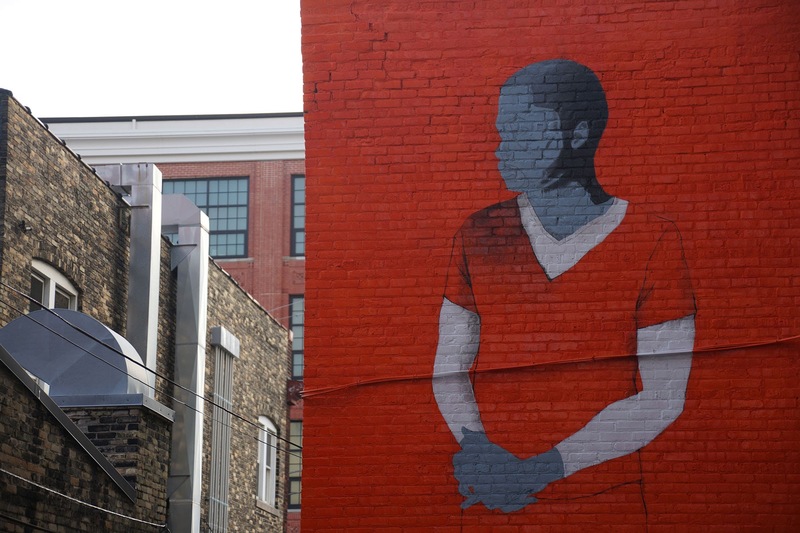 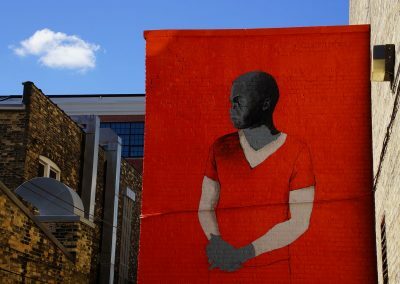 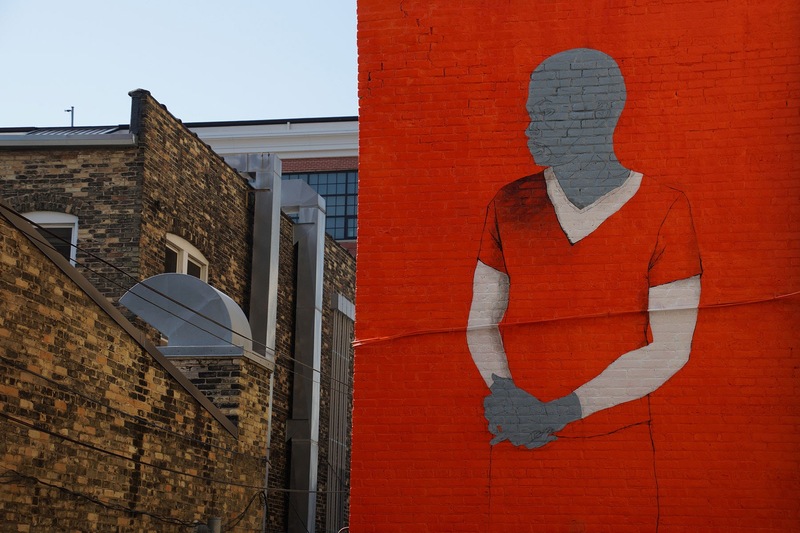 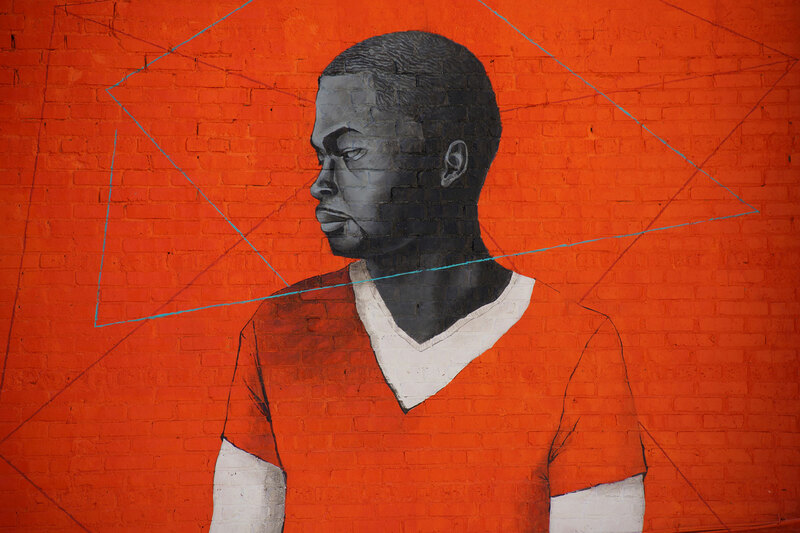 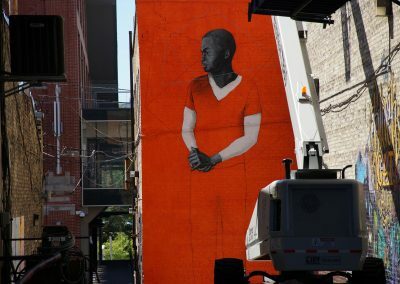 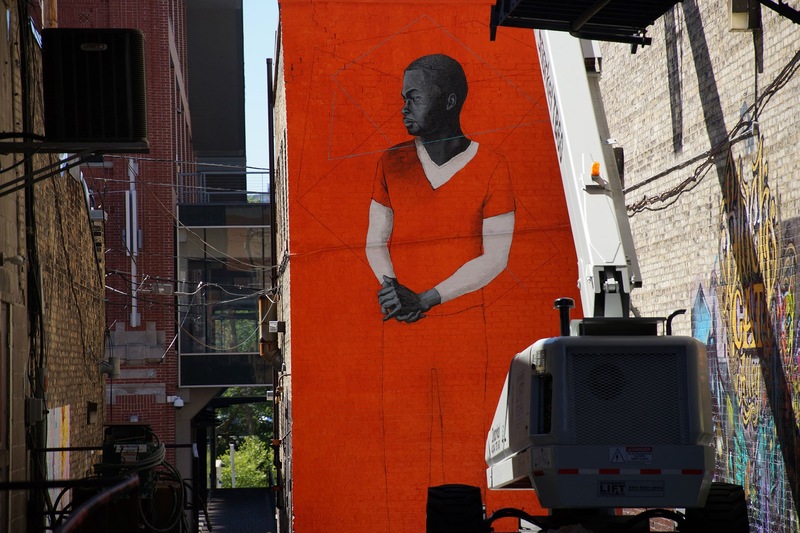 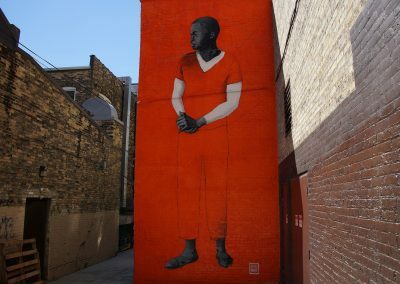 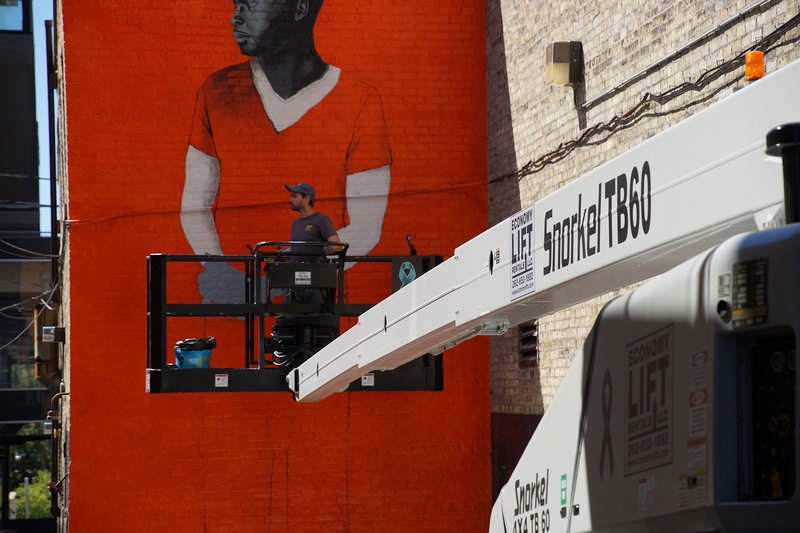 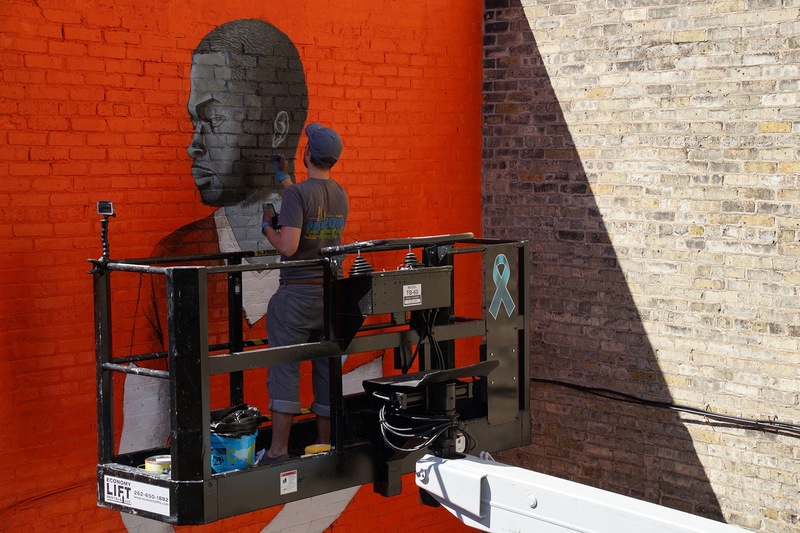 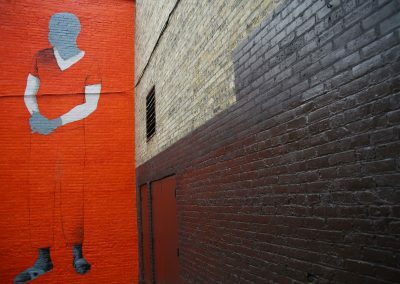 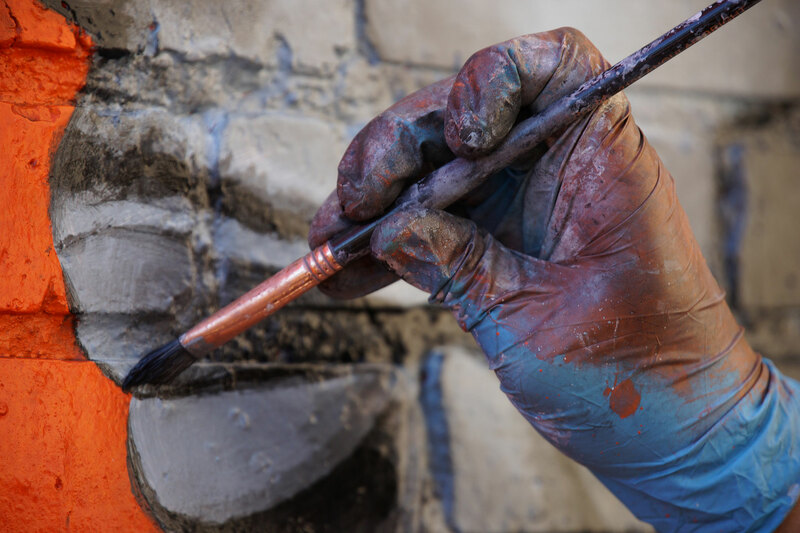 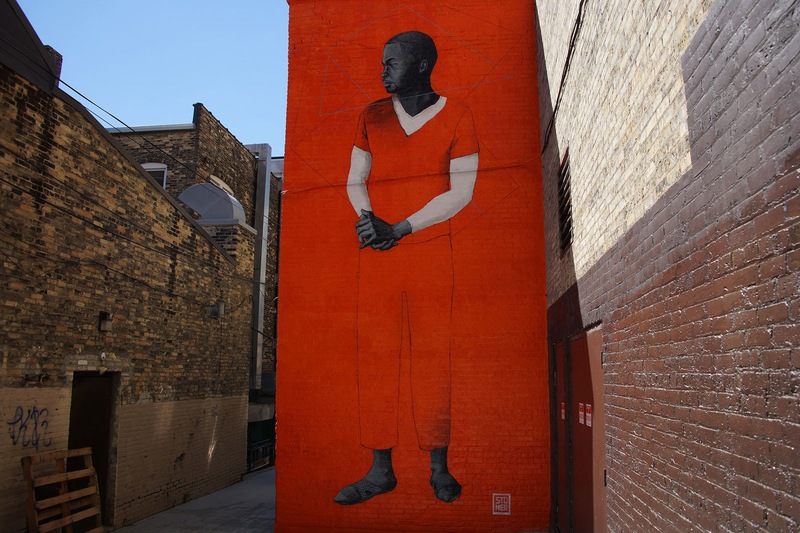 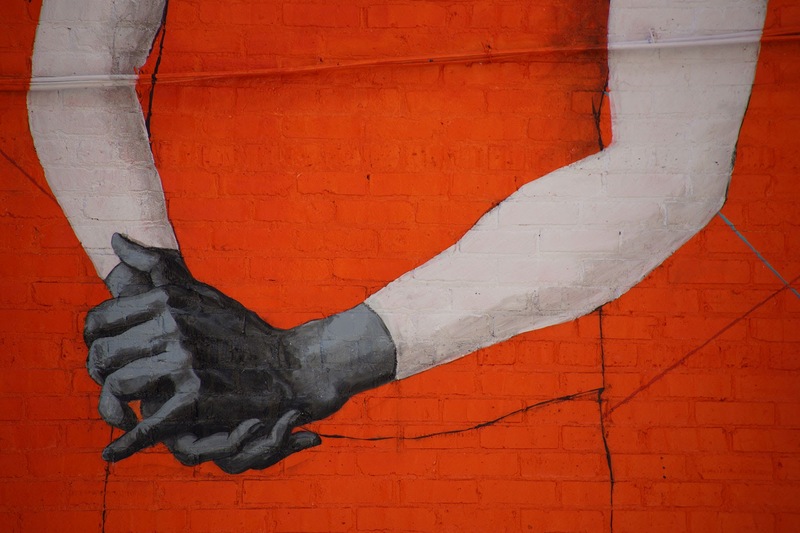 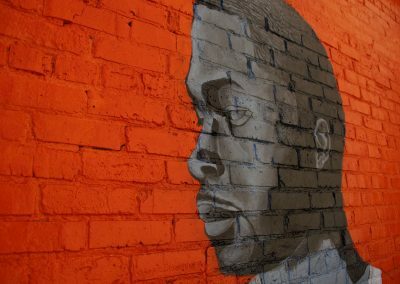 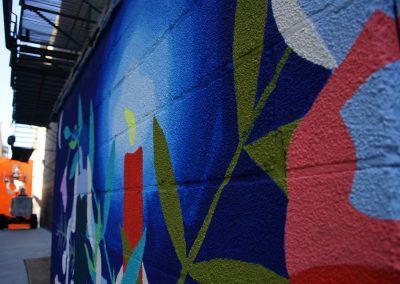 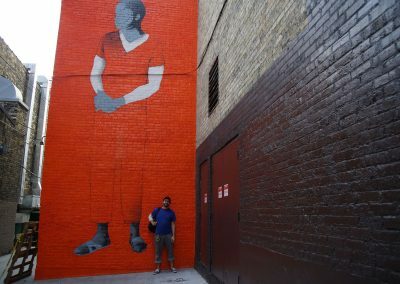 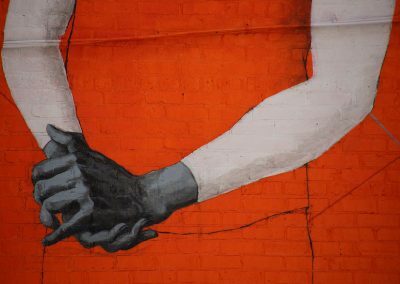 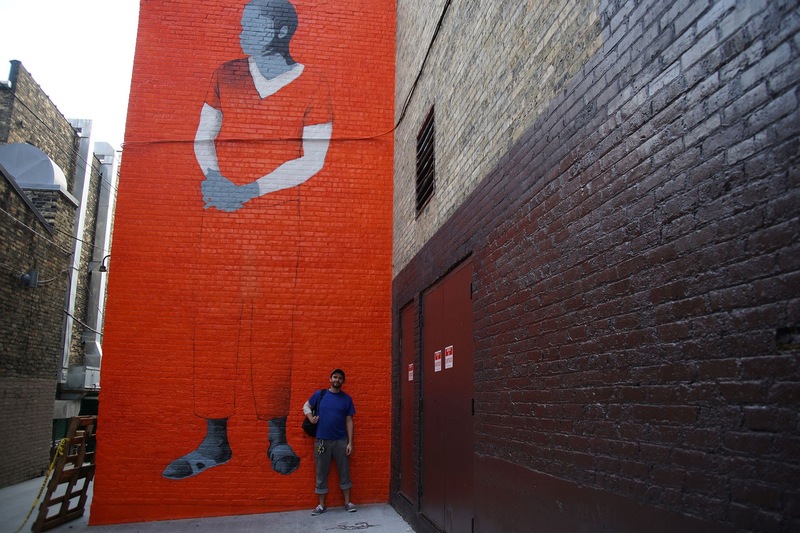 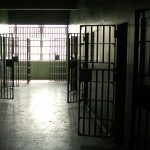 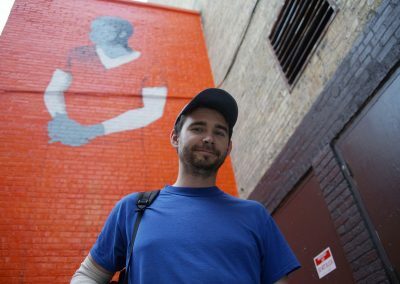 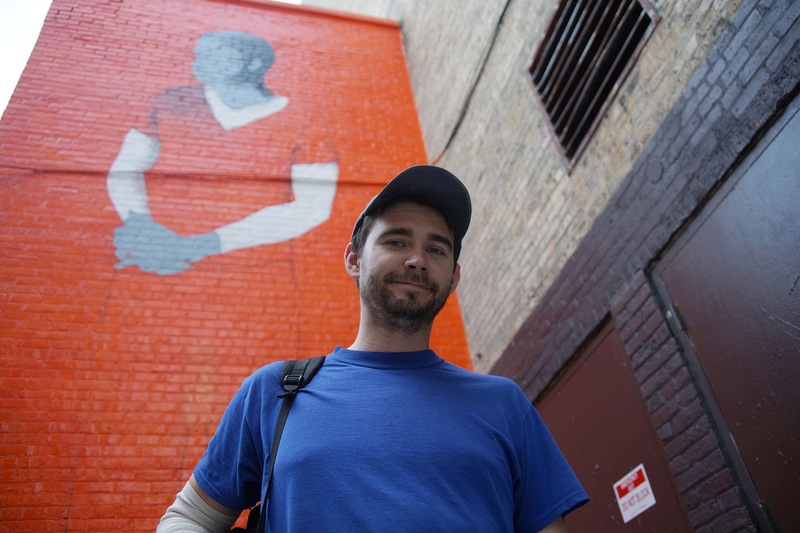 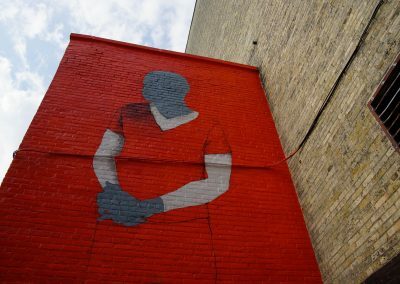 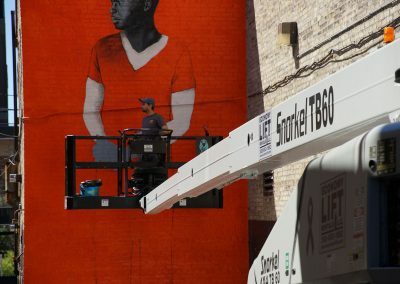 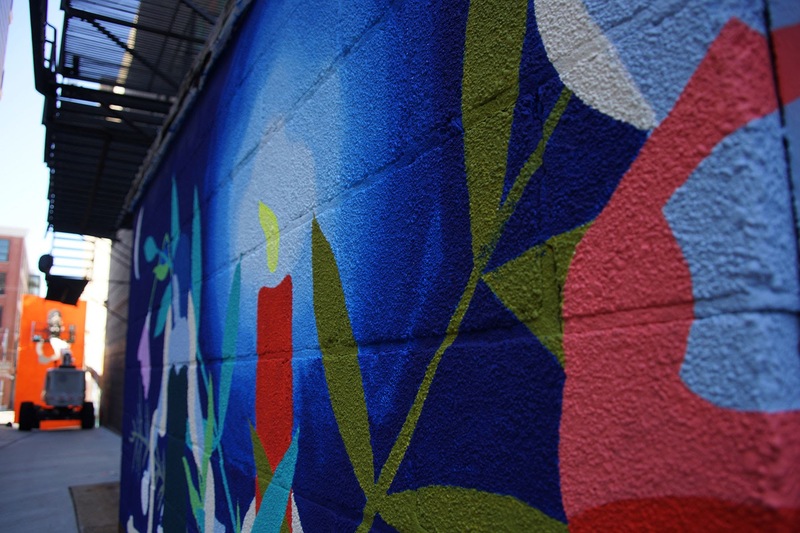 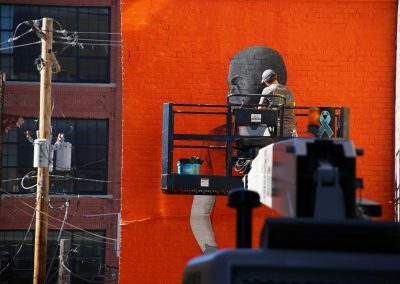 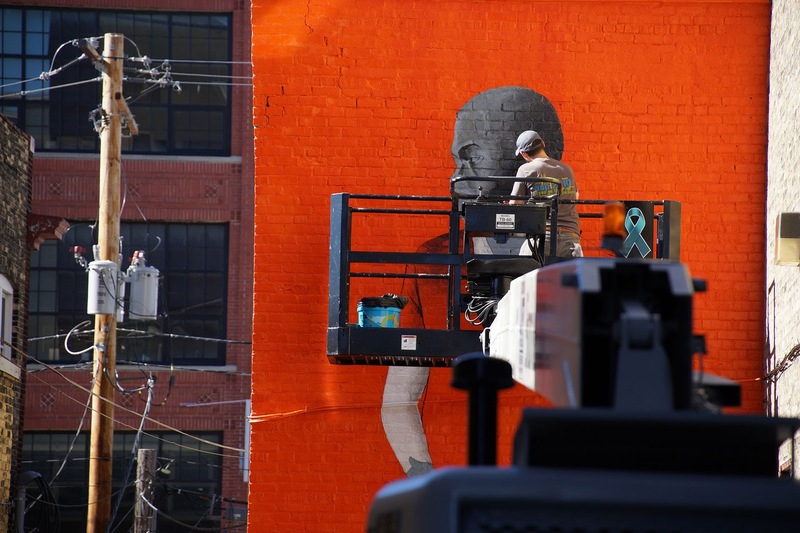 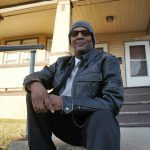 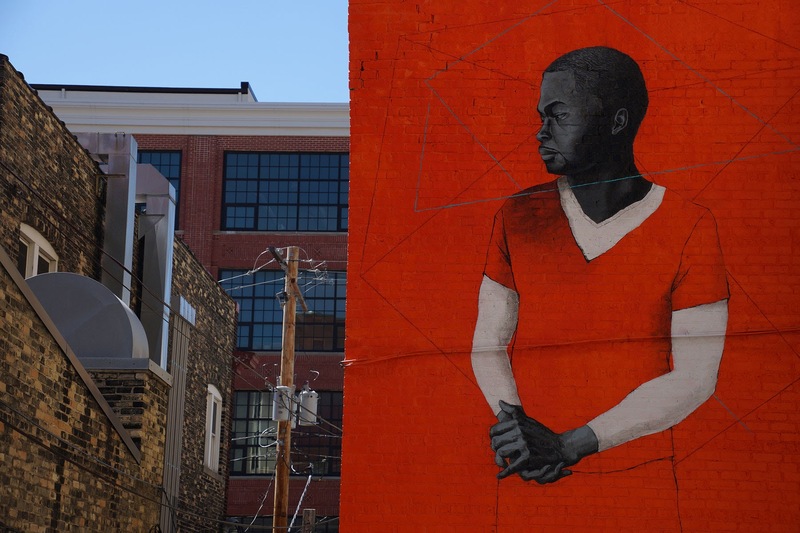 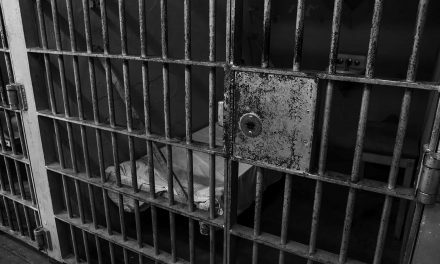 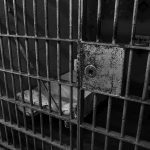 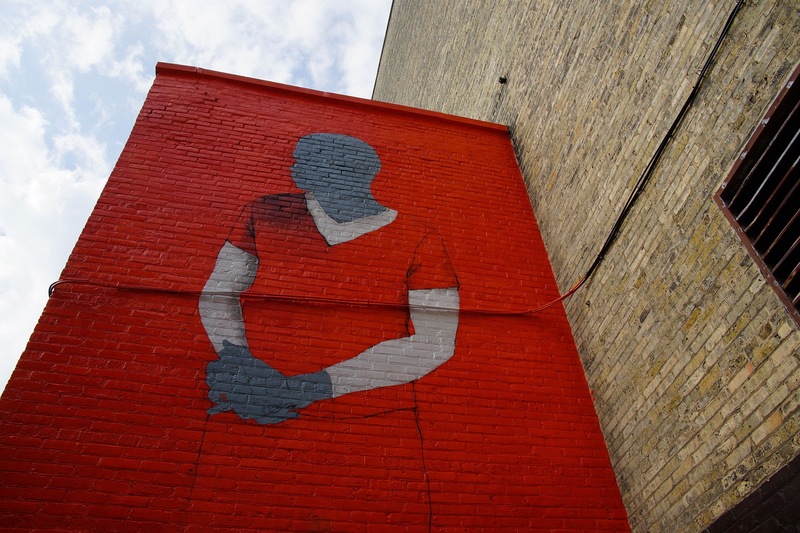 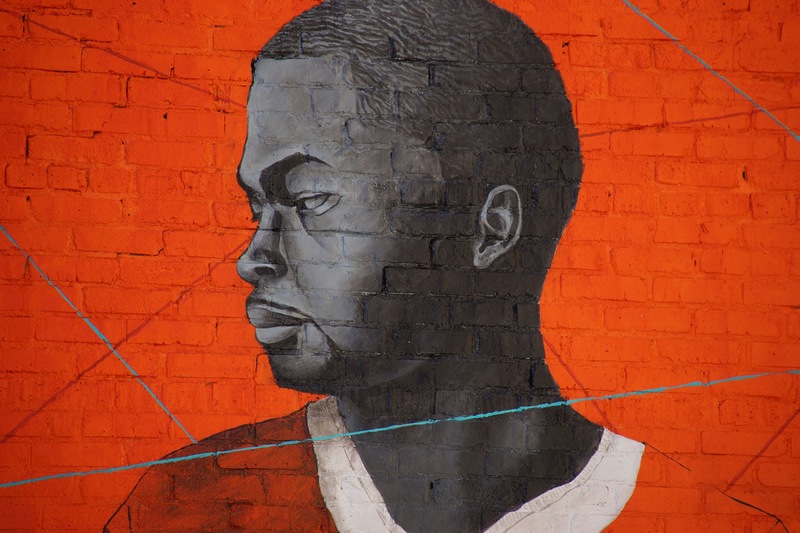 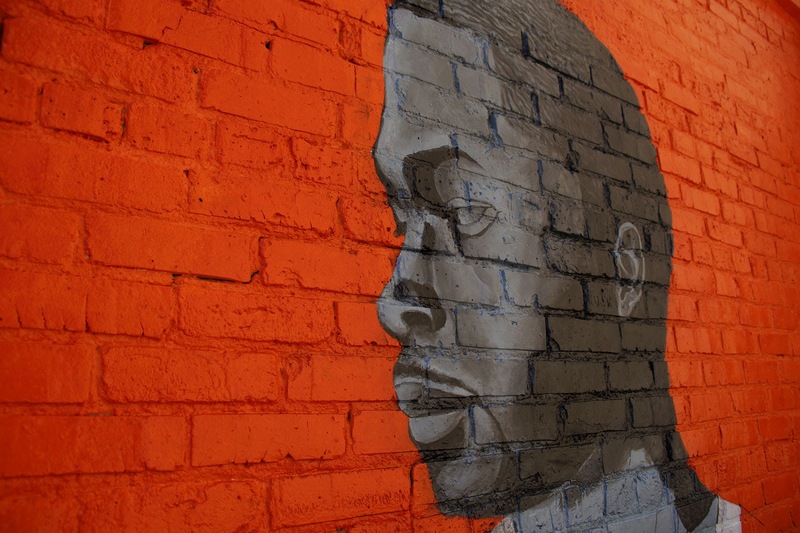 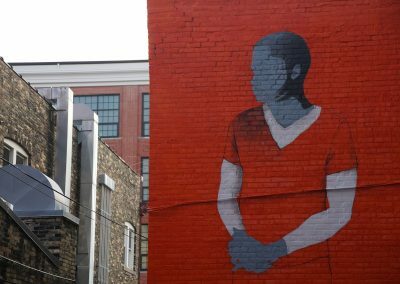 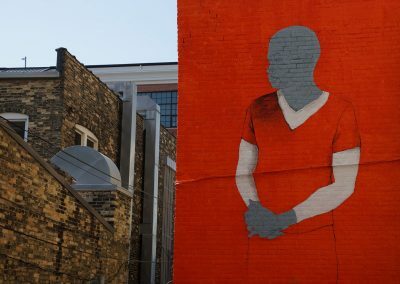 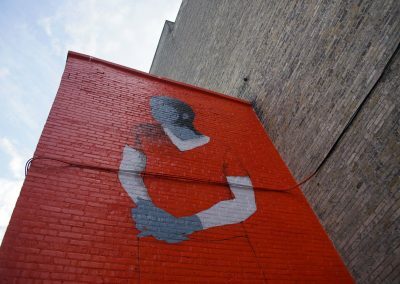 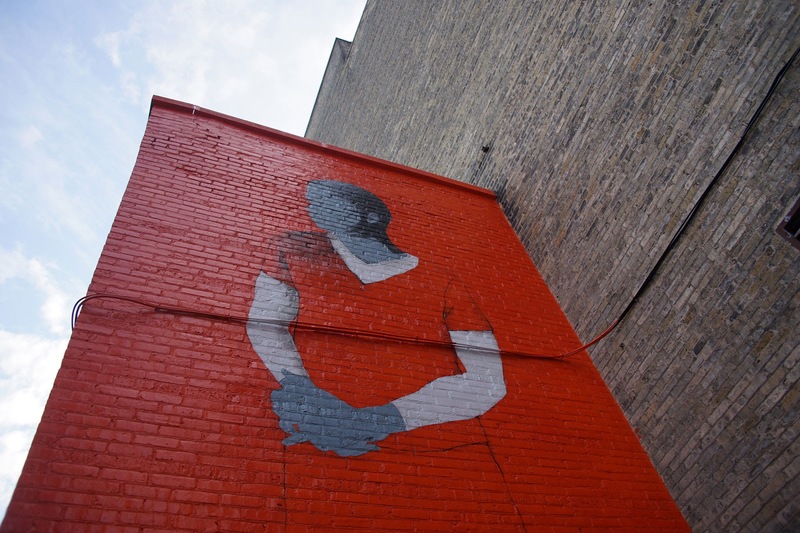 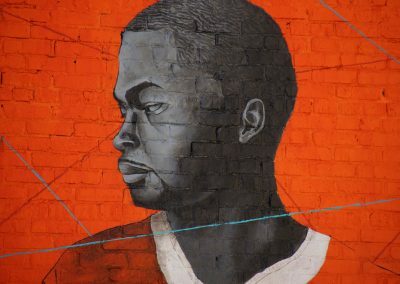 Adam’s proposed mural addresses Milwaukee’s painful legacy of incarcerating a higher percentage of black men than any other city, yet his handling of this sensitive subject is poignant and impactful. 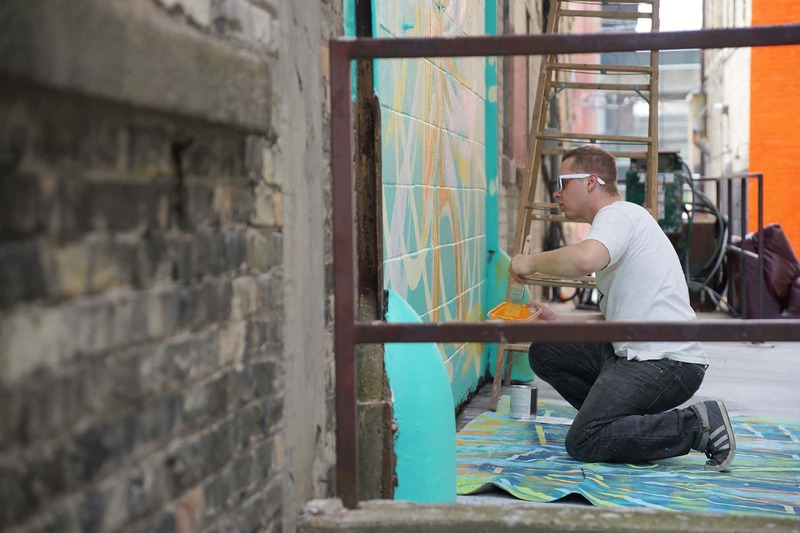 Ian McGibbon, a UWM senior studying art and design, will be painting a contemporary painting consistent with the expressive style he has cultivated in his student portfolio. 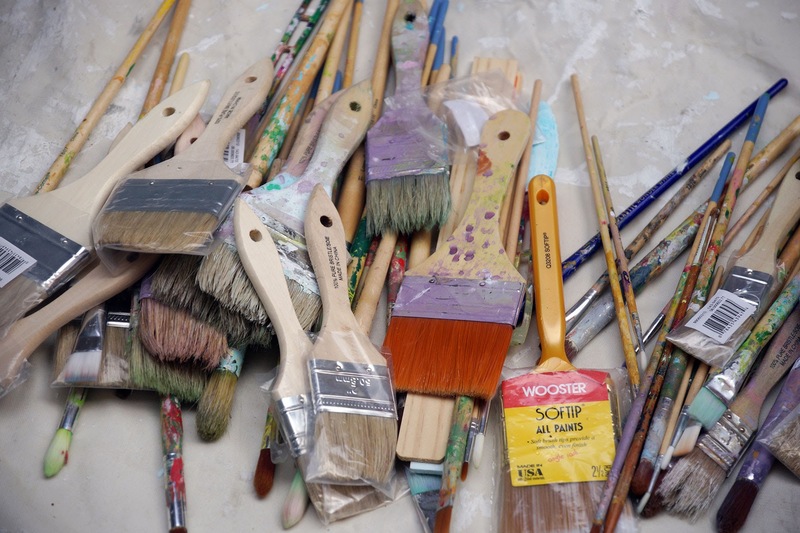 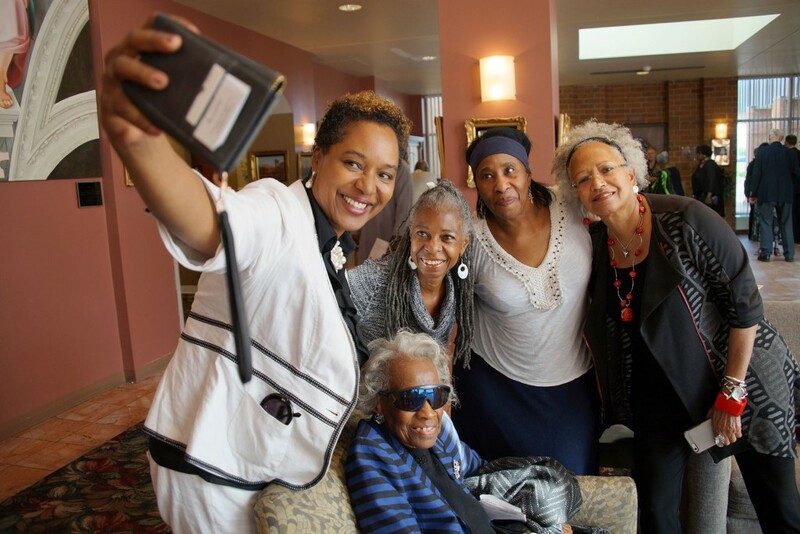 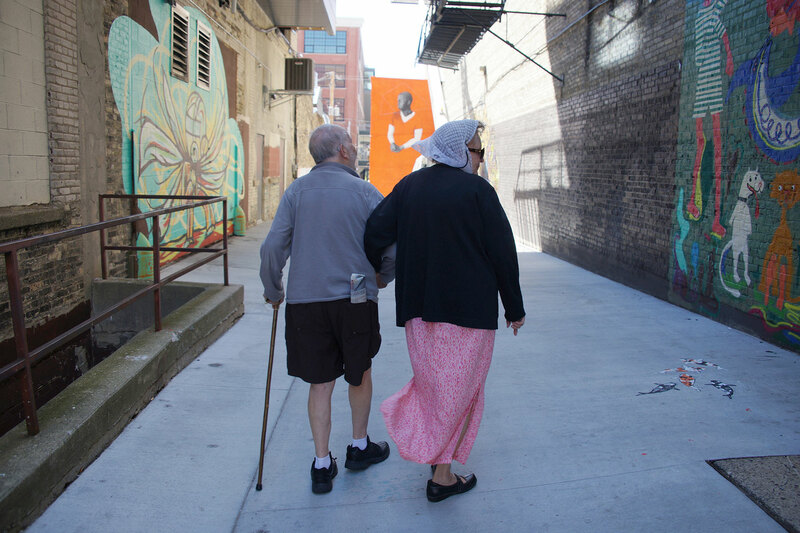 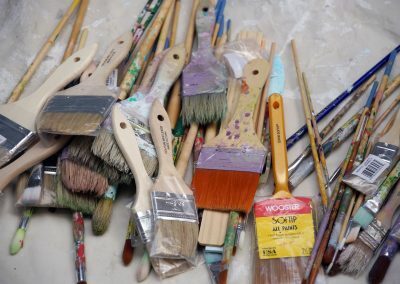 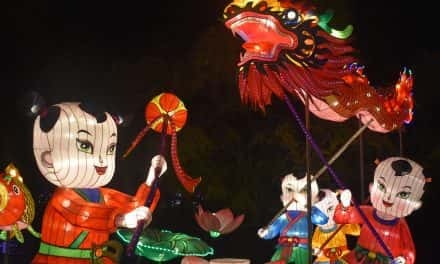 Recently, Ian worked with seniors at the Eastcastle Place in their Student Artists in Residence program, an unusual partnership that brought students from UWM together with older adults to create art. 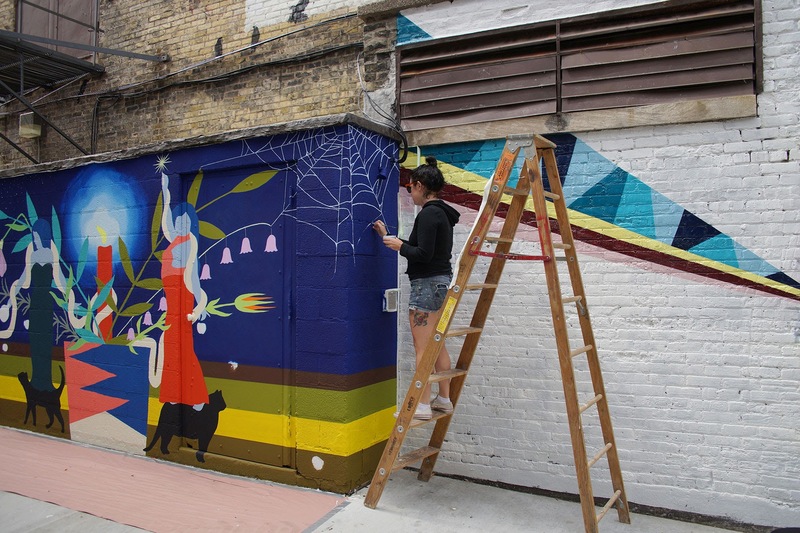 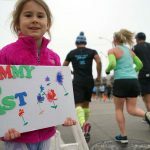 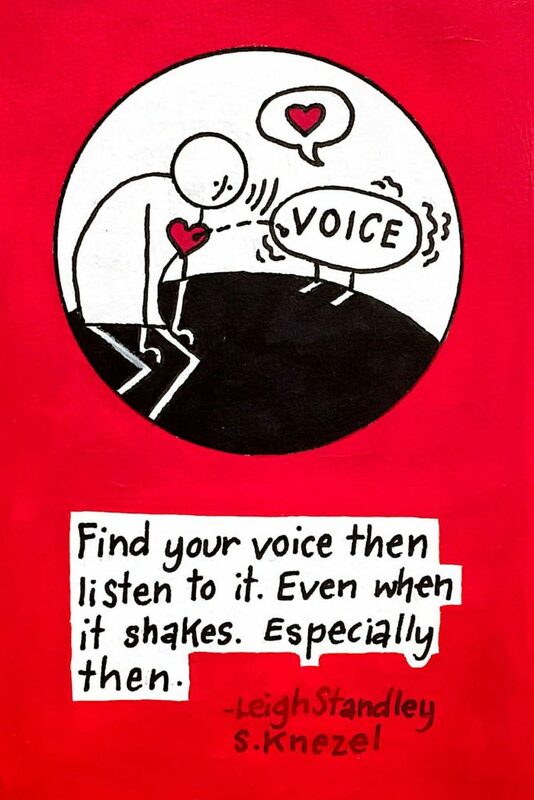 Jenny Jo is an artist, maker and illustrator from Milwaukee. 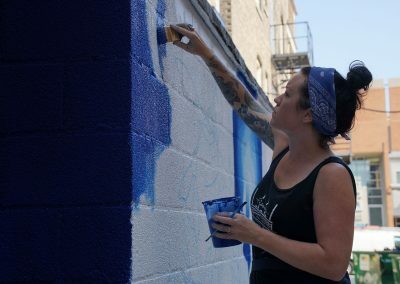 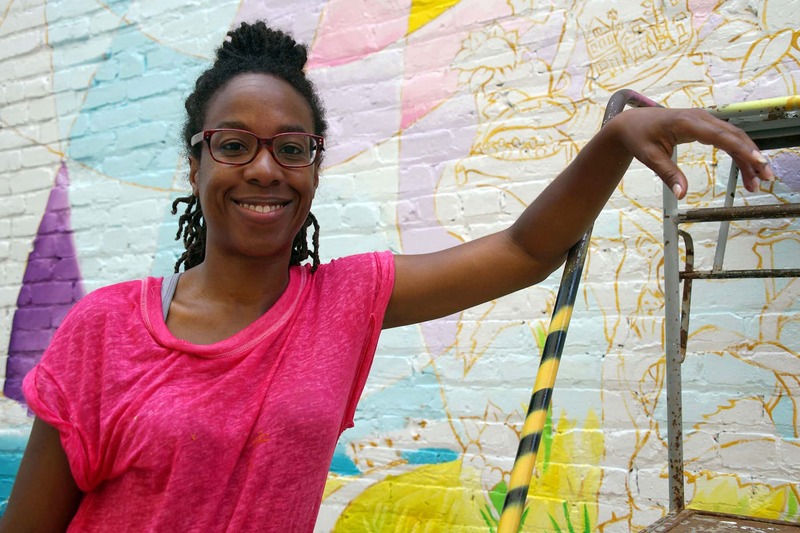 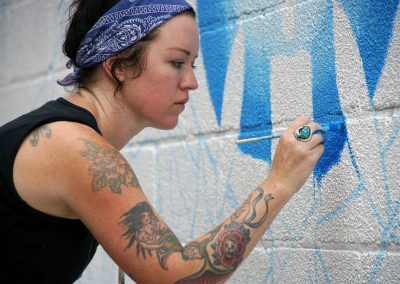 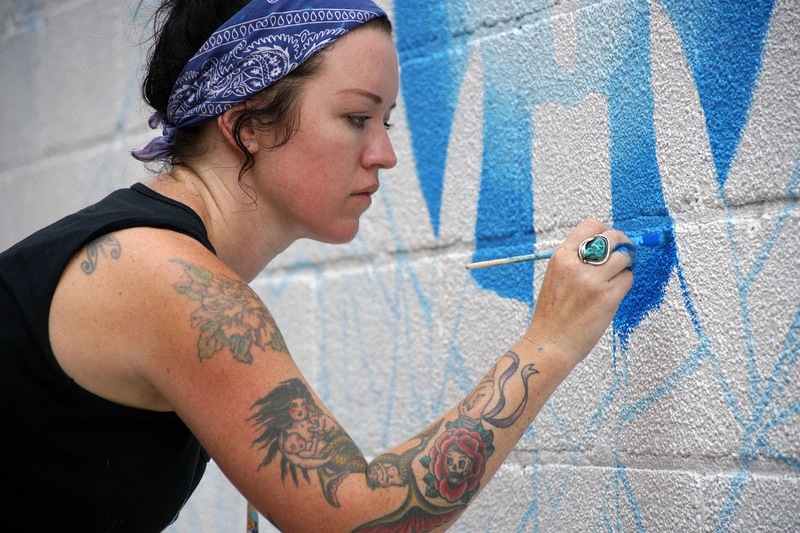 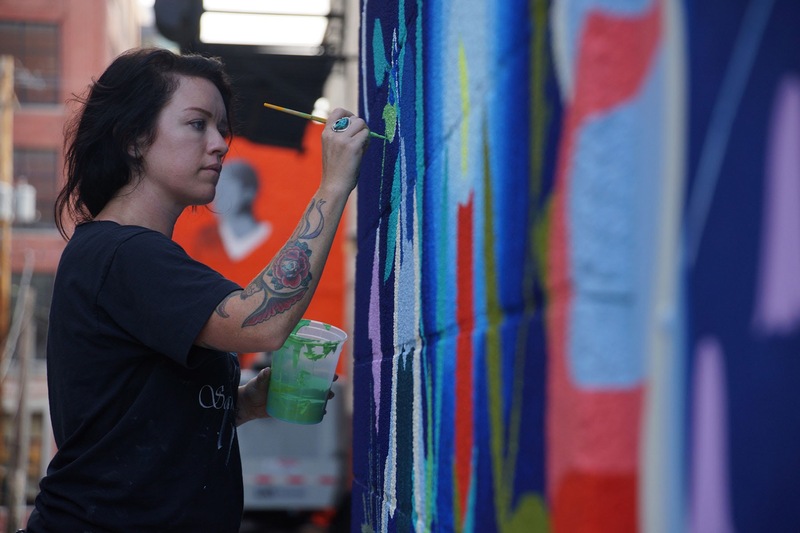 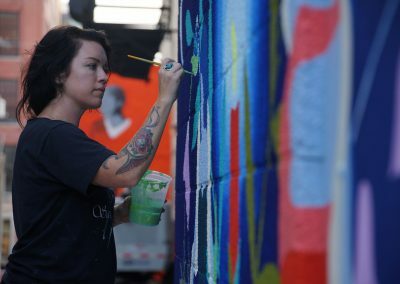 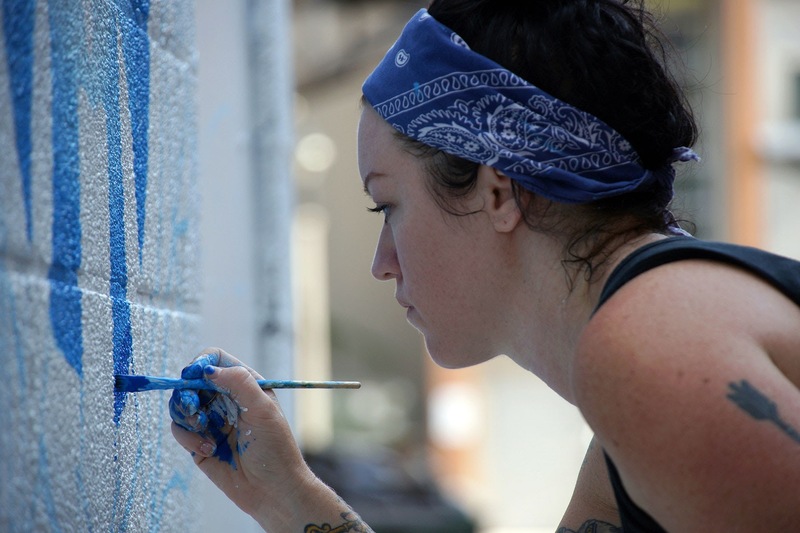 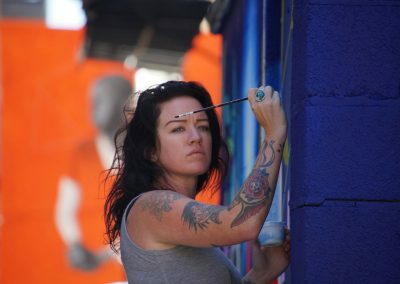 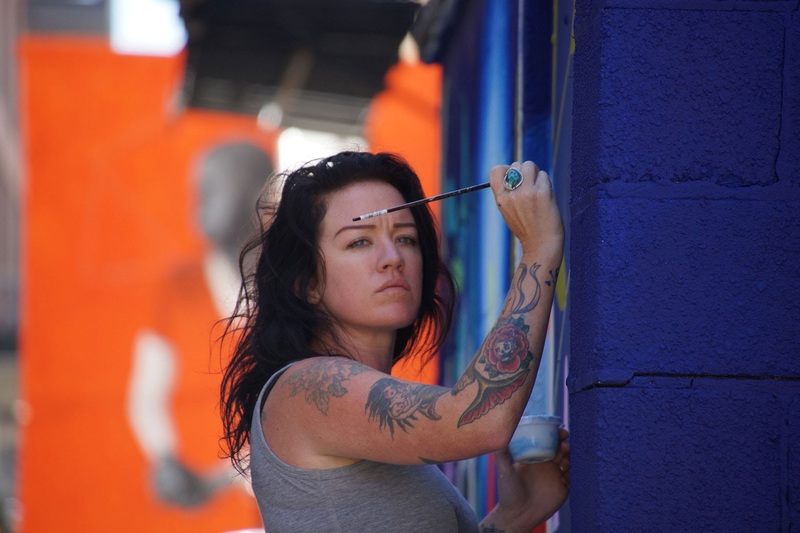 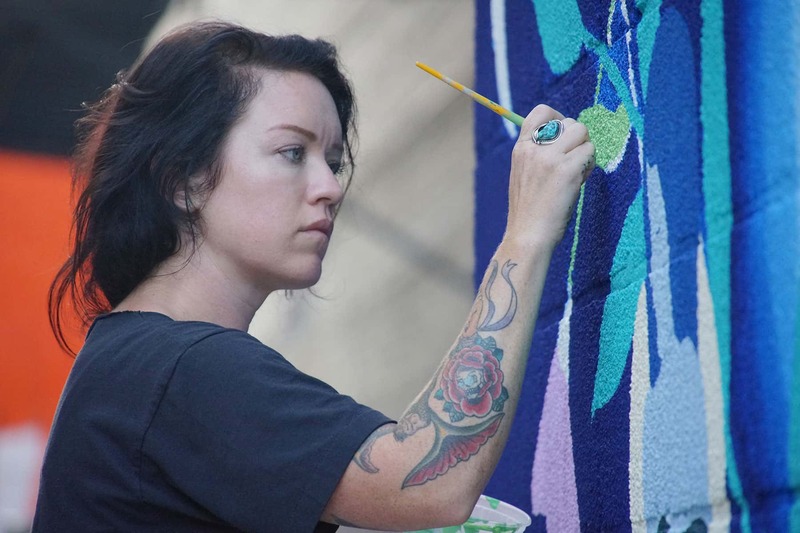 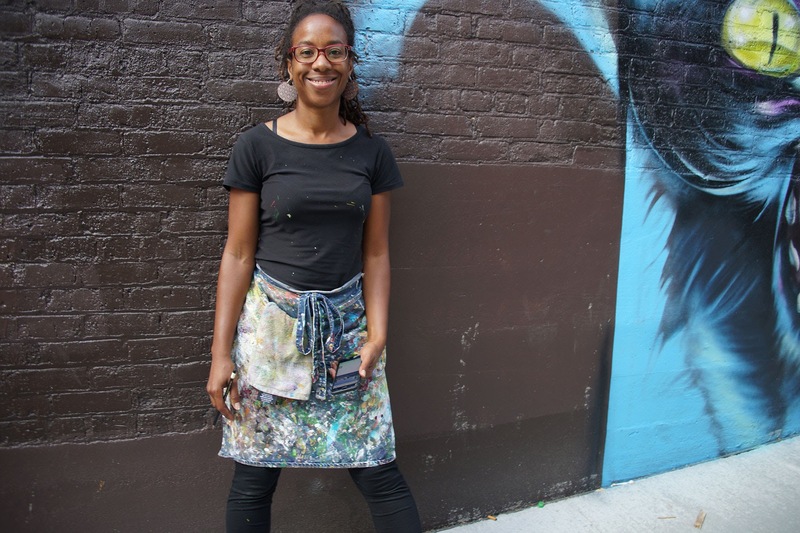 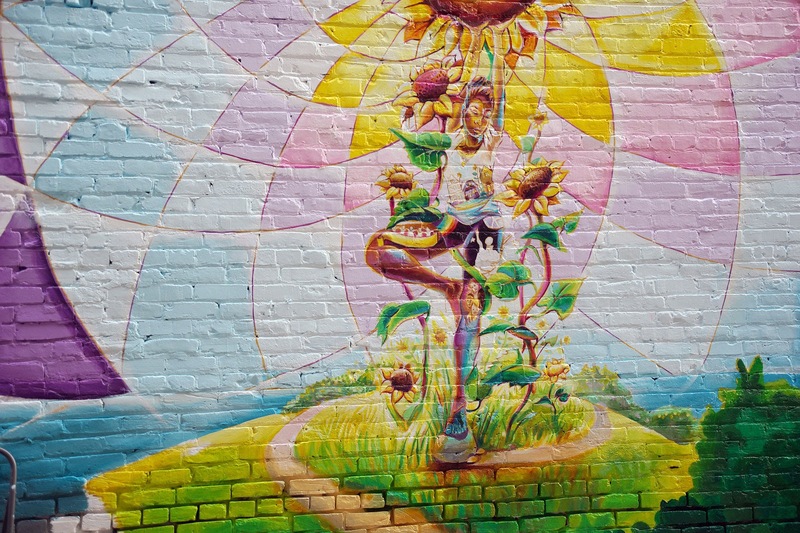 She recently completed a large mural installation at the Sky High Skate Shop and Gallery in Bay View. 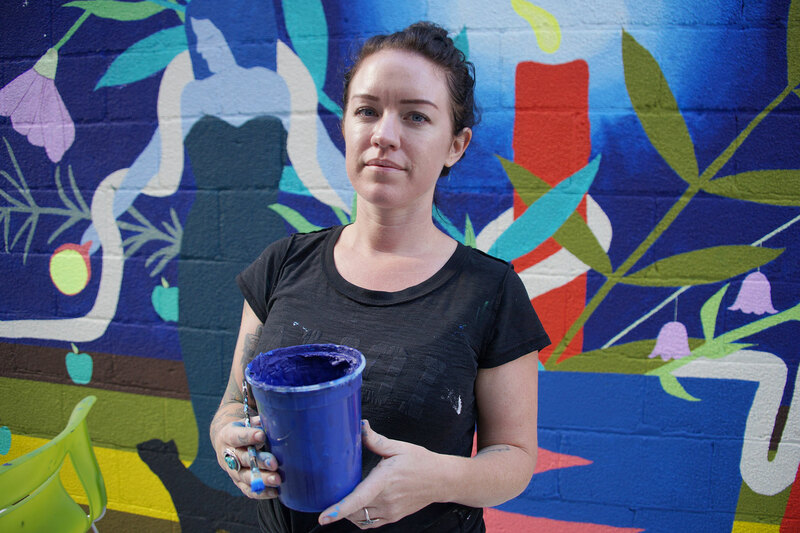 Her artworks are available on Etsy, as well as in shops like HotPop, Sparrow Collective and the Waxwing. 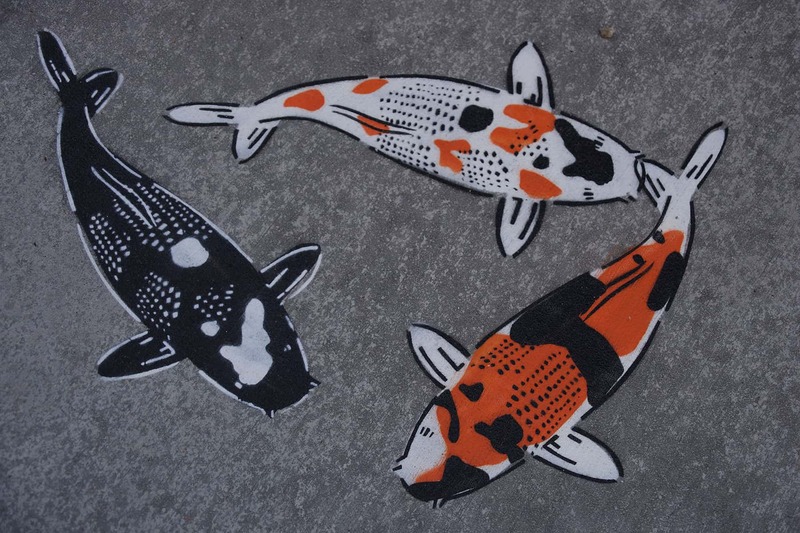 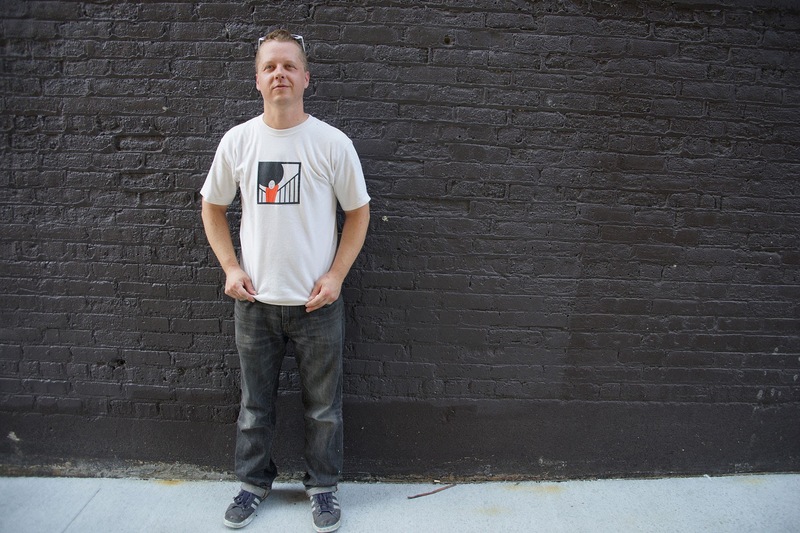 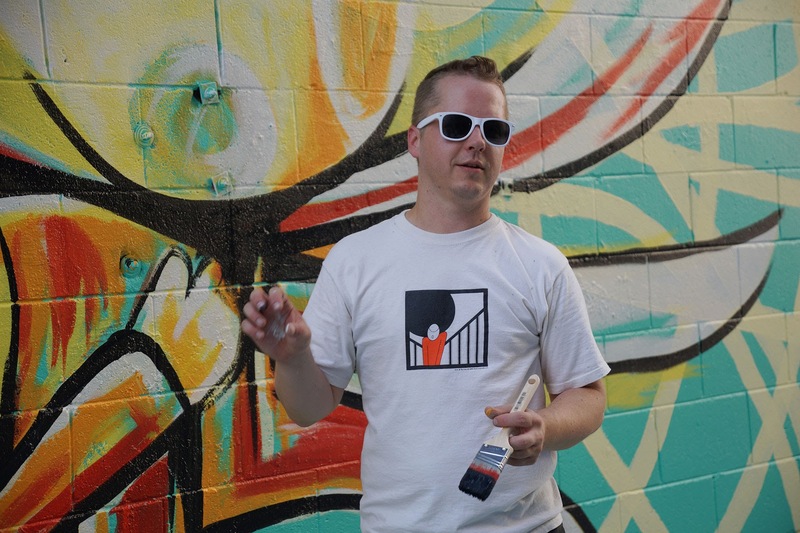 For the past eighteen years, Jeremy Novy has utilized stenciled street art to explore social and political issues. 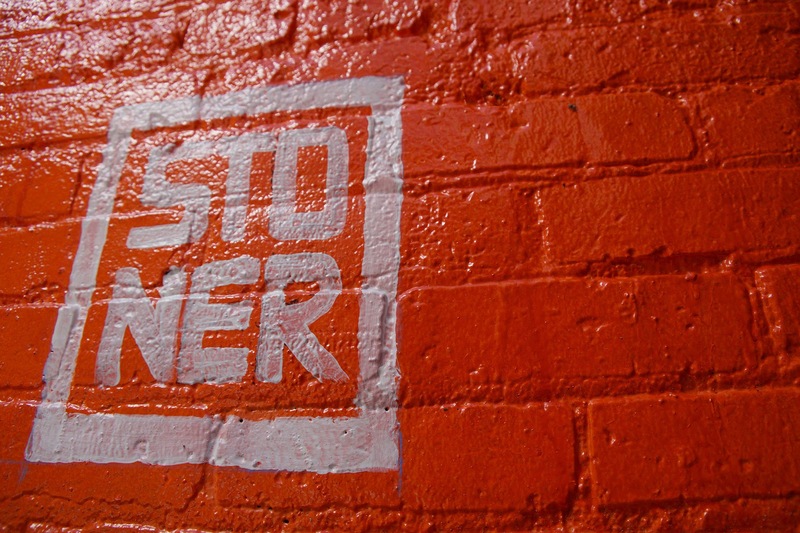 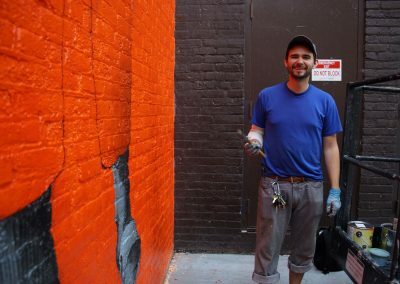 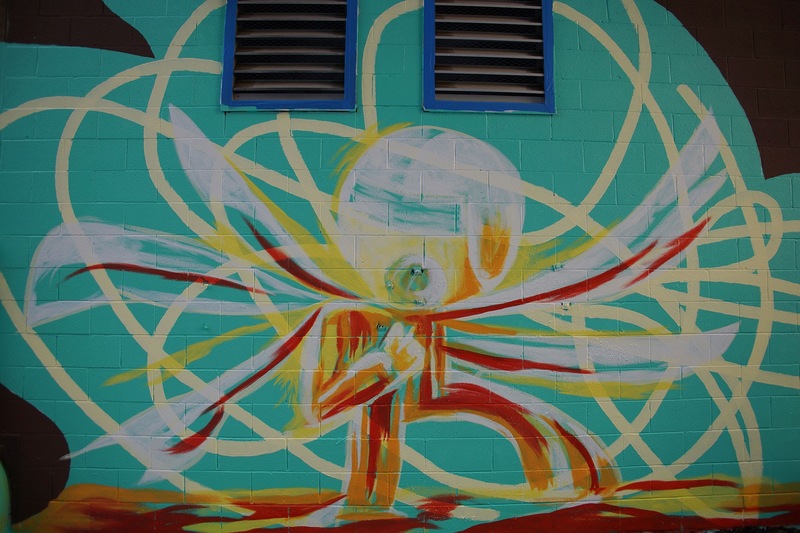 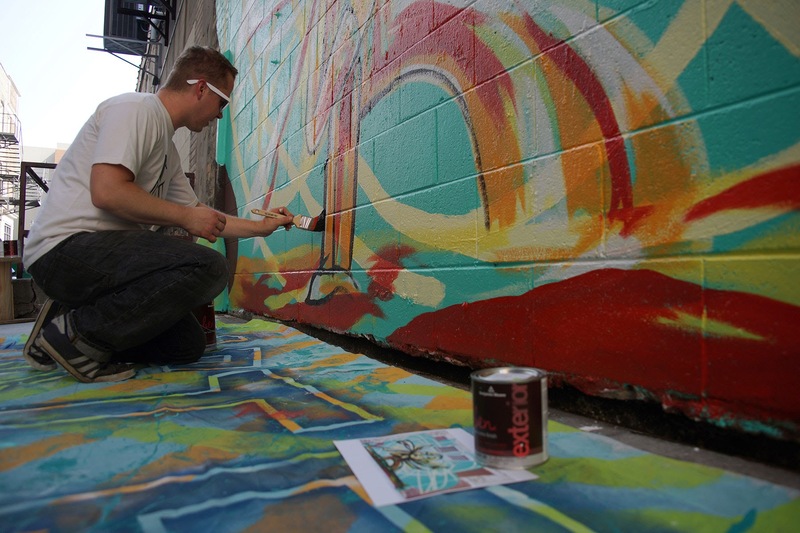 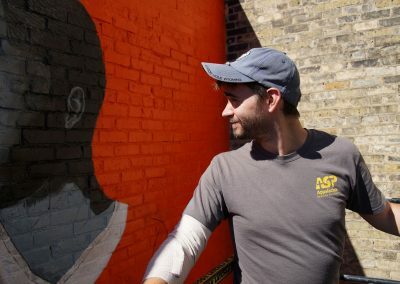 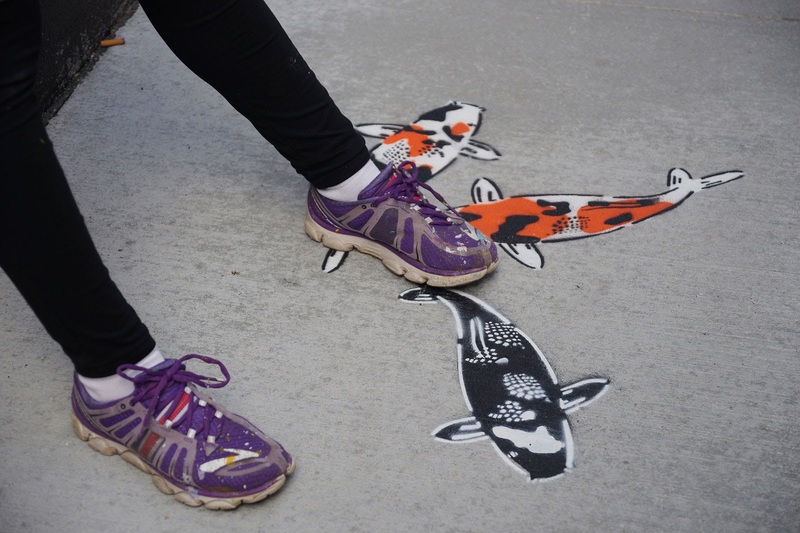 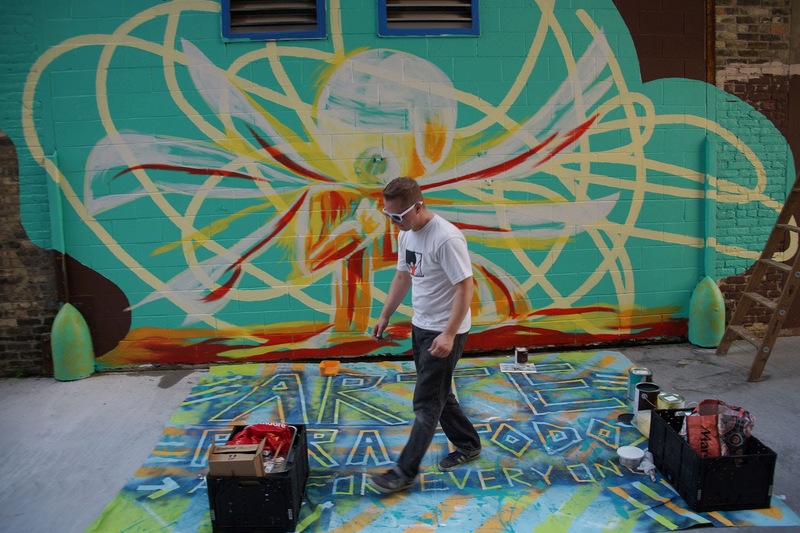 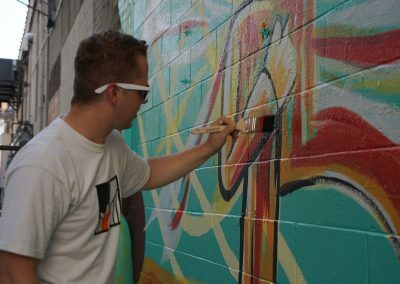 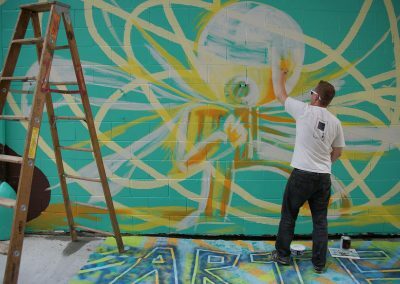 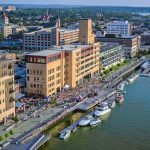 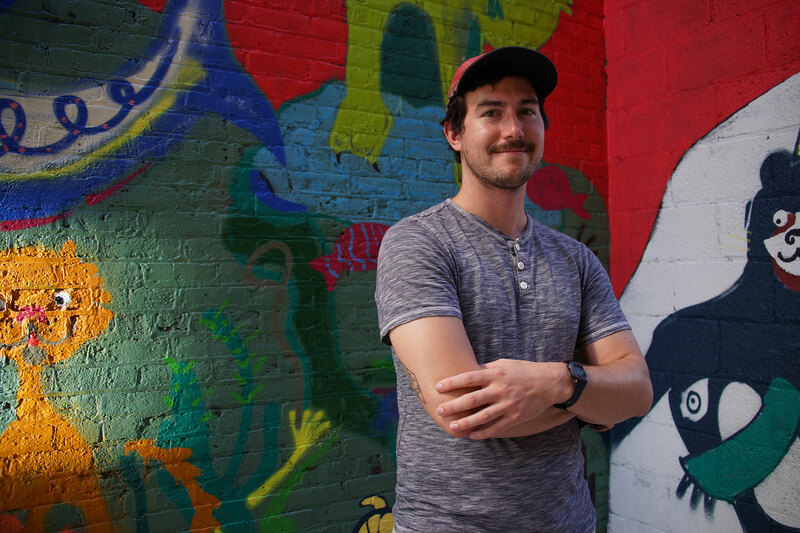 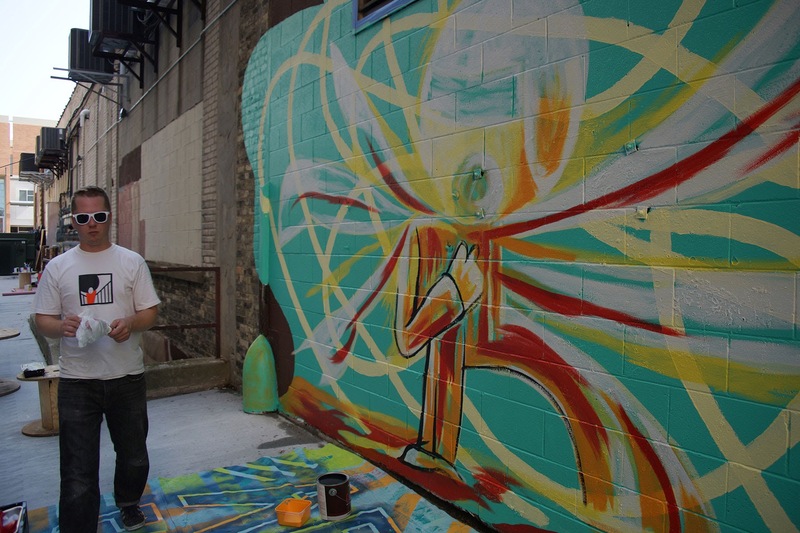 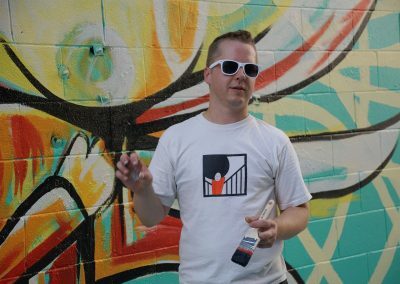 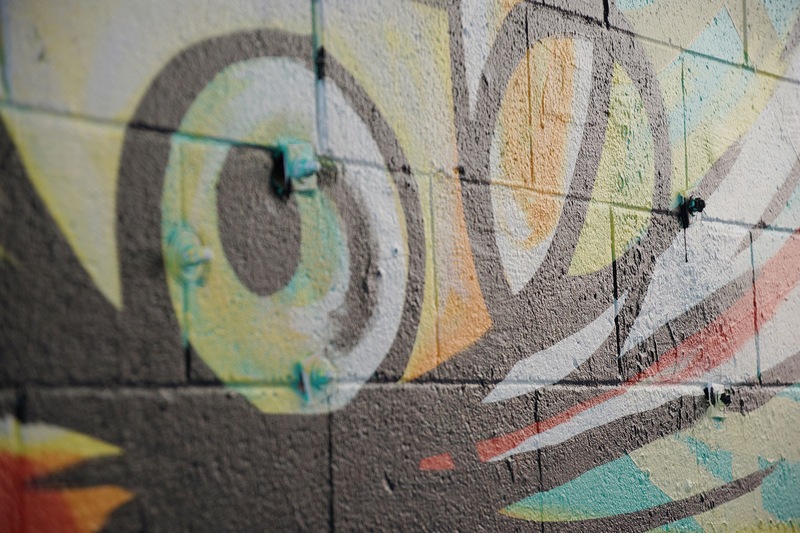 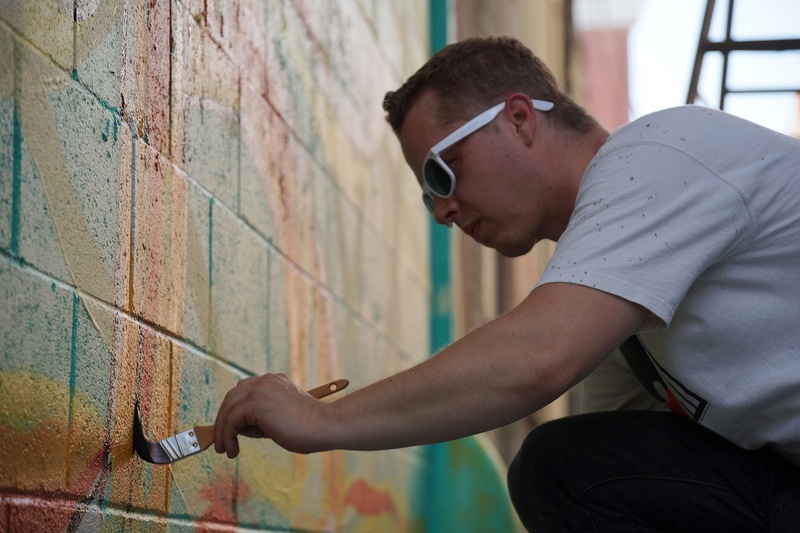 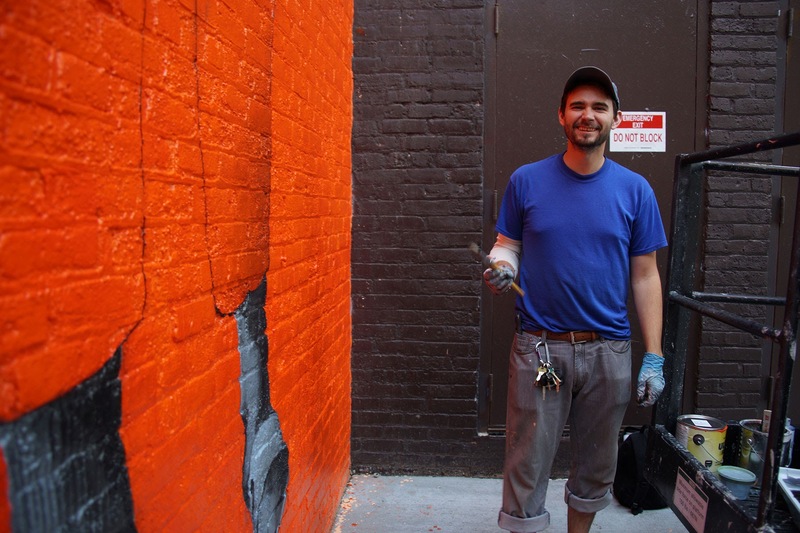 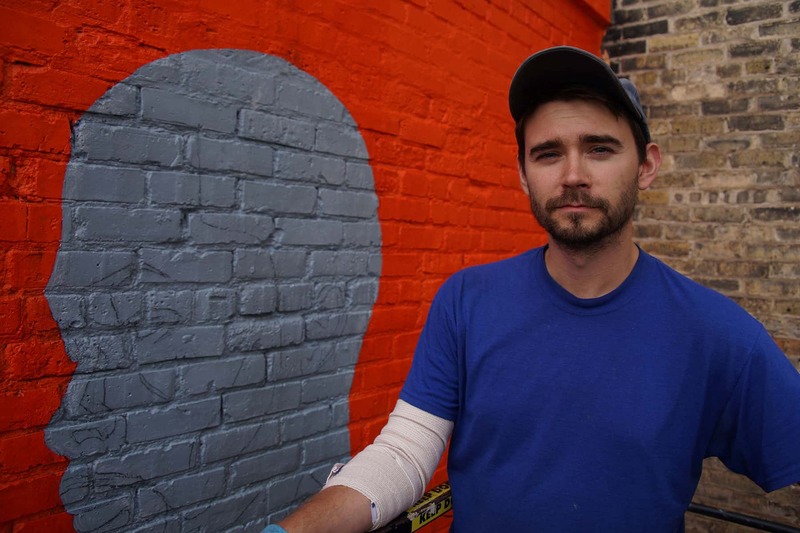 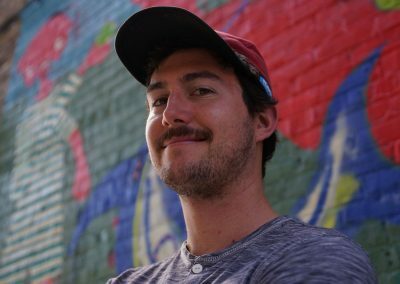 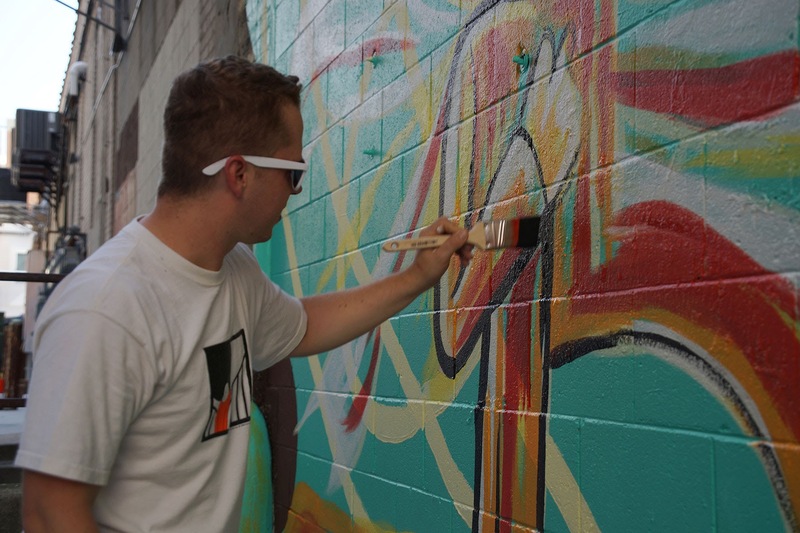 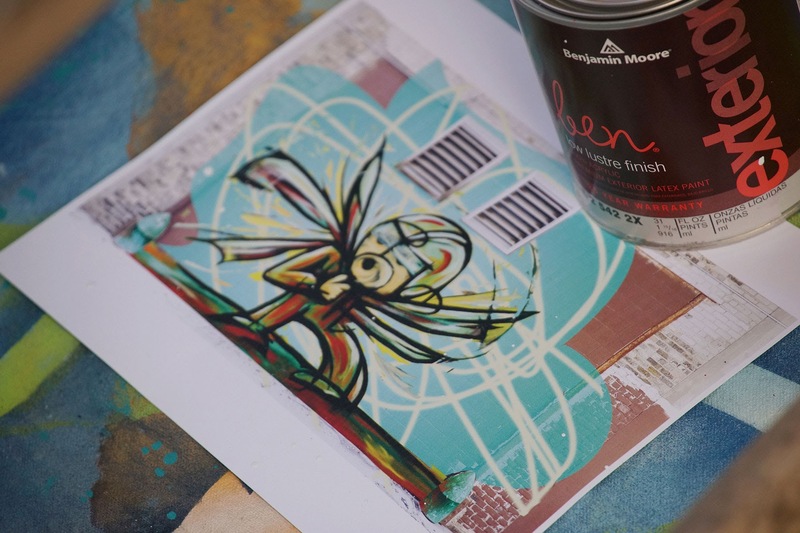 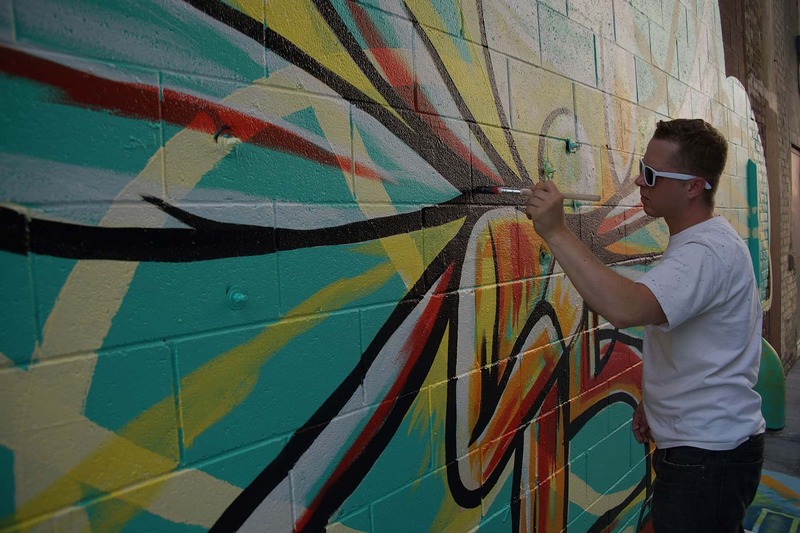 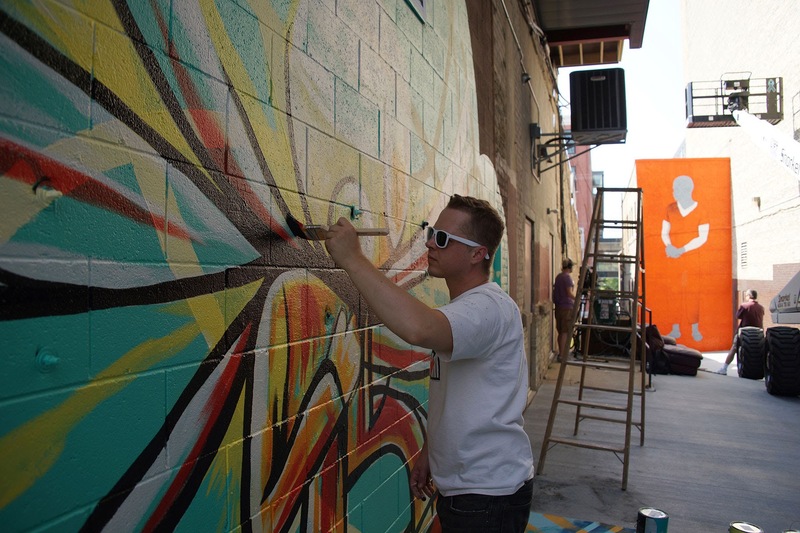 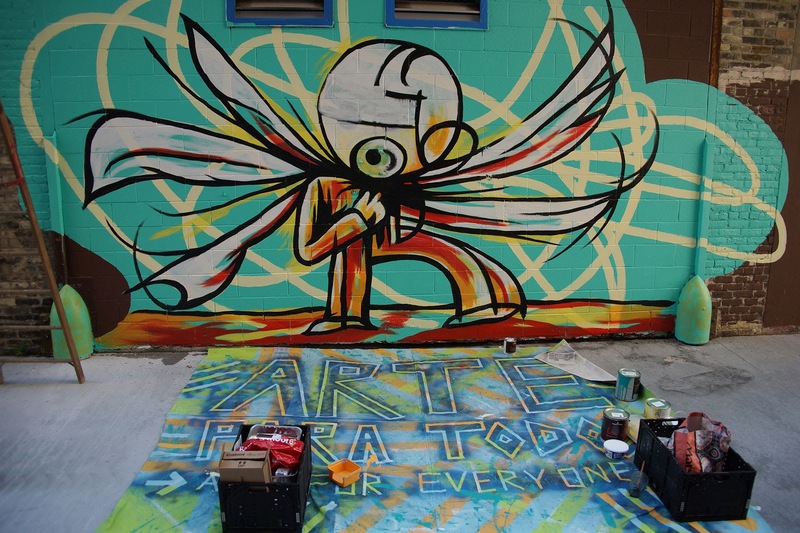 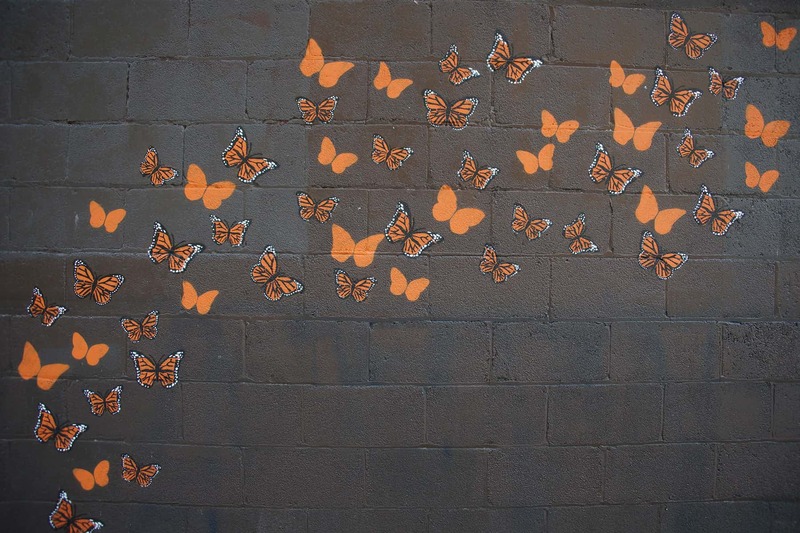 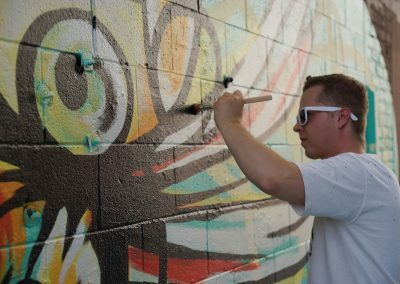 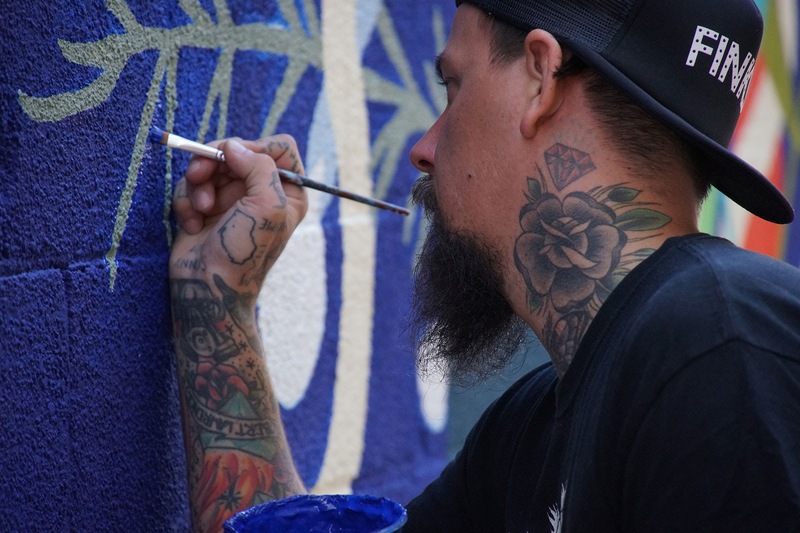 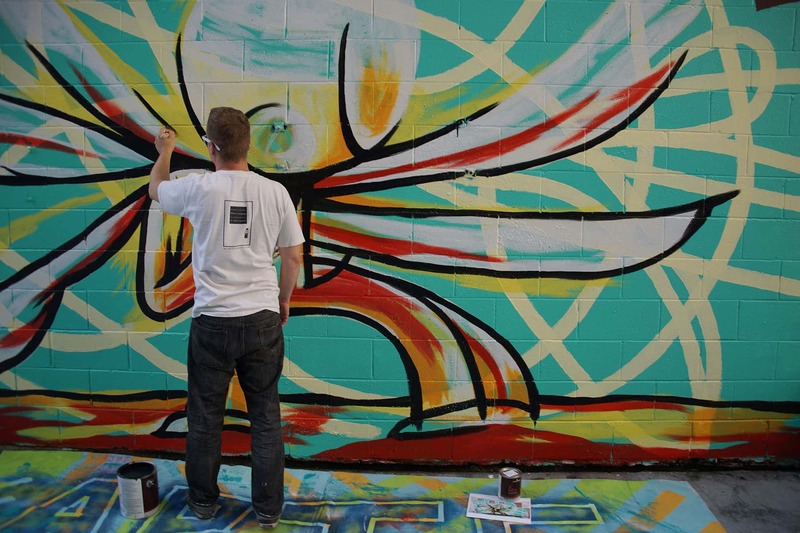 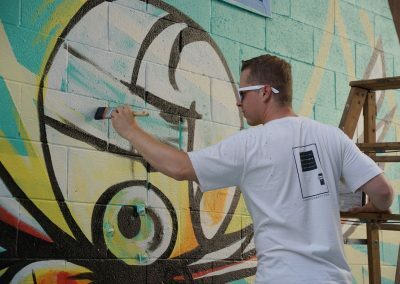 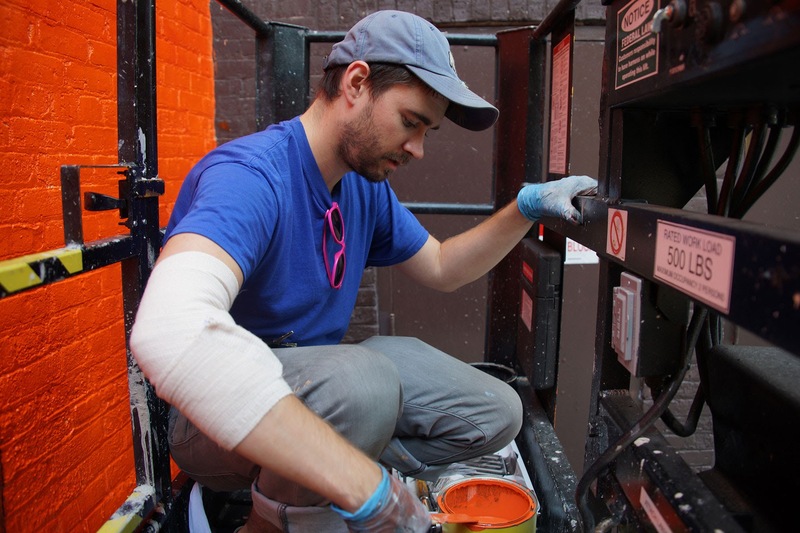 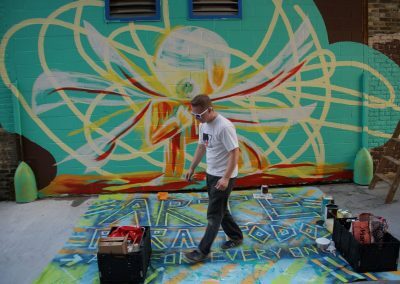 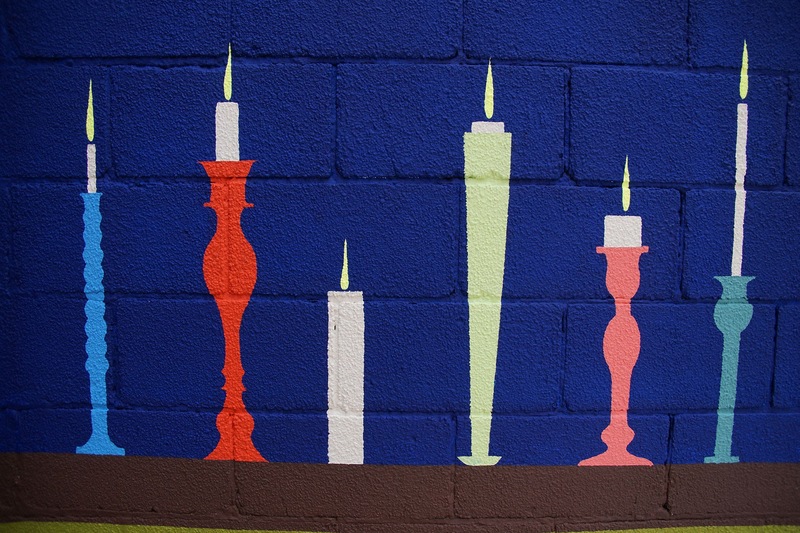 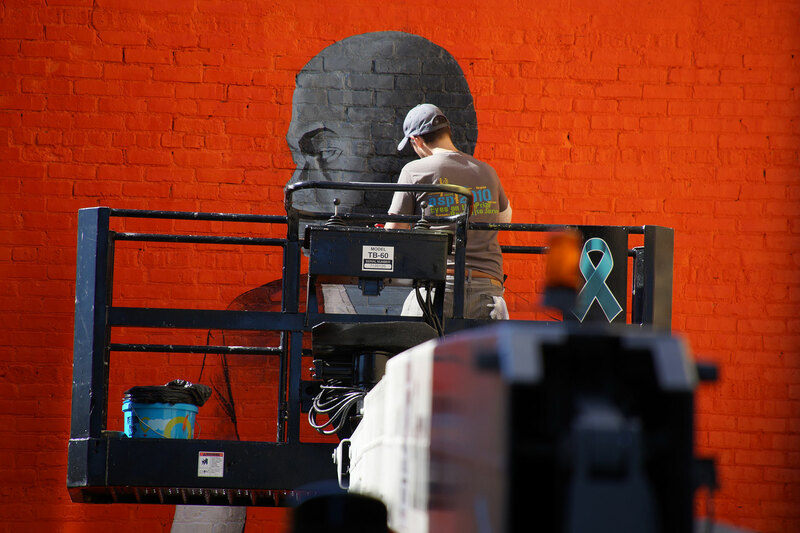 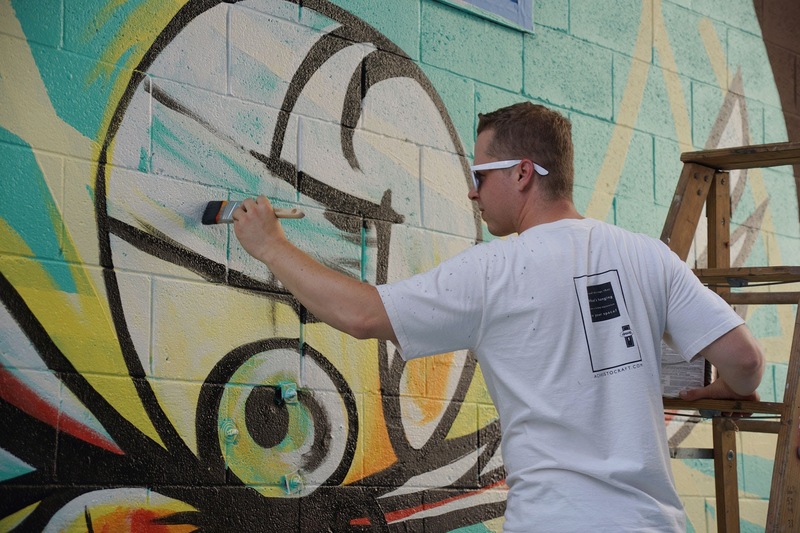 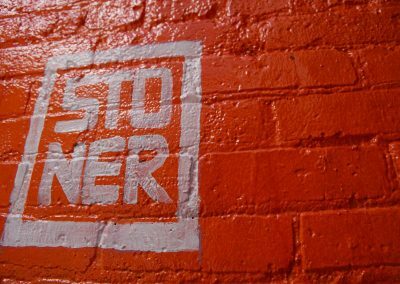 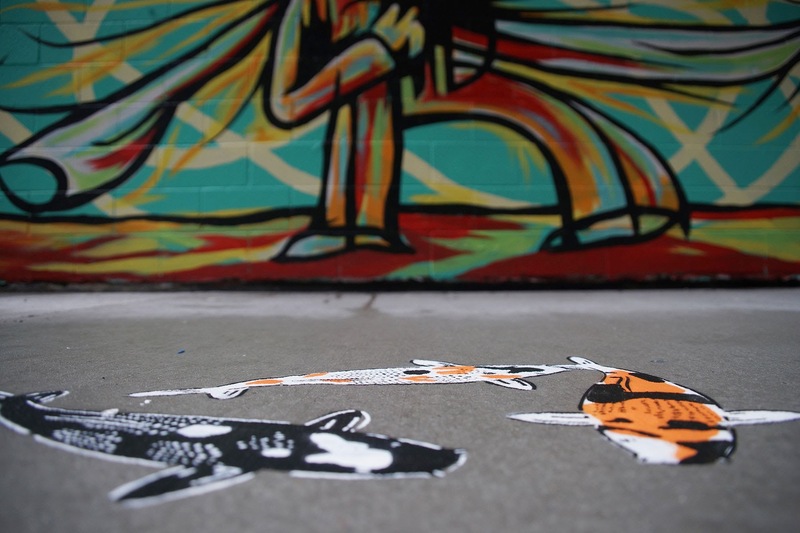 Novy has two intentions for his stencils: first, he creates public works that make his city a better place to live by bringing a bit of the arts to everyone, regardless of income or background. 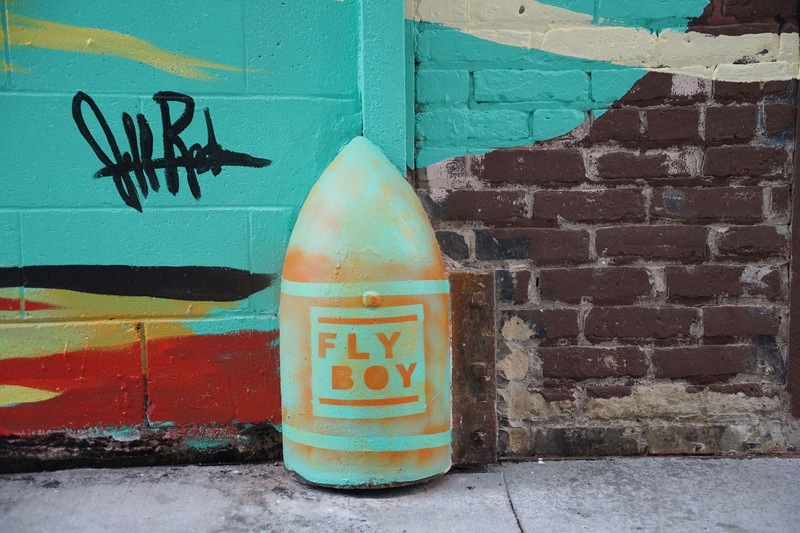 Seeing problems such as abandoned telephone booths and boarded up buildings, he creates artful solutions by overlaying stenciled posters onto the disused objects giving them new life. 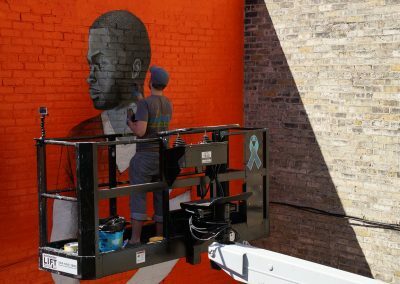 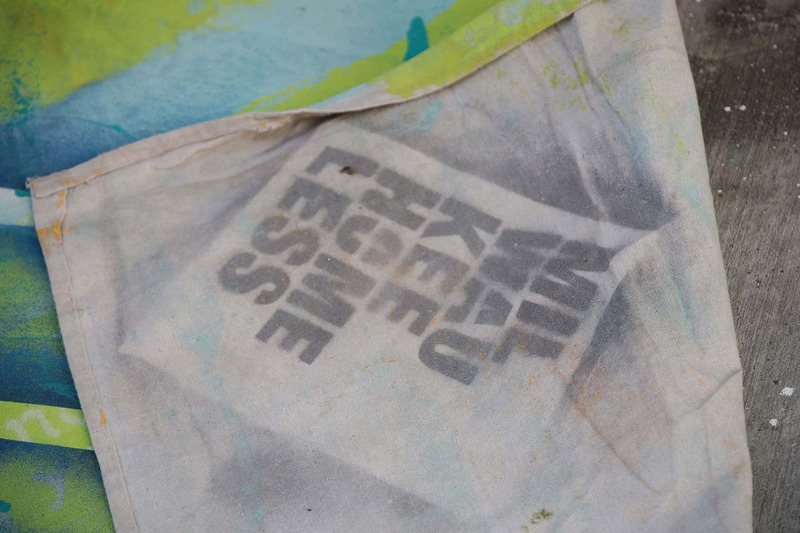 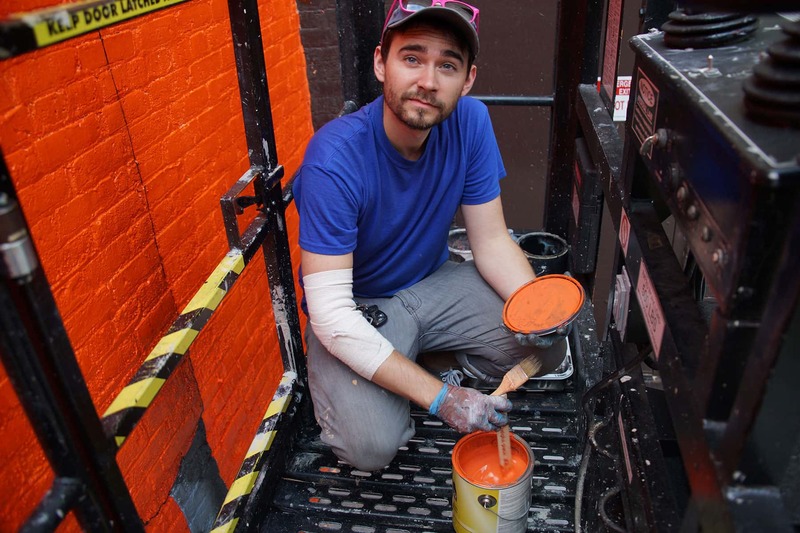 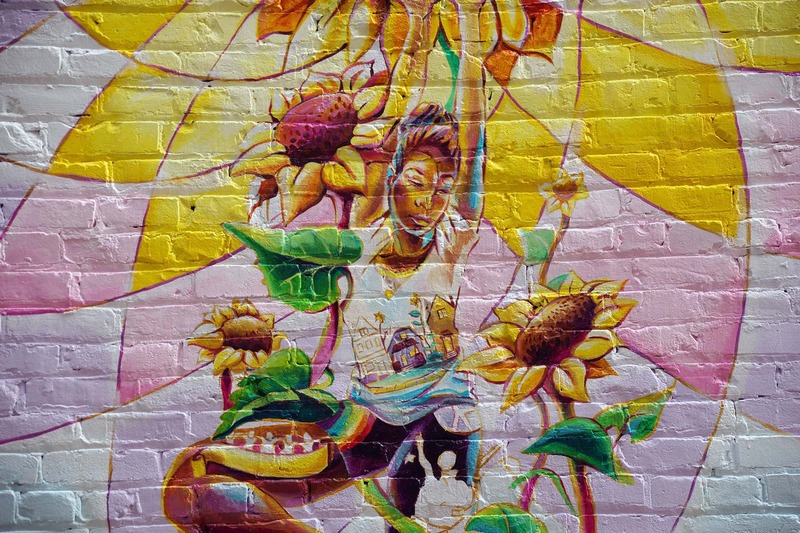 His second intention is to bring gay imagery into the homophobic subculture of street artists by covering hateful and distasteful graffiti in our communities. 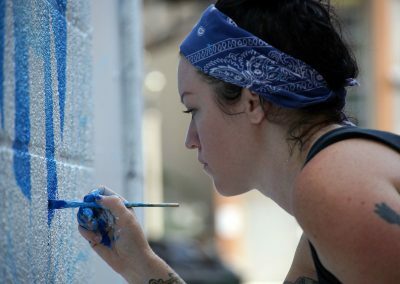 Novy wants the gay street artist community to flourish and not be bullied or afraid to express themselves with their artwork. 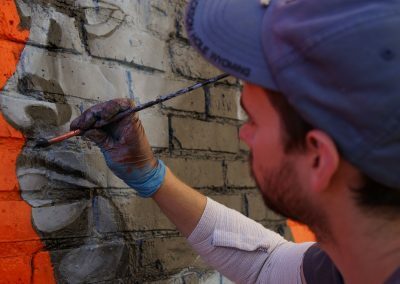 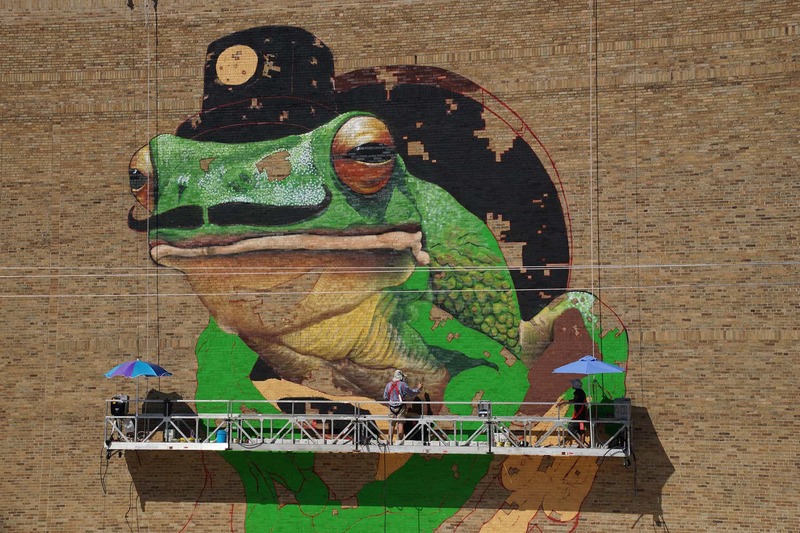 MTO is a contemporary French artist who has created some of Europe’s most iconic murals. MTO is best known for his hyperrealistic, larger-than-life portraits. 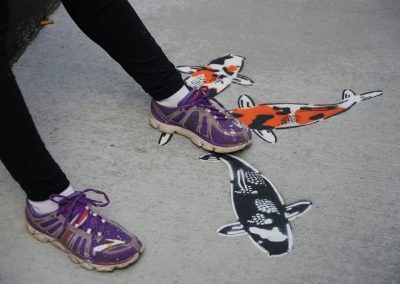 Most are black and white with the odd splash of color incorporated. 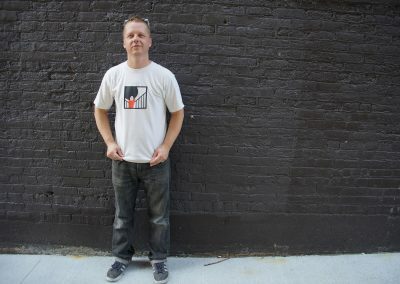 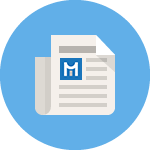 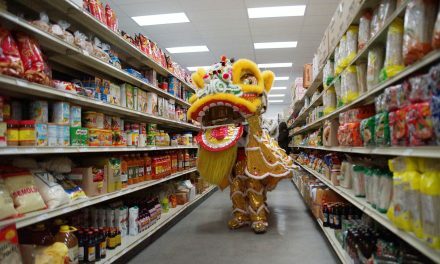 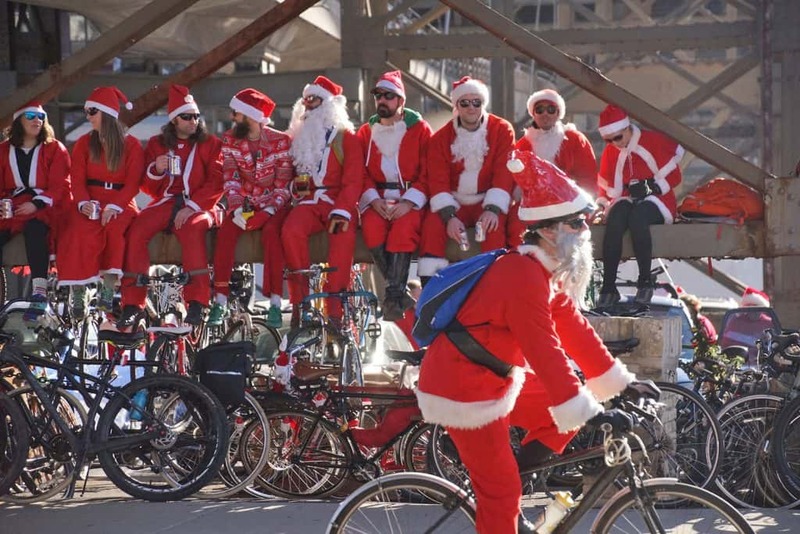 He has been featured in multiple books, newspapers, magazines, videos and blogs. 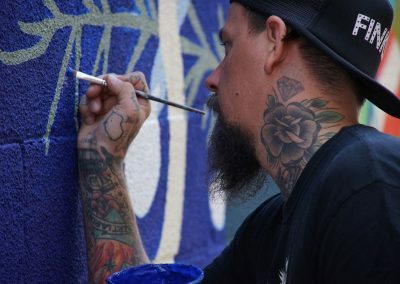 His only other work in the USA has been in New Orleans, LA and Sarasota. 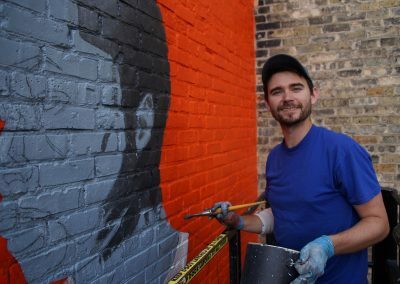 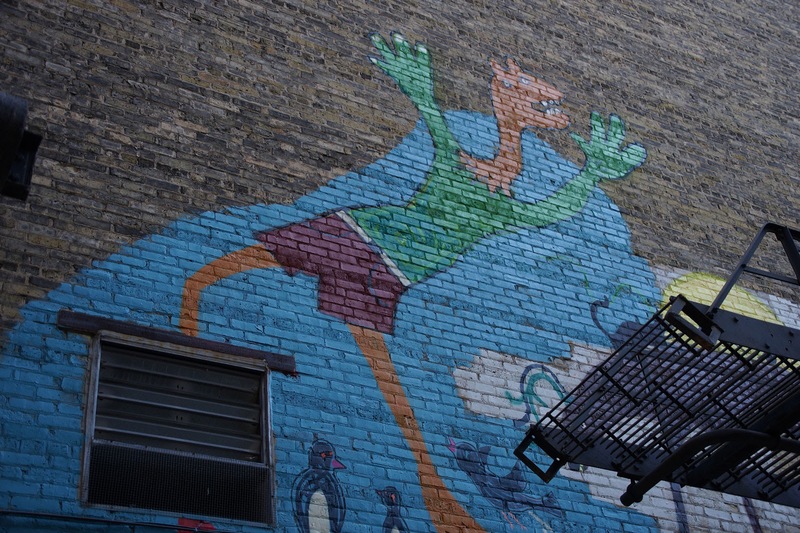 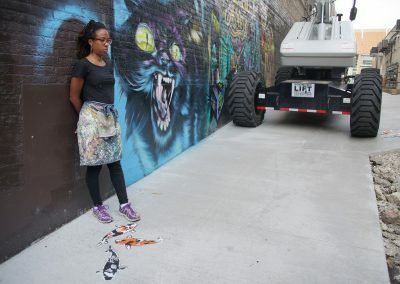 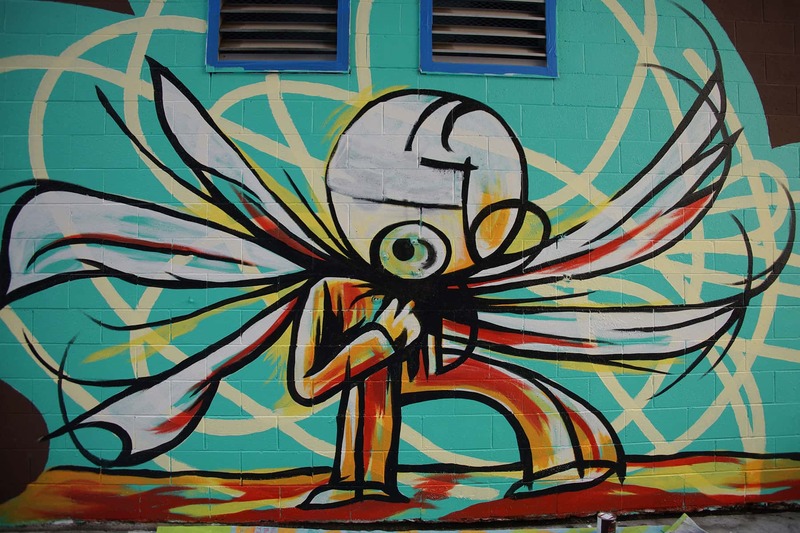 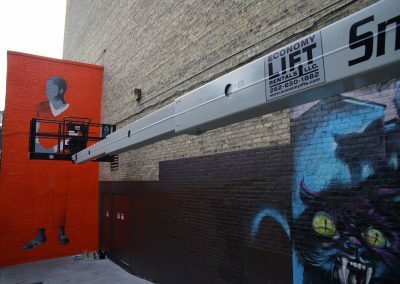 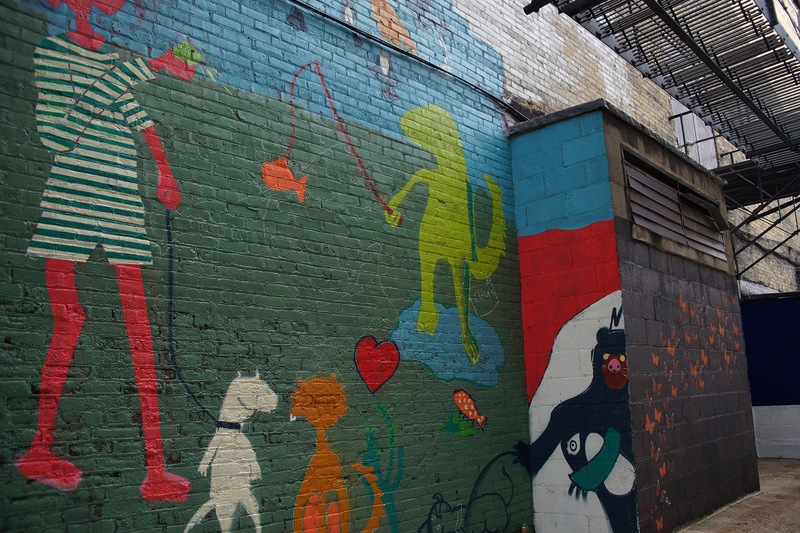 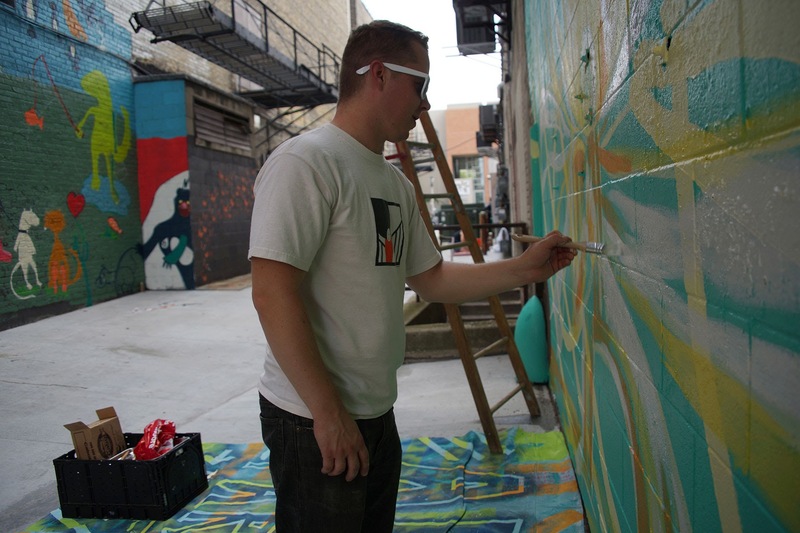 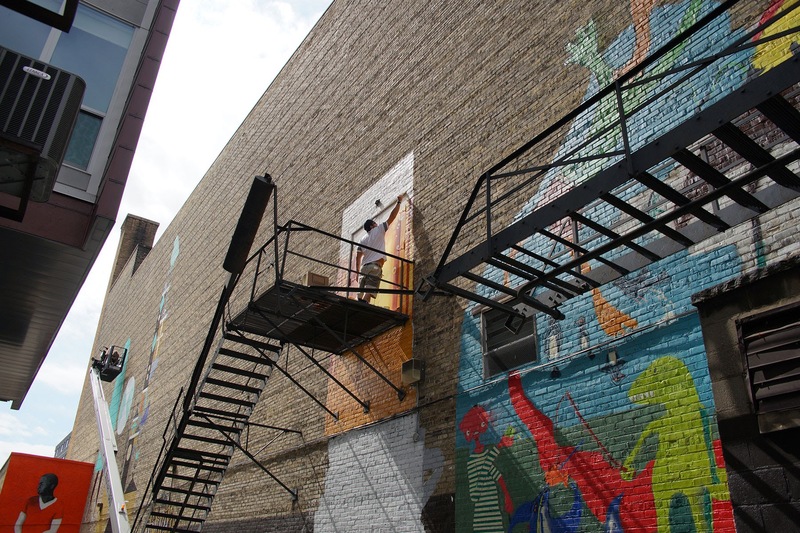 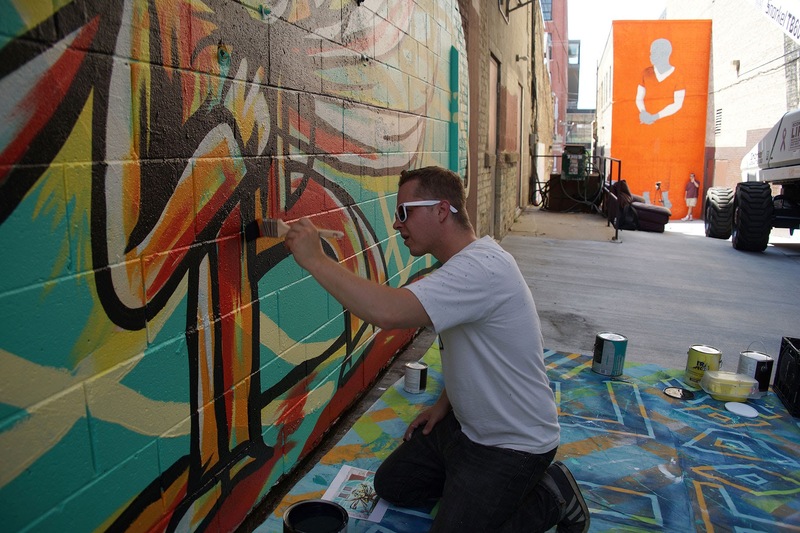 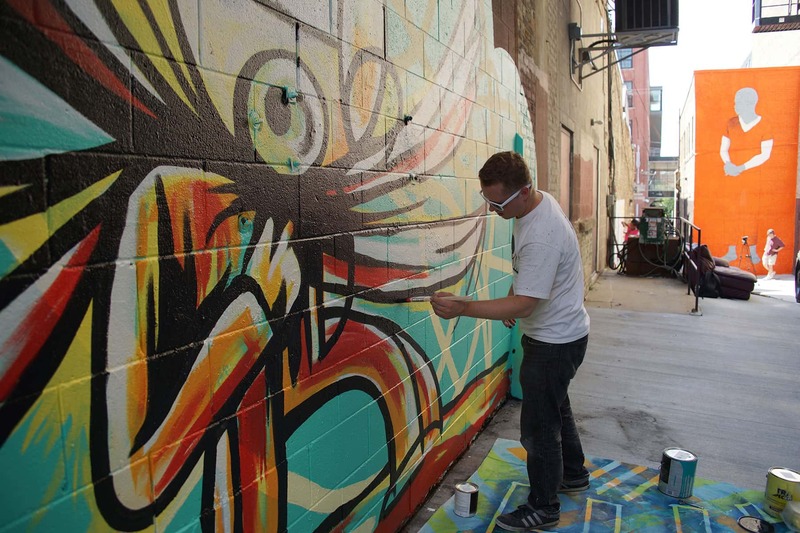 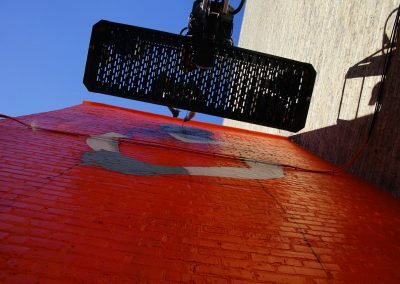 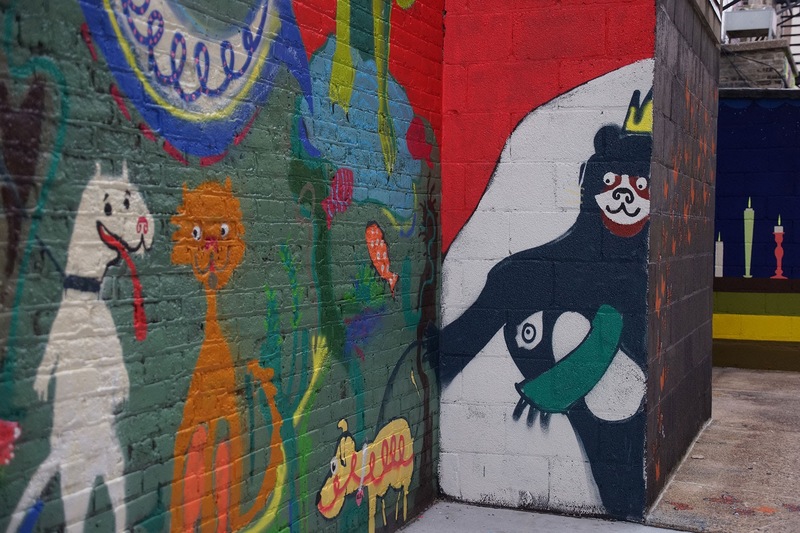 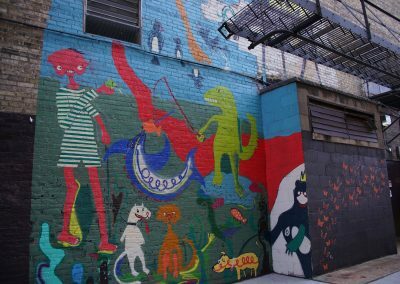 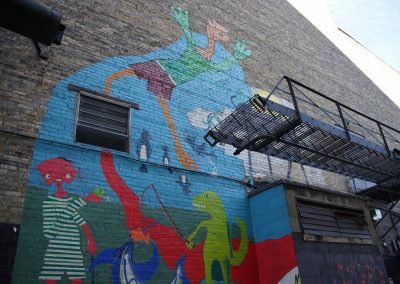 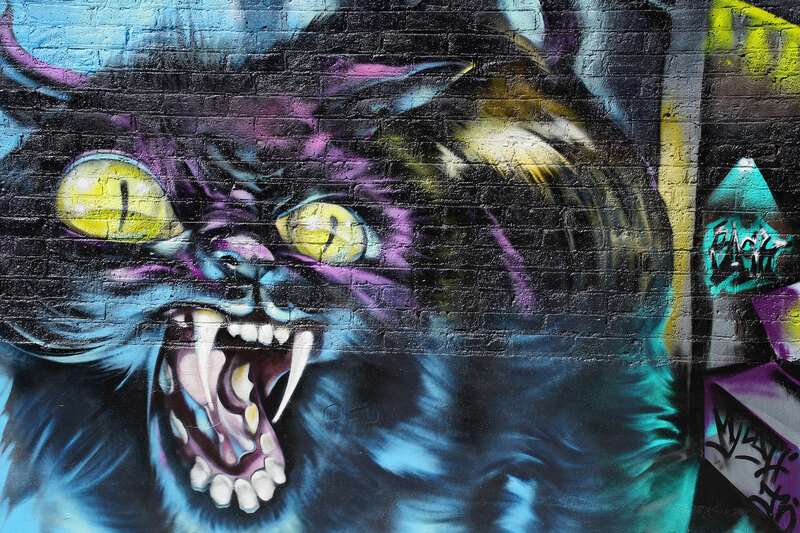 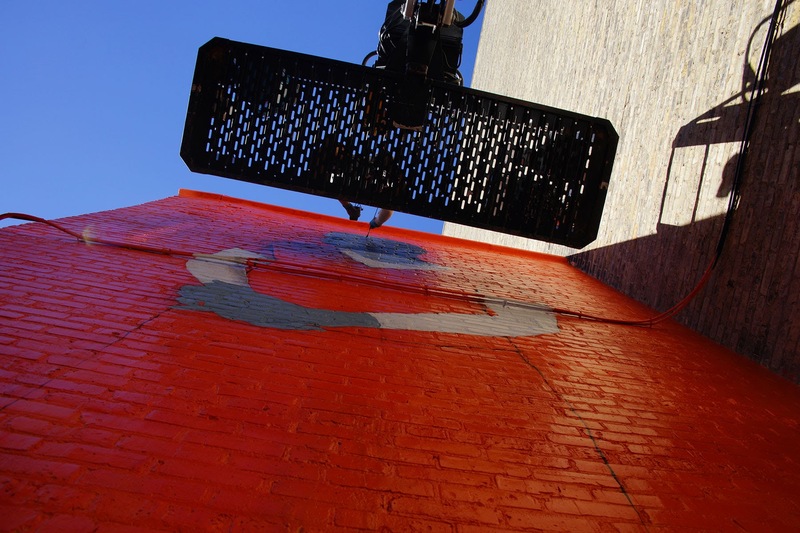 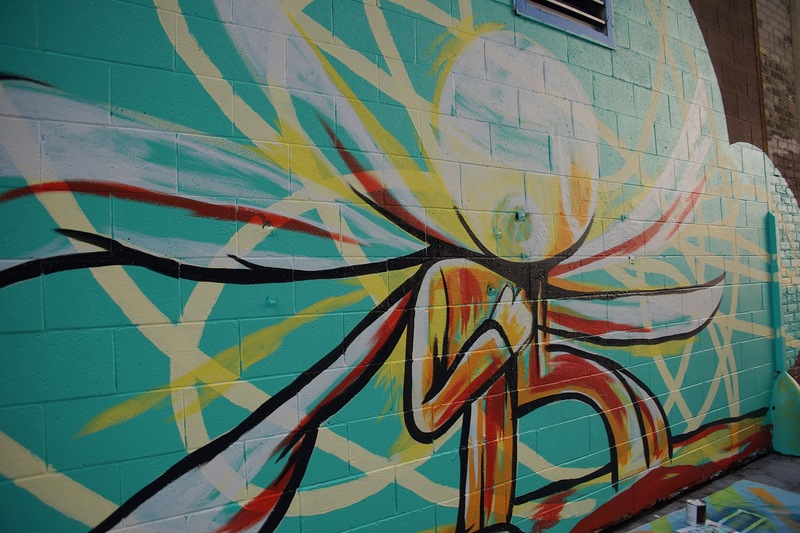 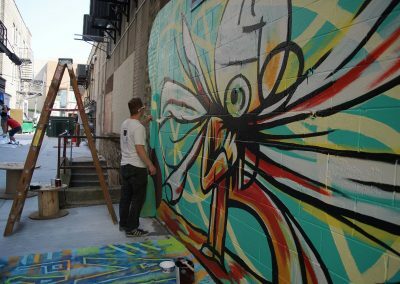 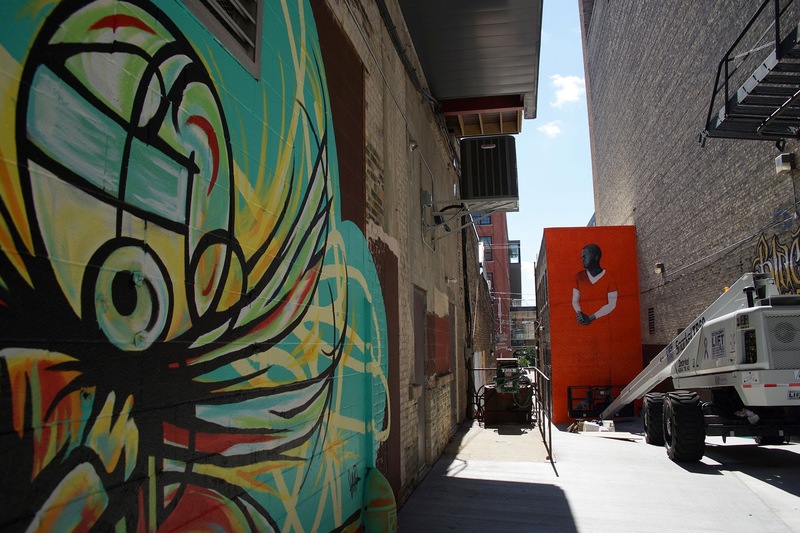 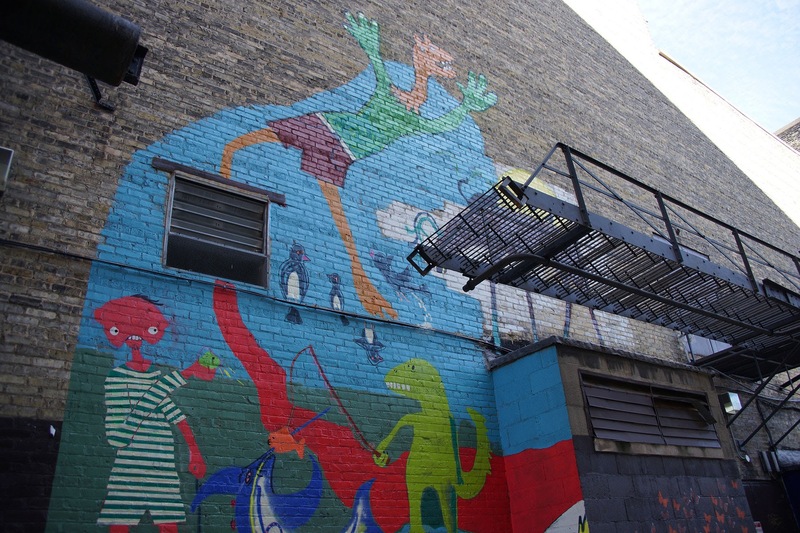 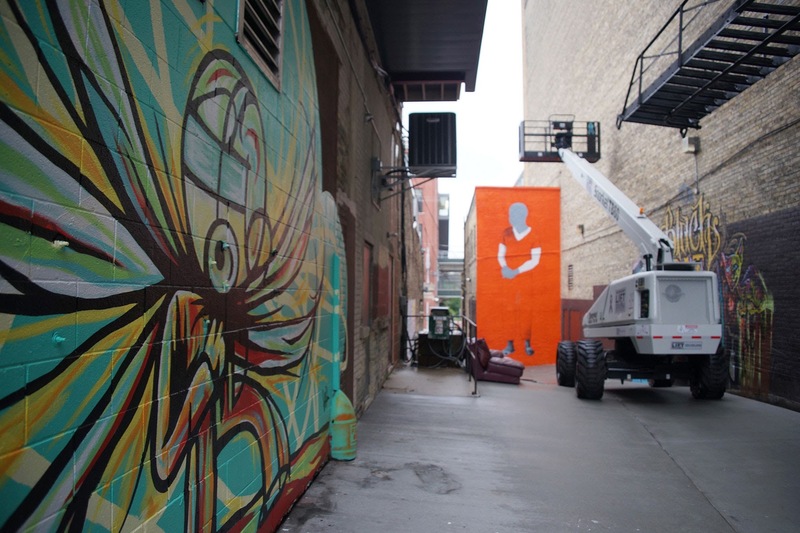 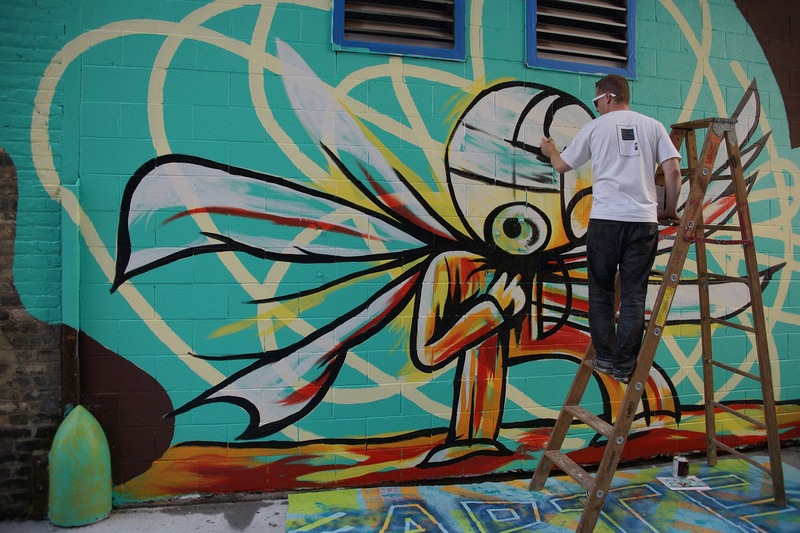 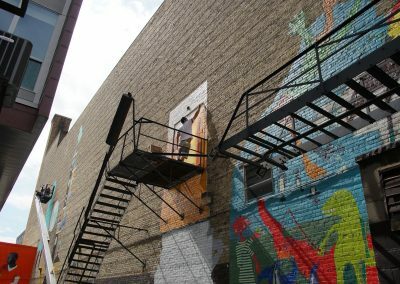 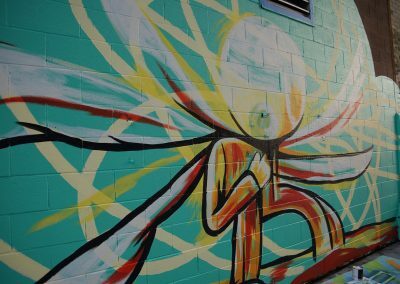 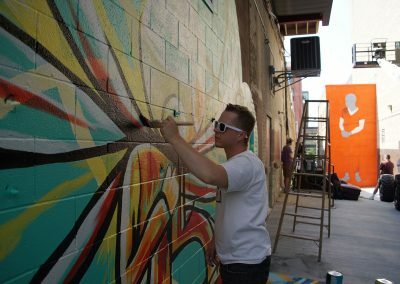 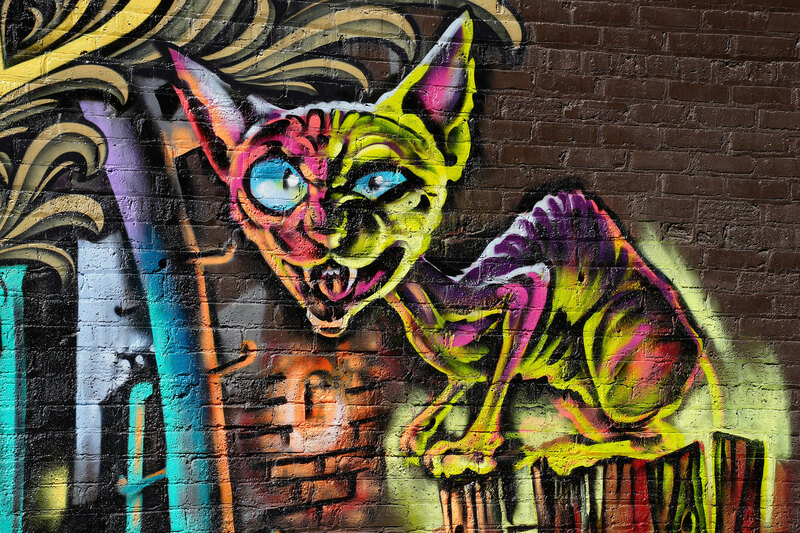 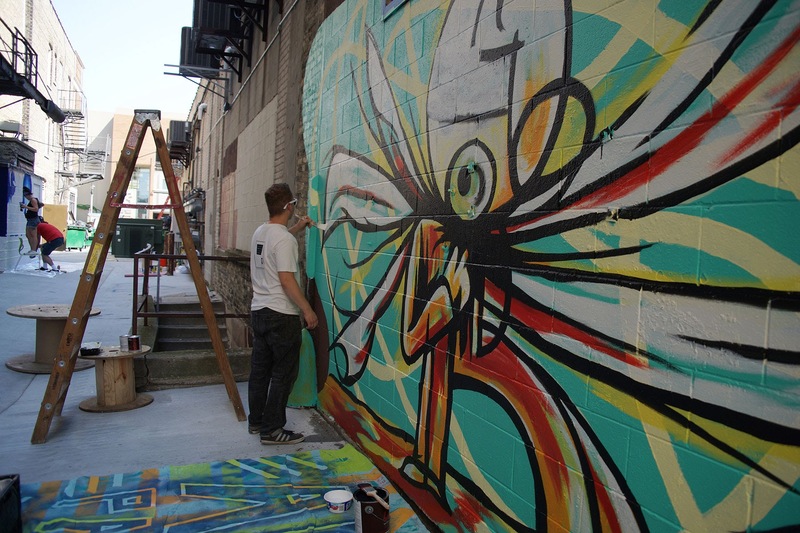 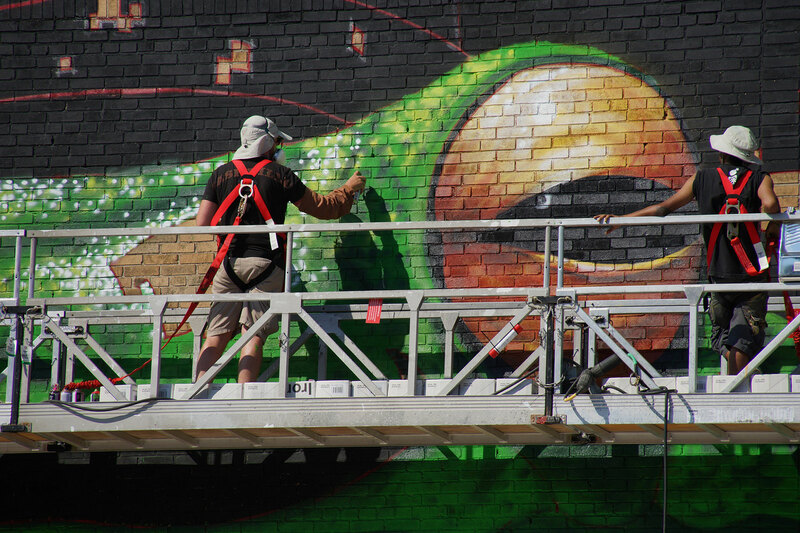 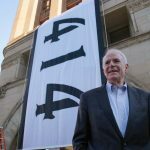 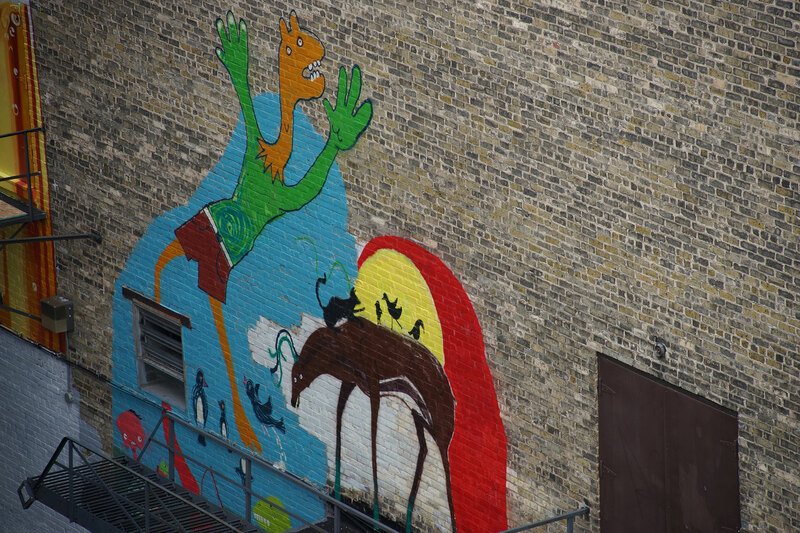 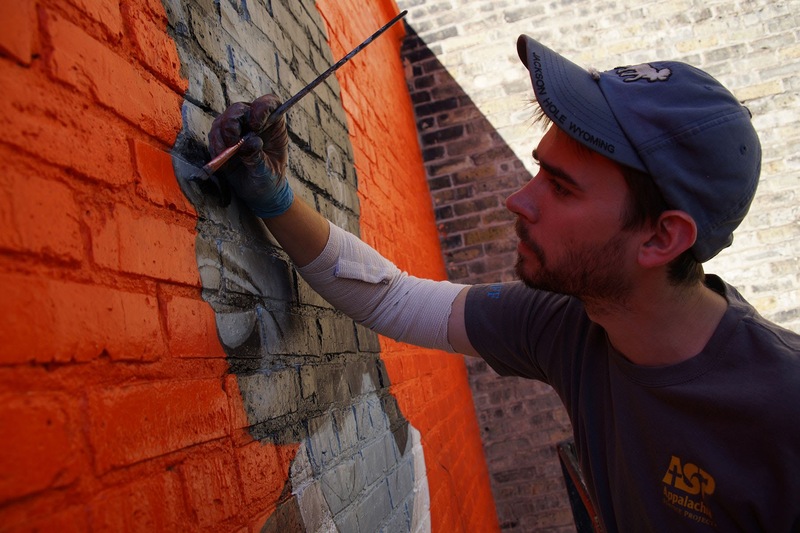 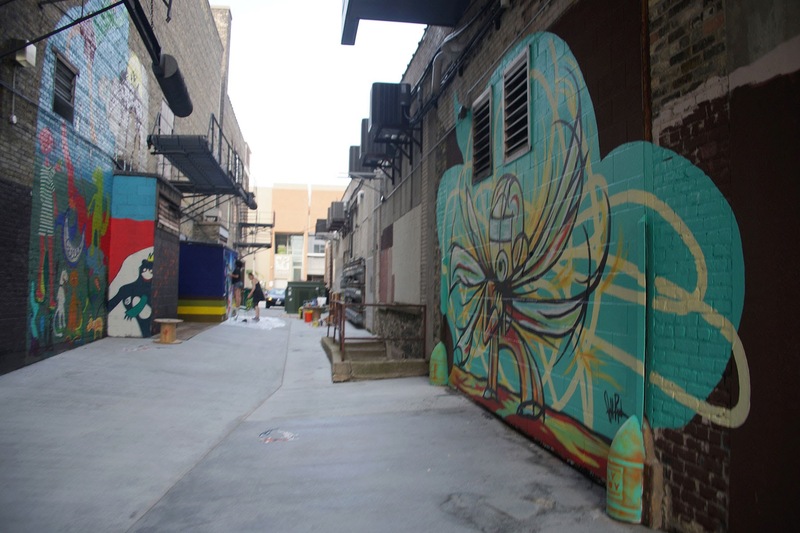 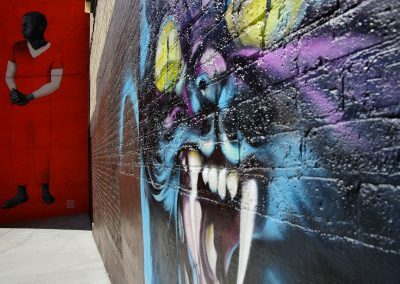 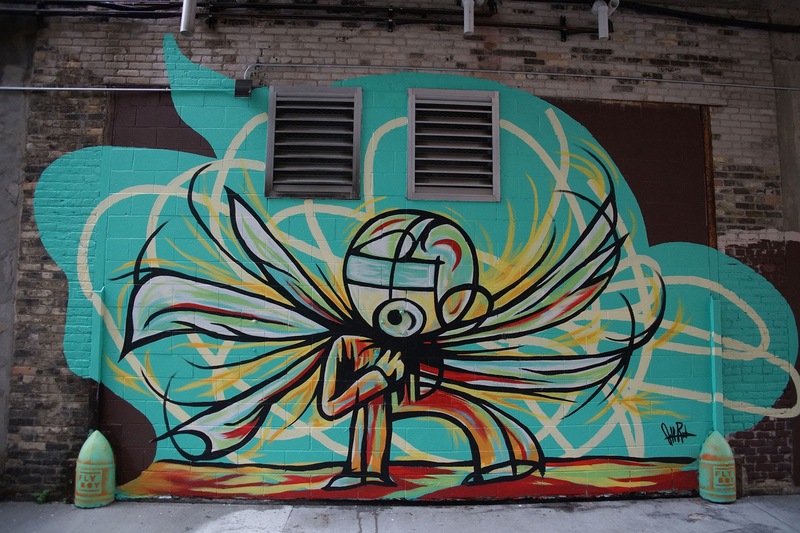 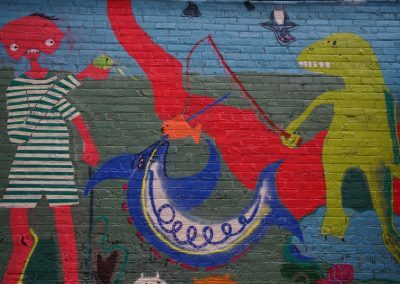 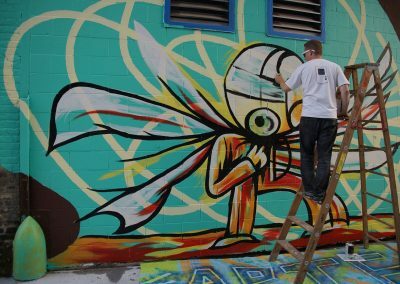 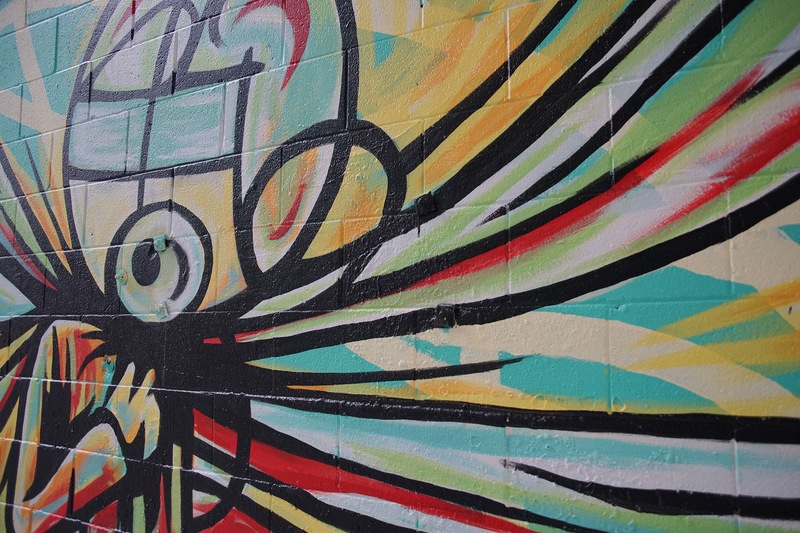 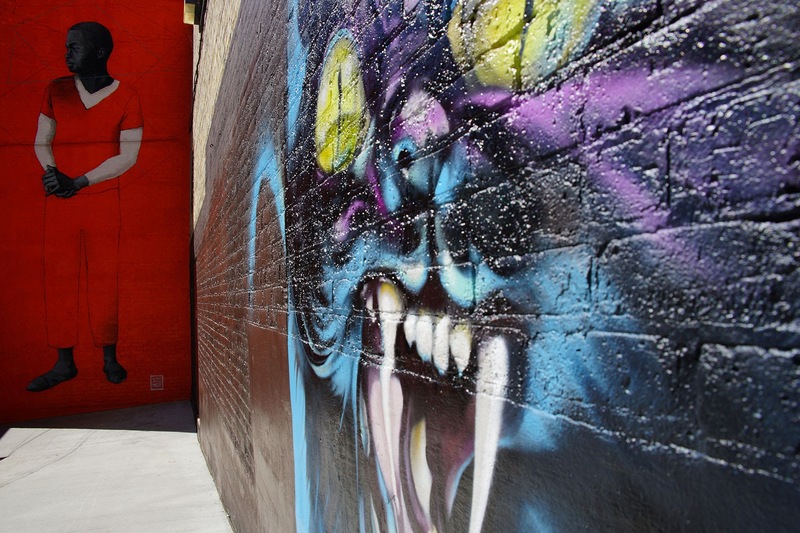 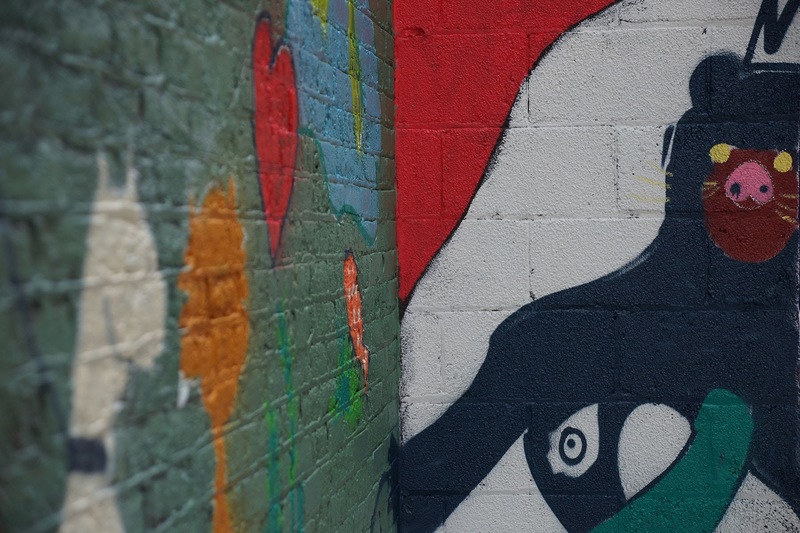 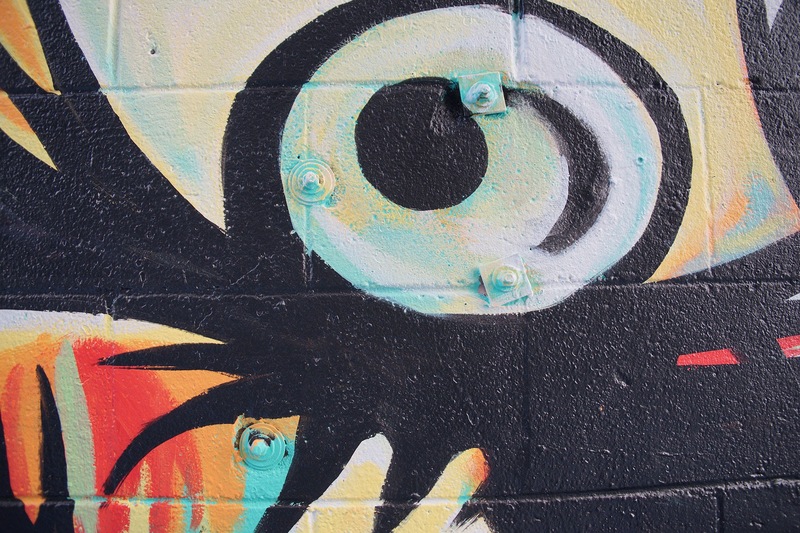 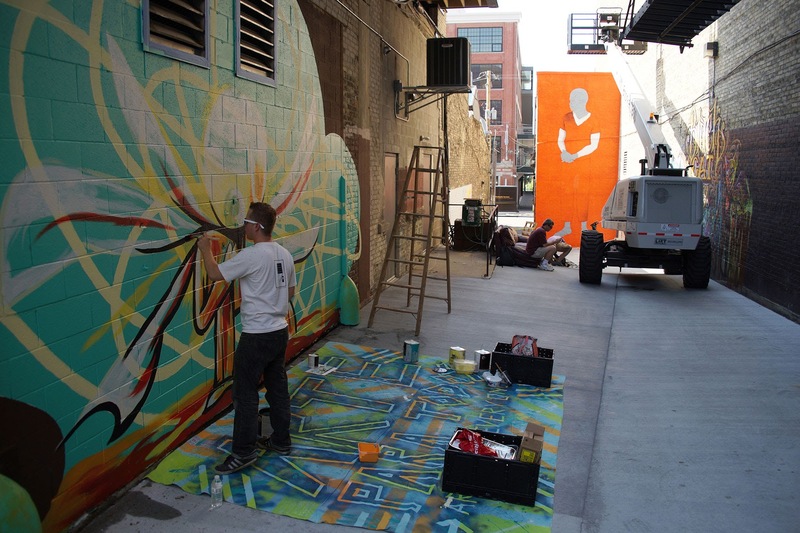 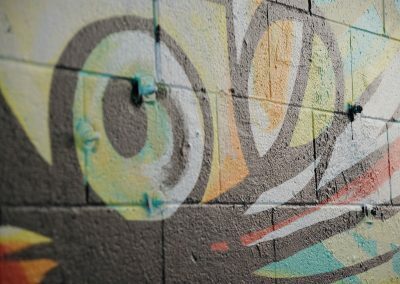 His mural, “Milwaukee’s BUG” was the first-ever piece of art commissioned for the Black Cat Alley.